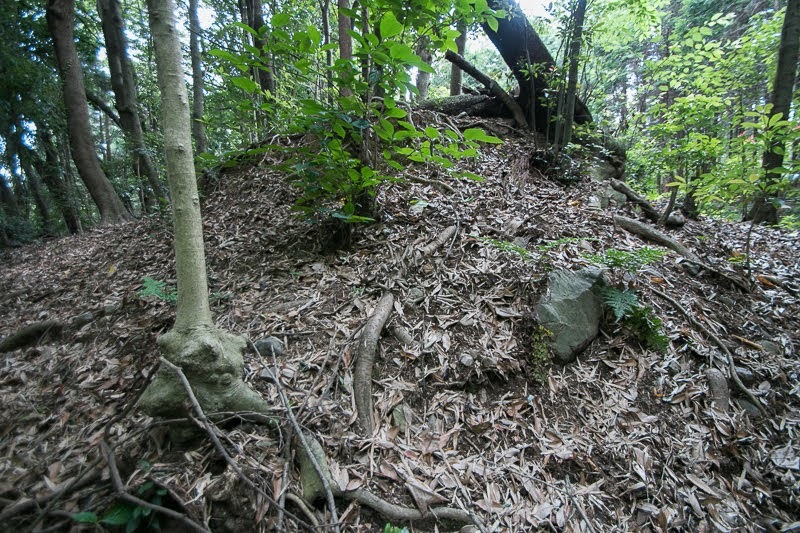 Mine castle (峯城) is built over a triangle shaped hill of about 50 meter height from hillside formed between Anraku-gawa river and its tributary Yajima-gawa river at 4 kilometer north from the center of current Kameyama city. 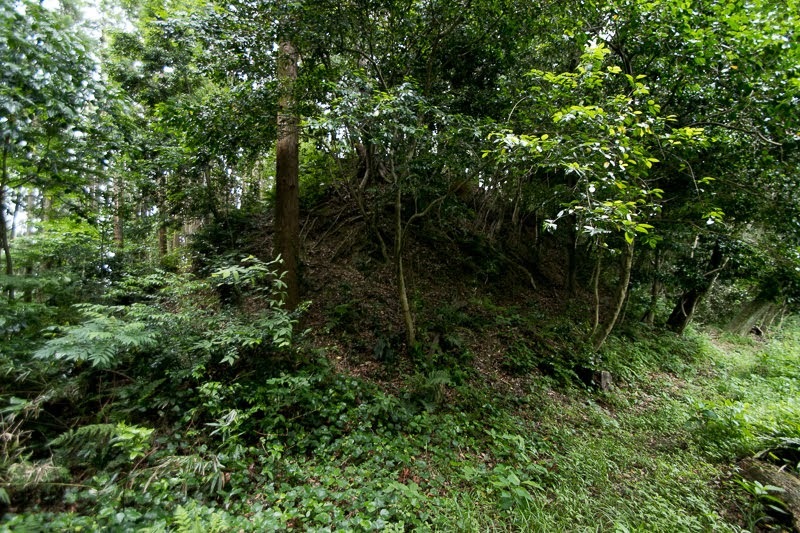 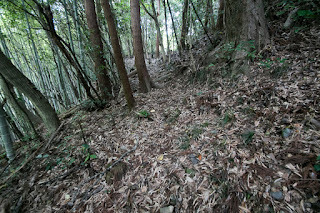 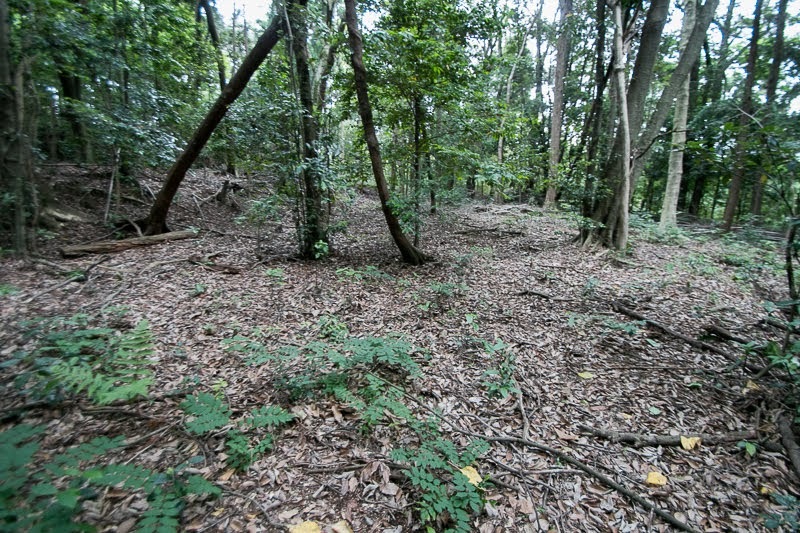 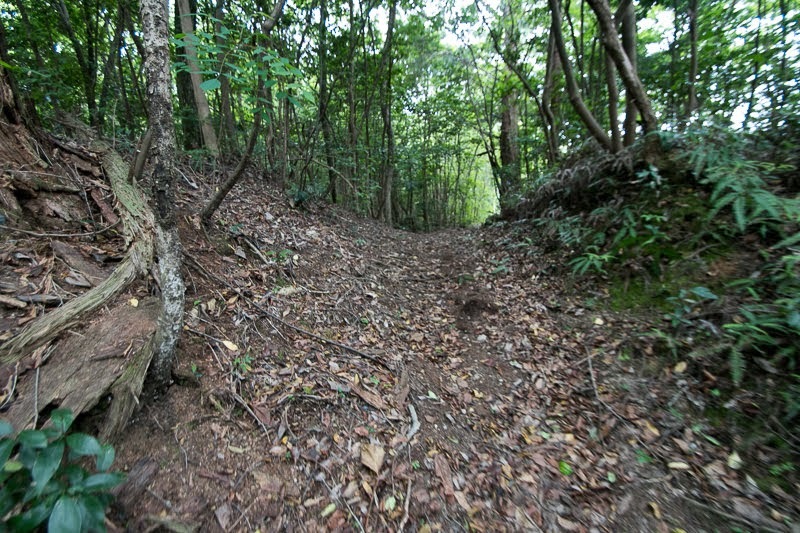 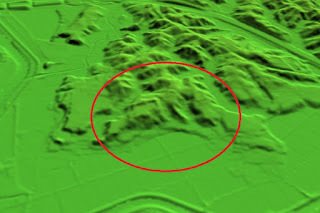 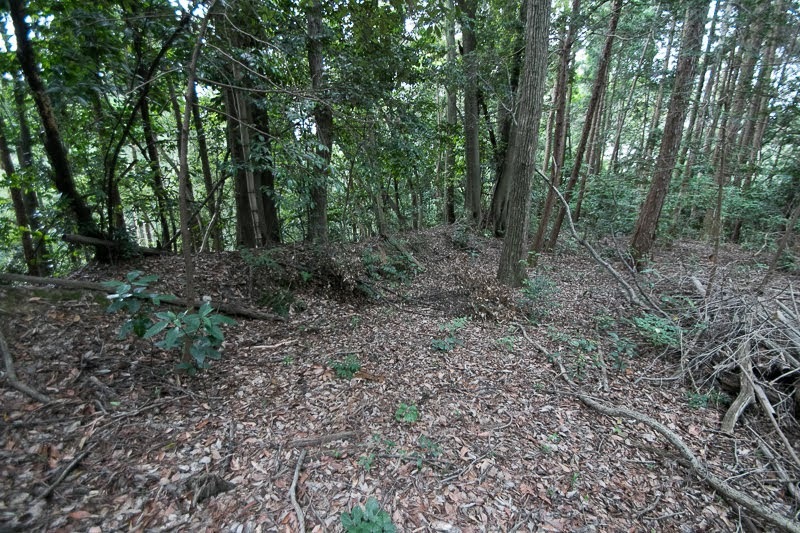 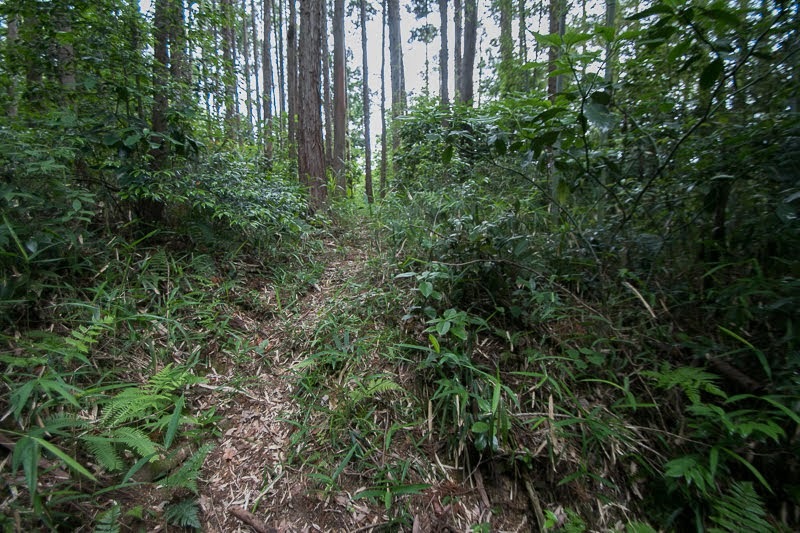 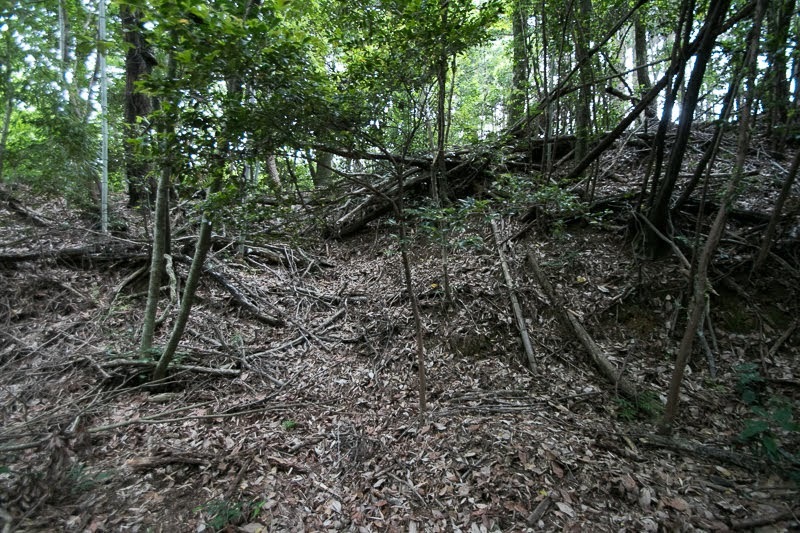 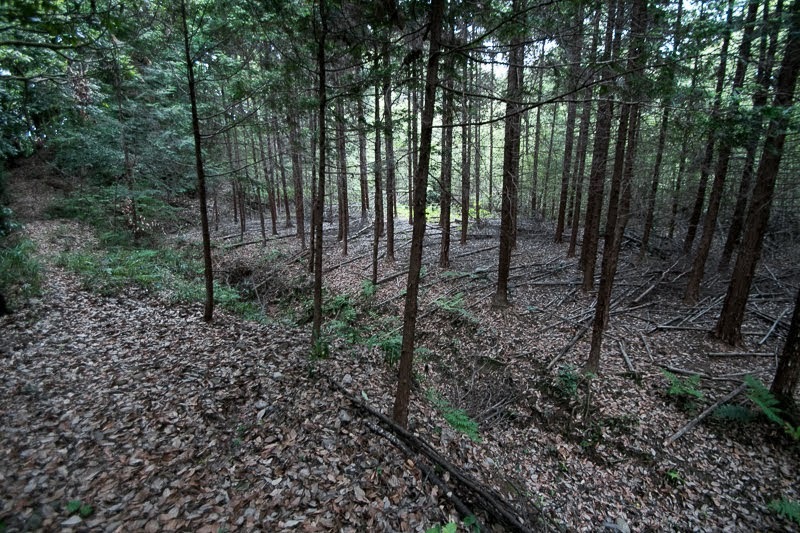 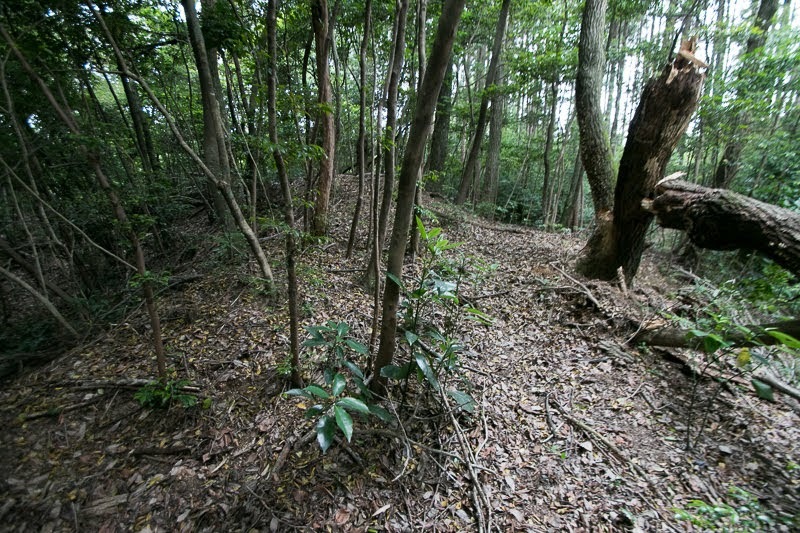 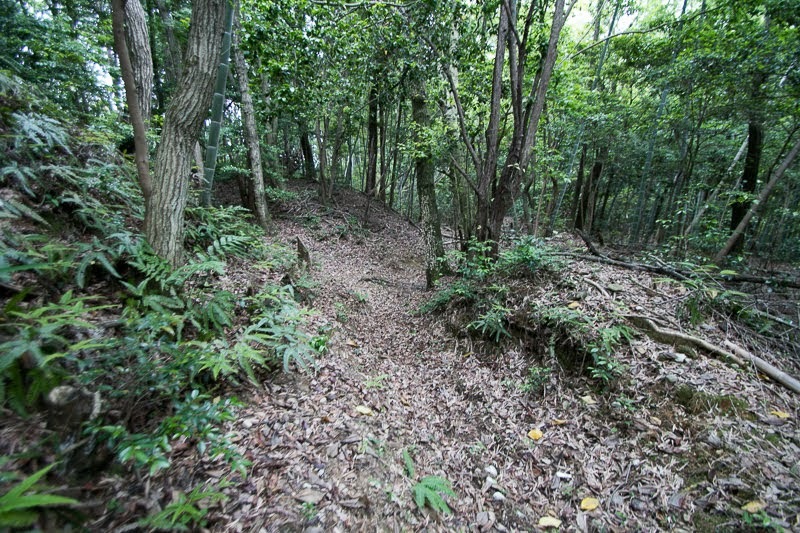 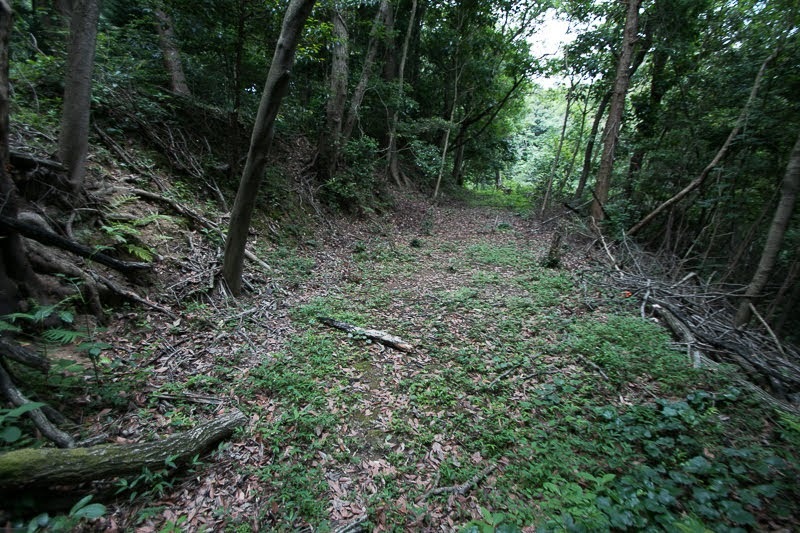 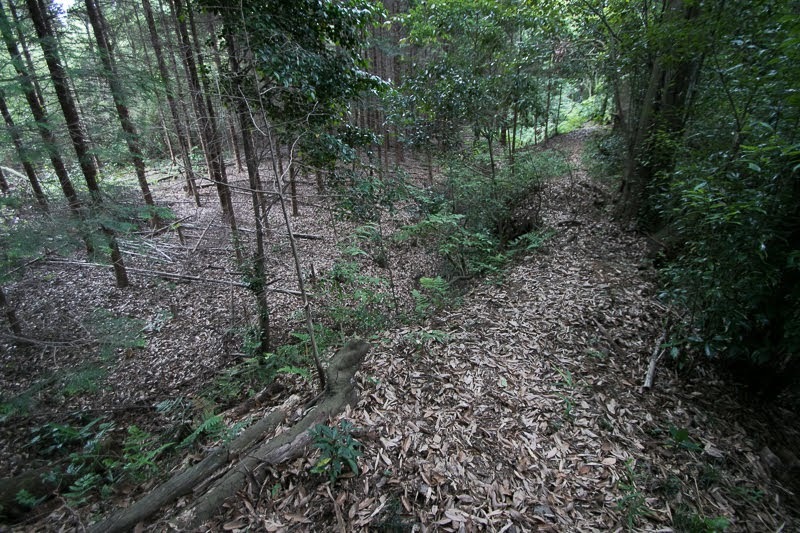 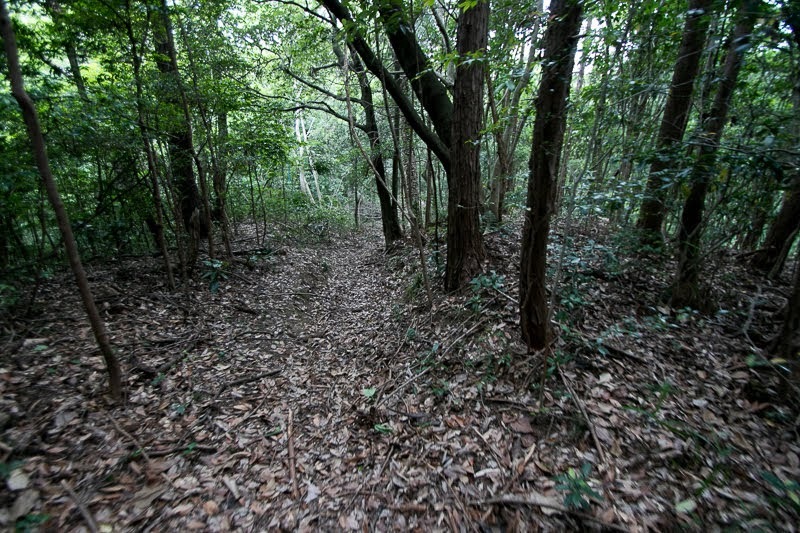 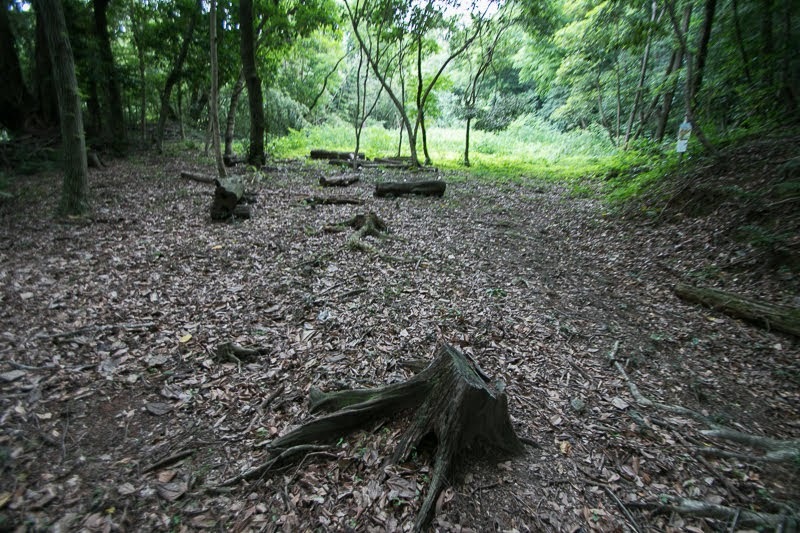 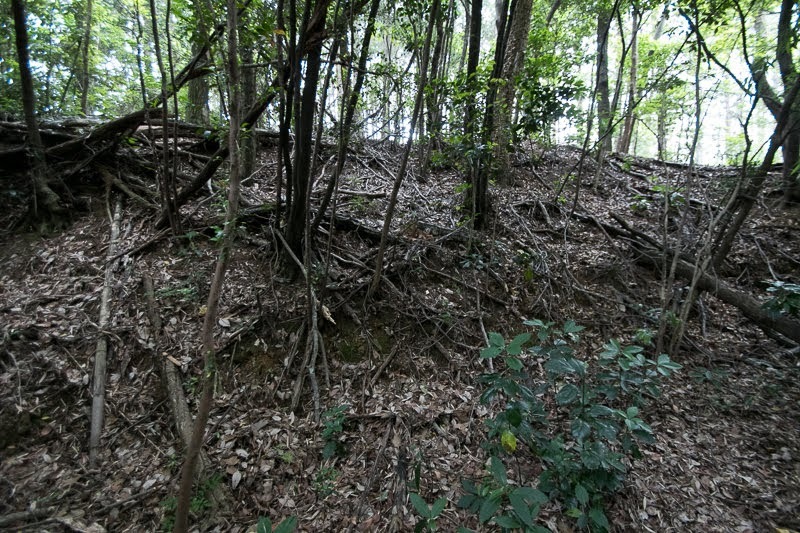 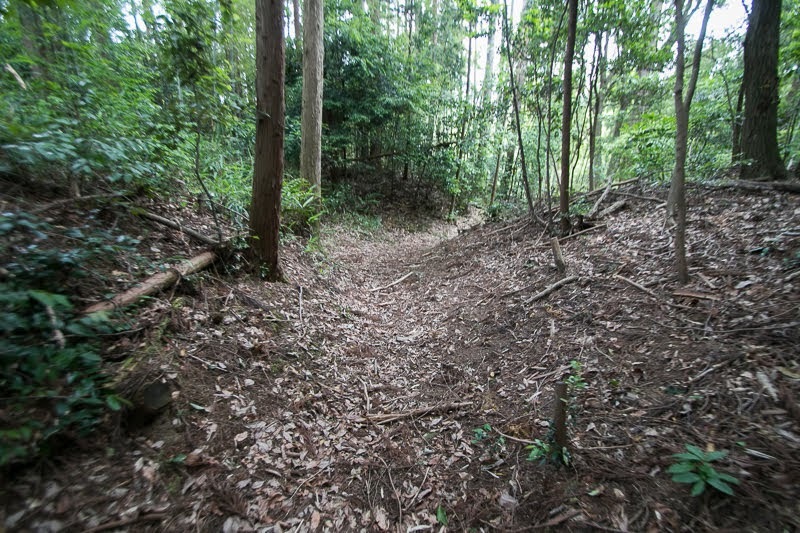 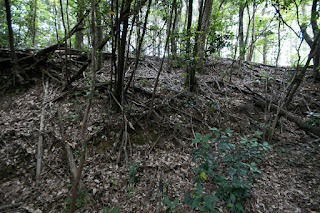 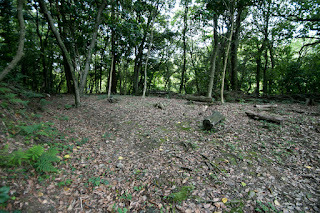 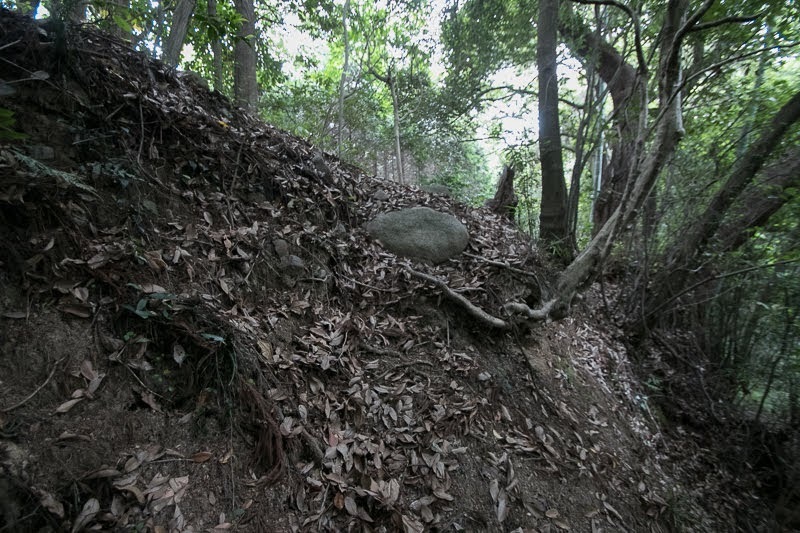 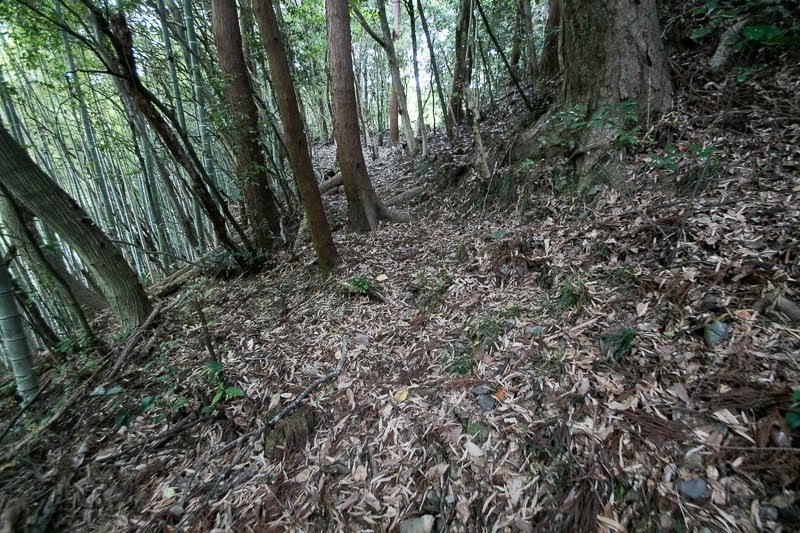 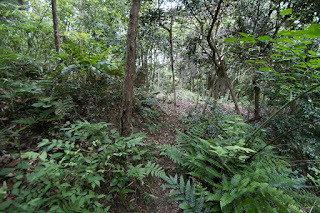 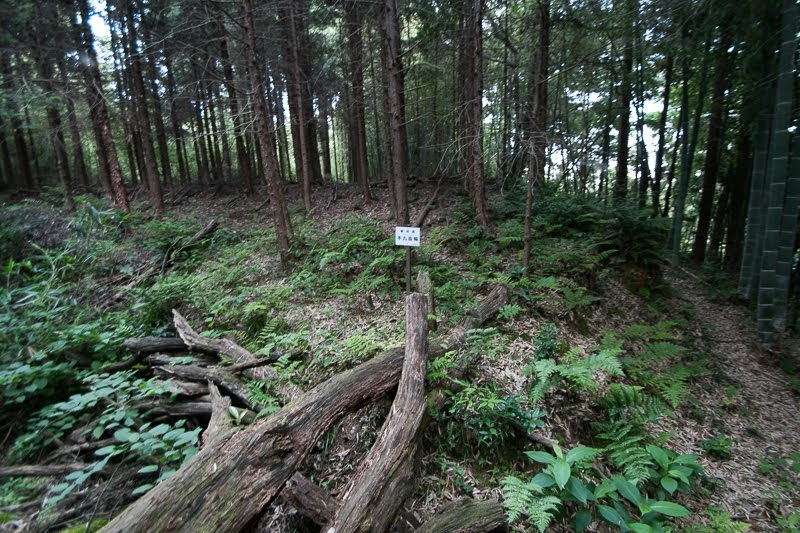 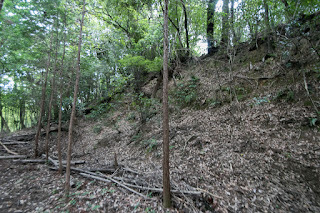 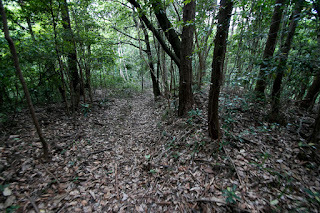 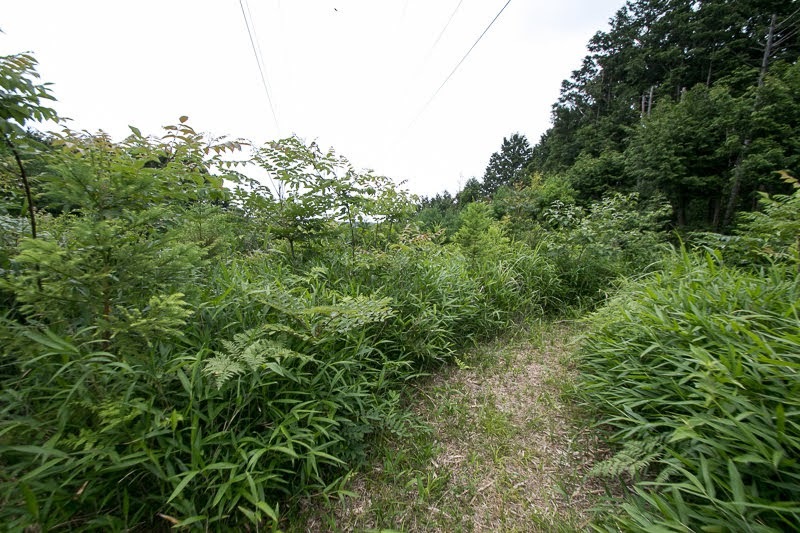 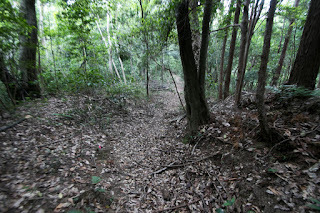 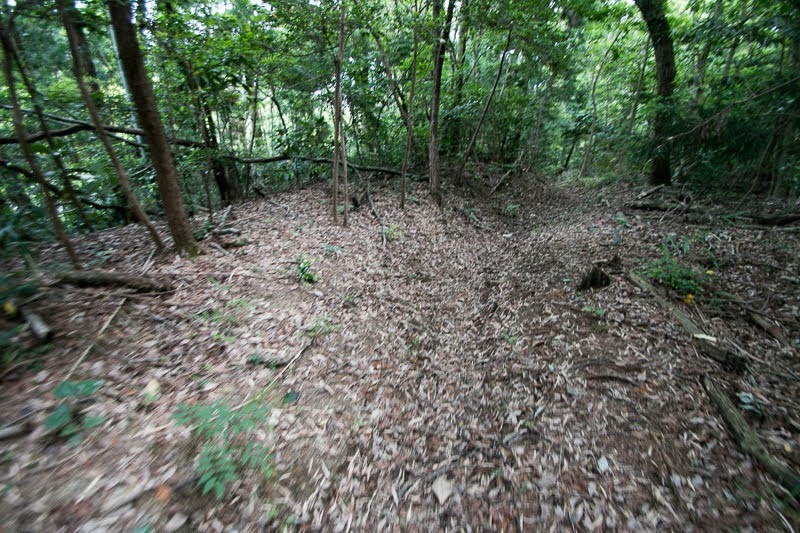 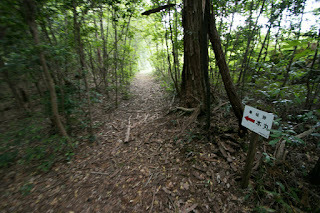 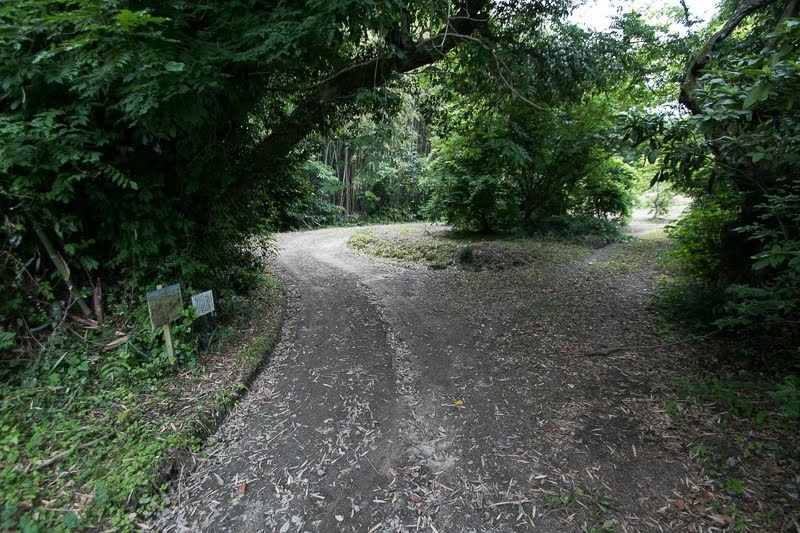 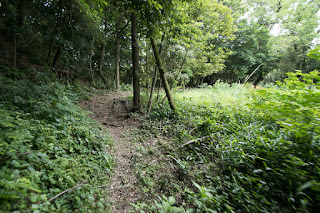 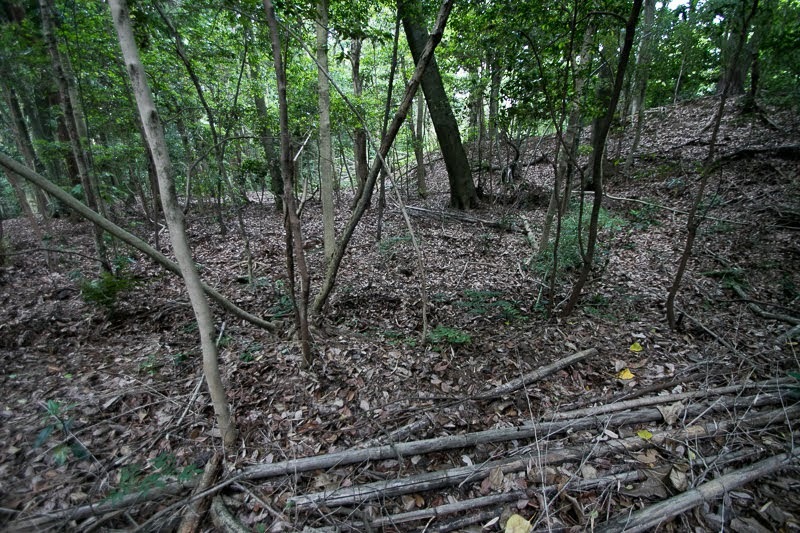 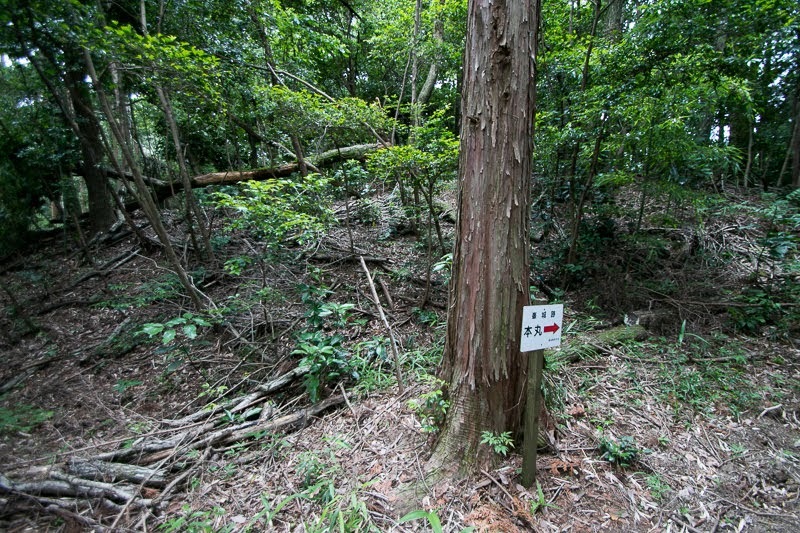 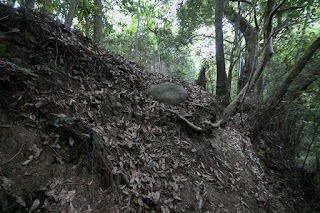 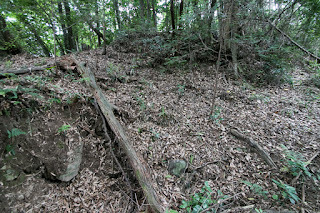 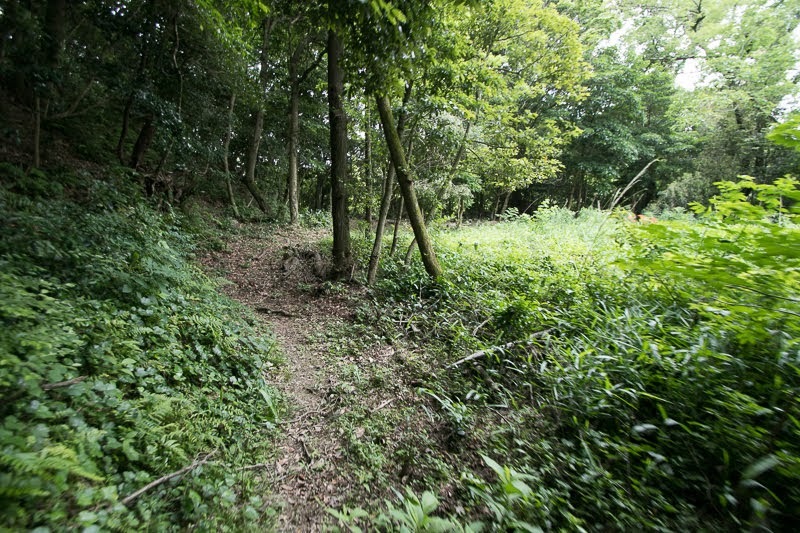 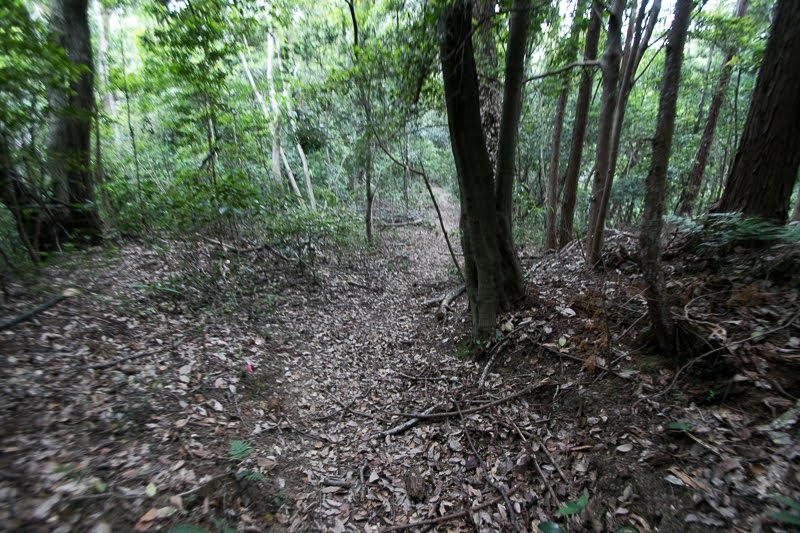 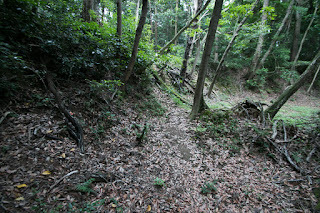 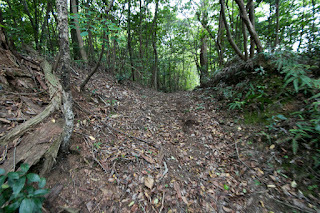 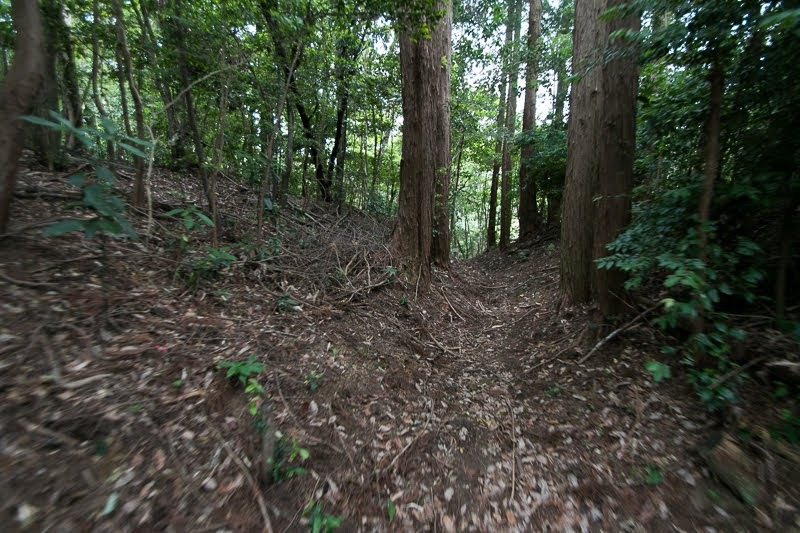 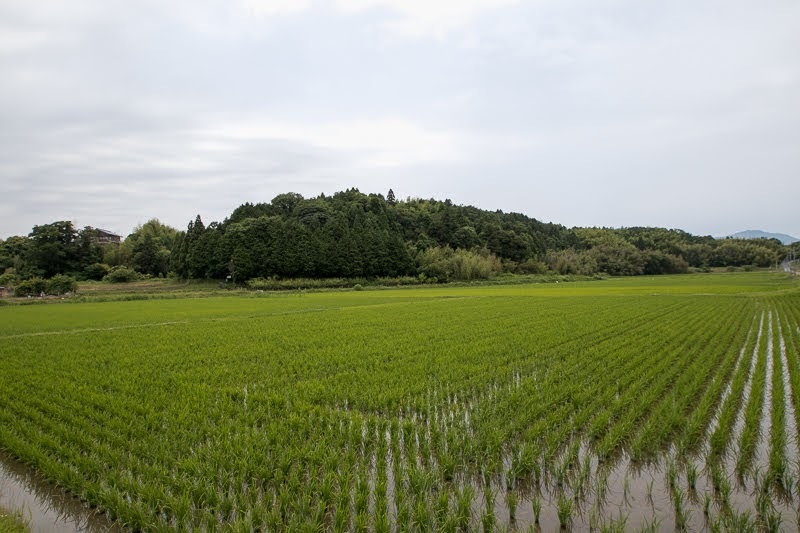 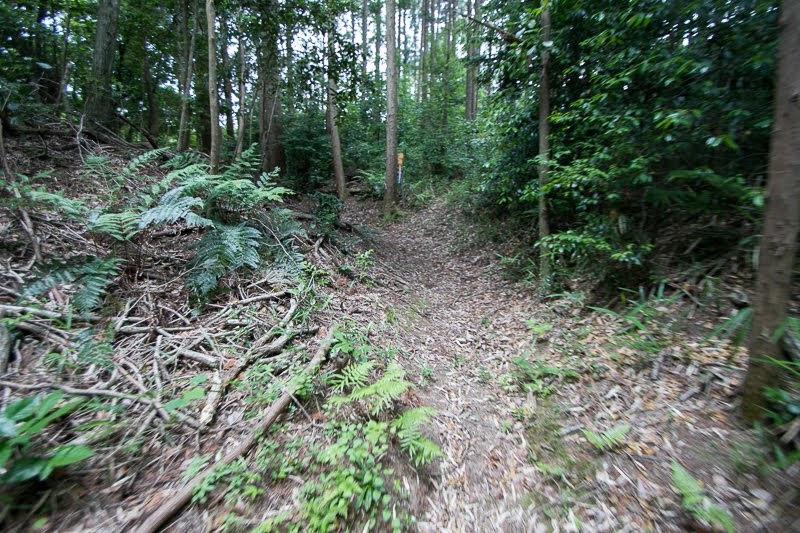 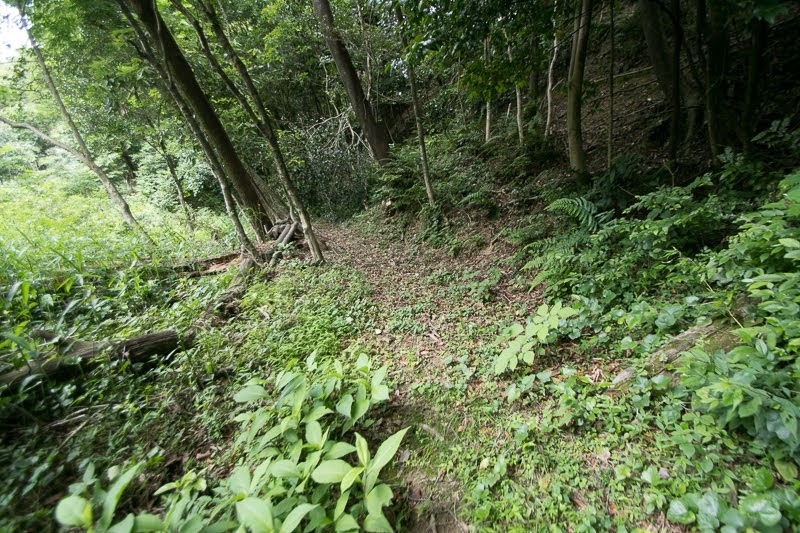 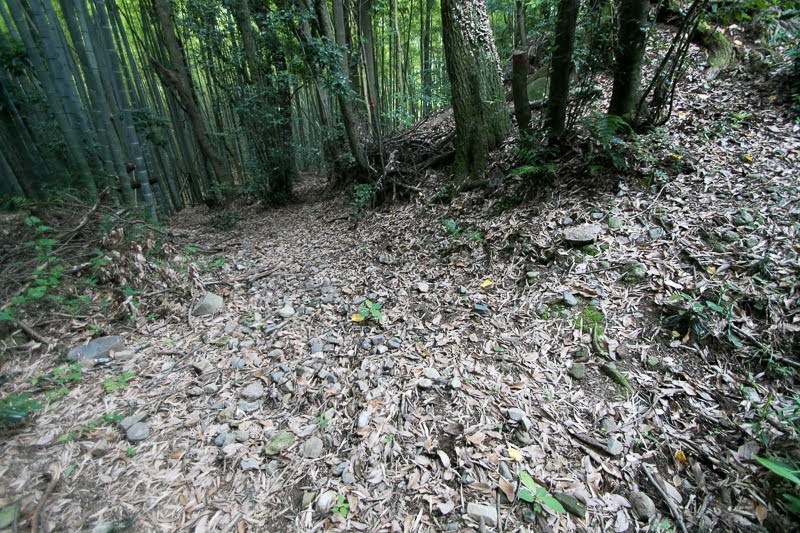 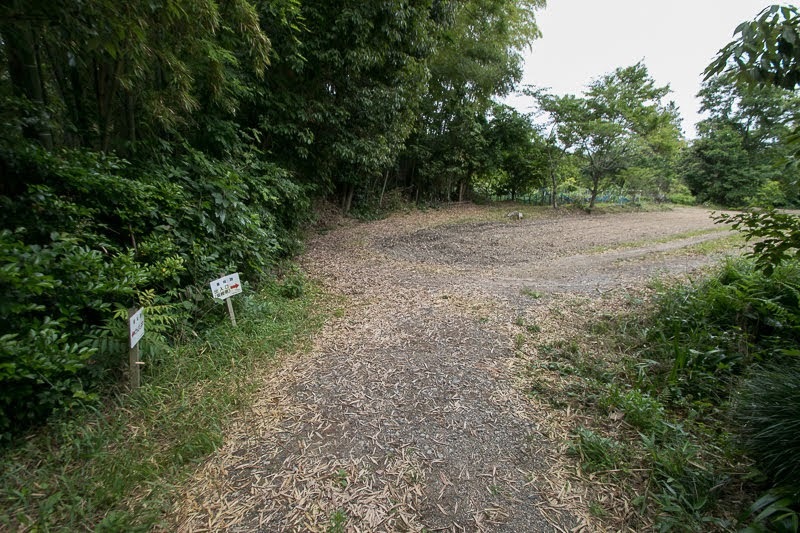 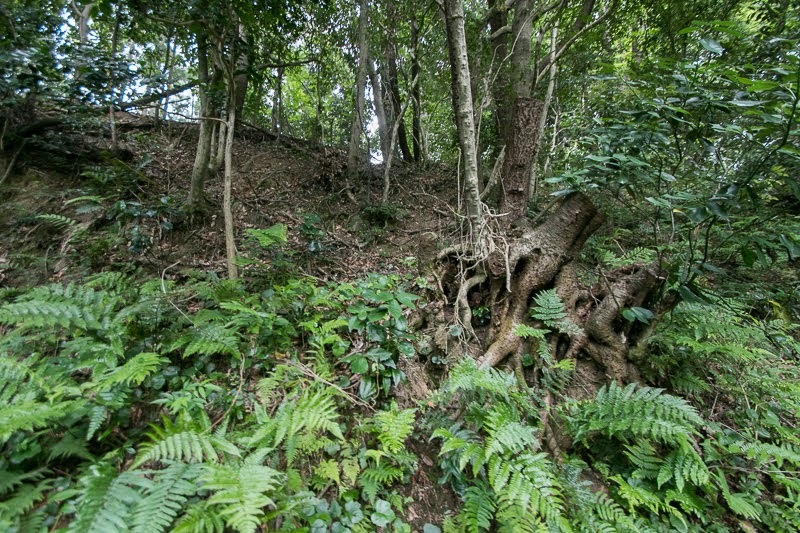 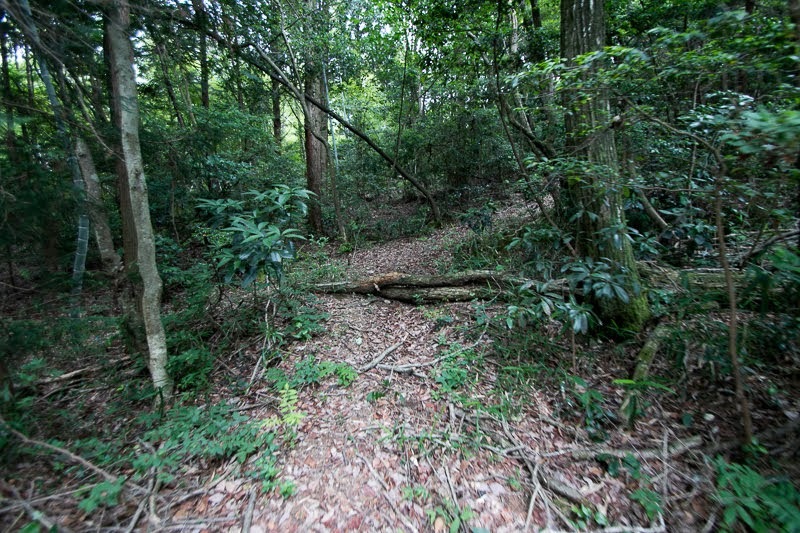 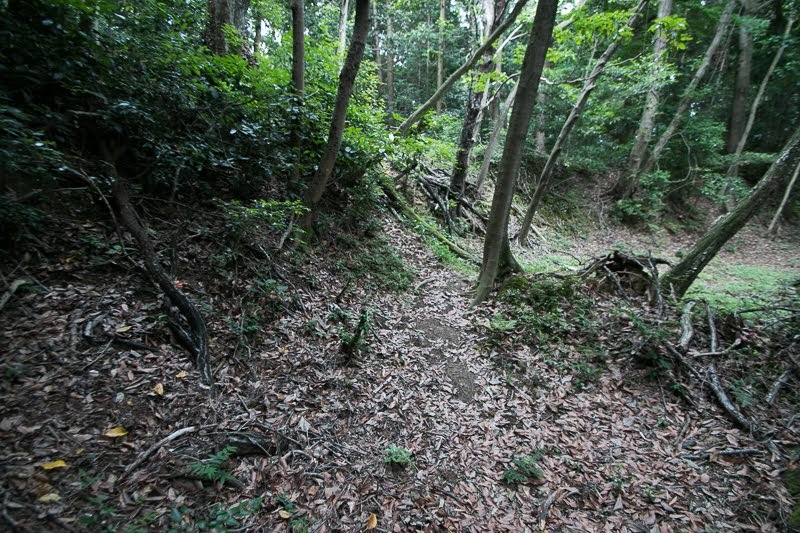 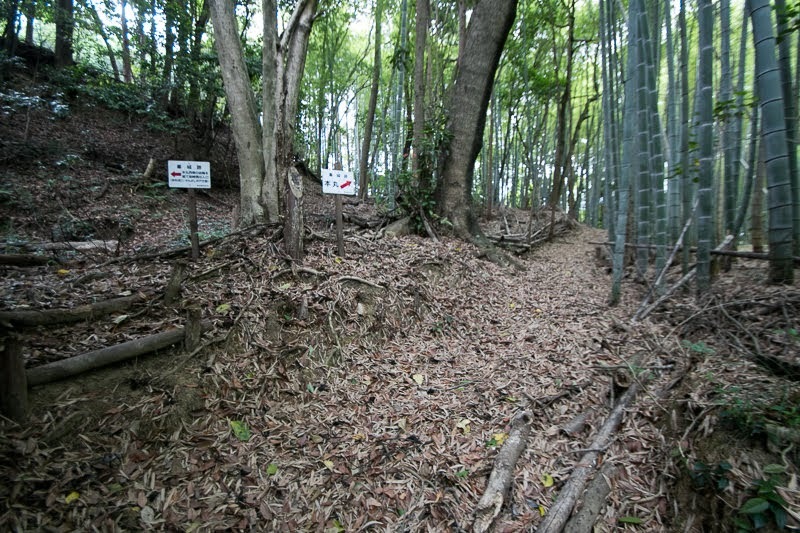 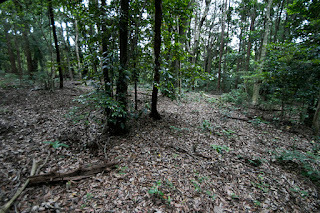 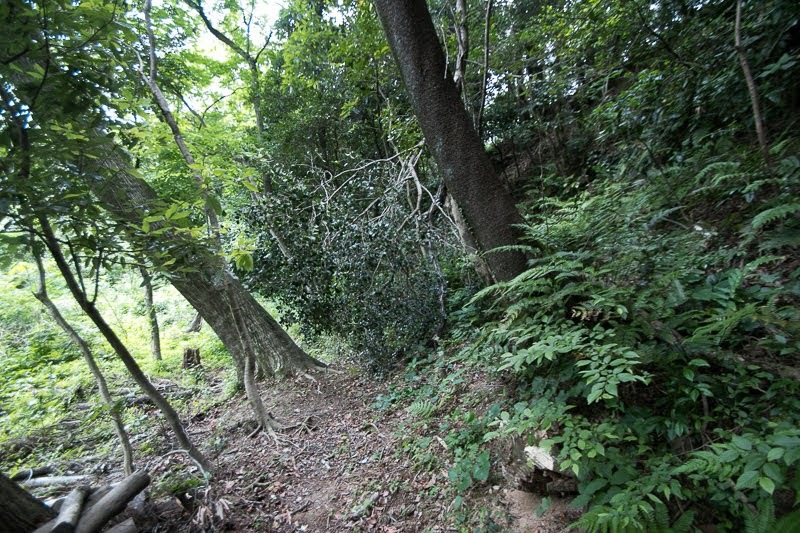 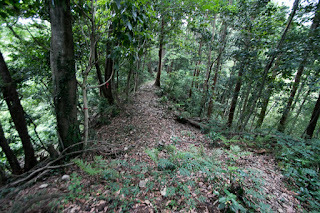 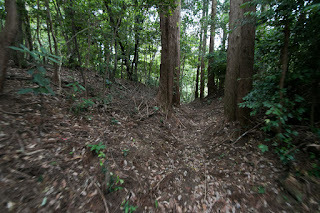 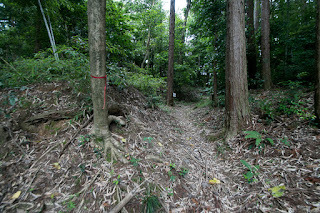 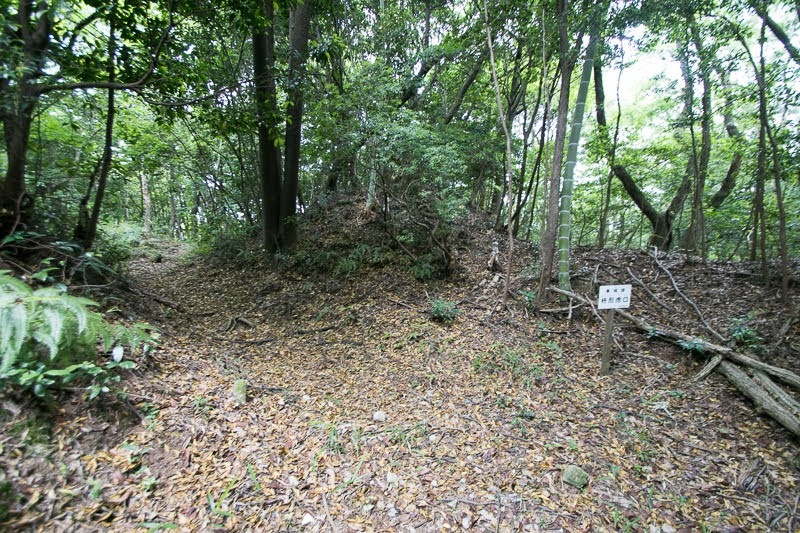 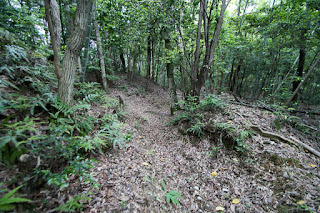 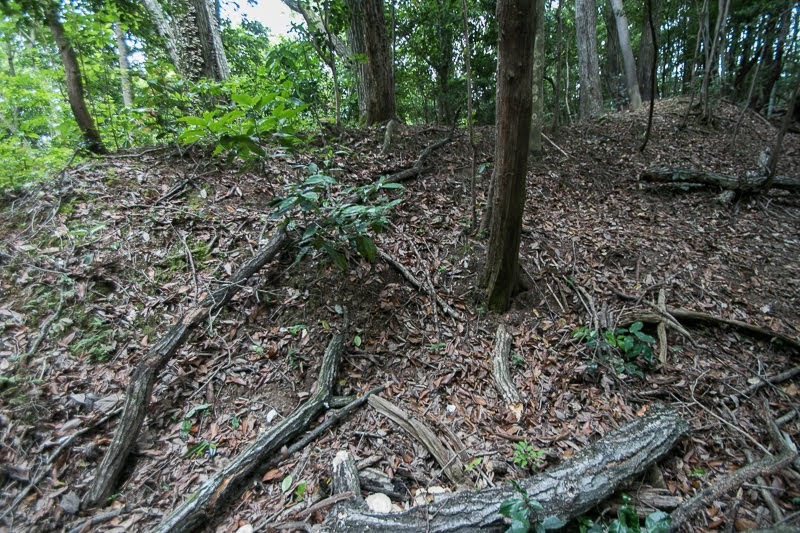 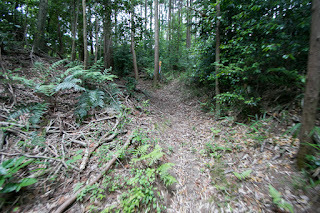 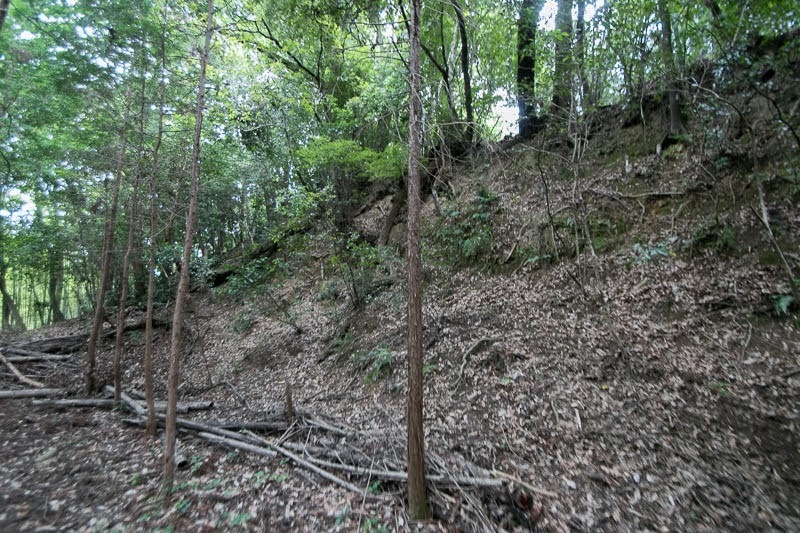 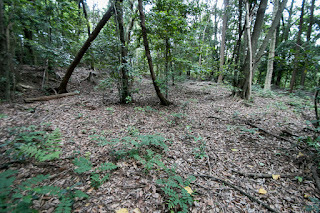 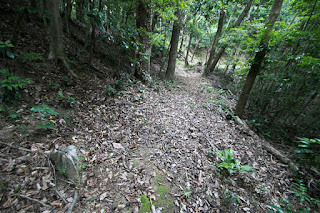 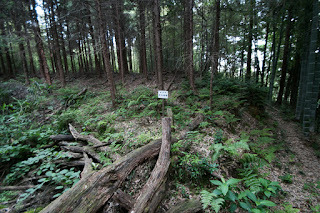 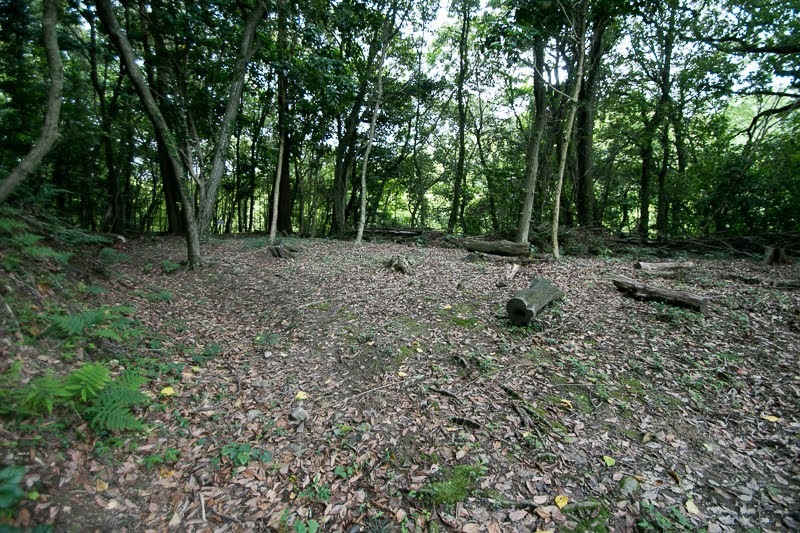 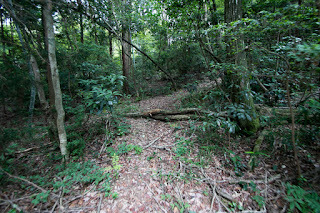 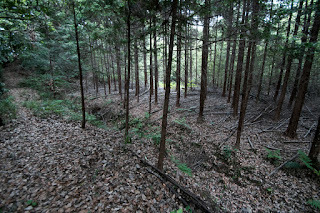 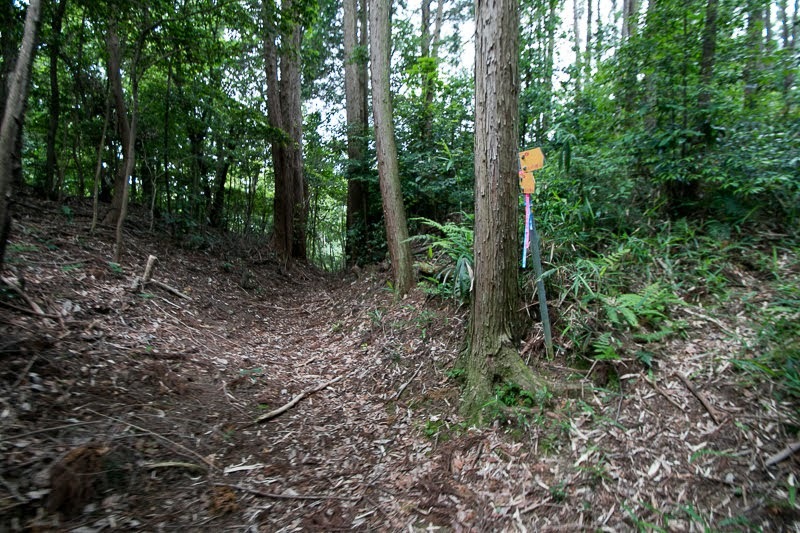 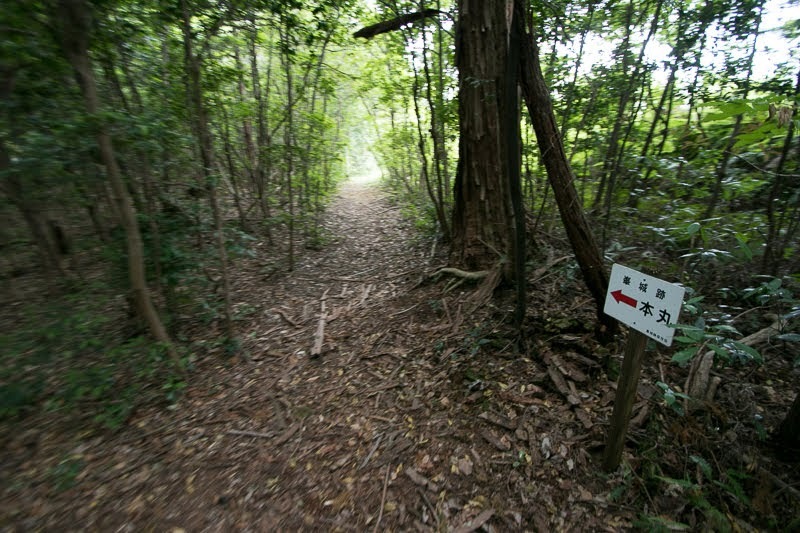 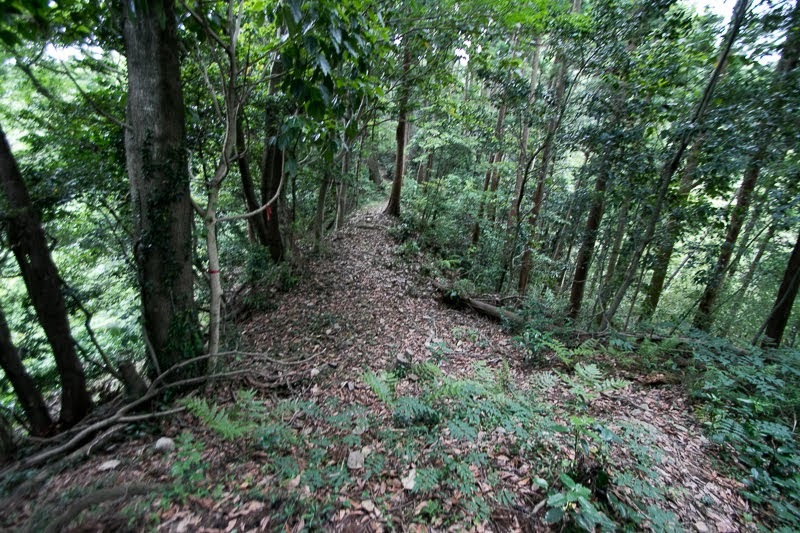 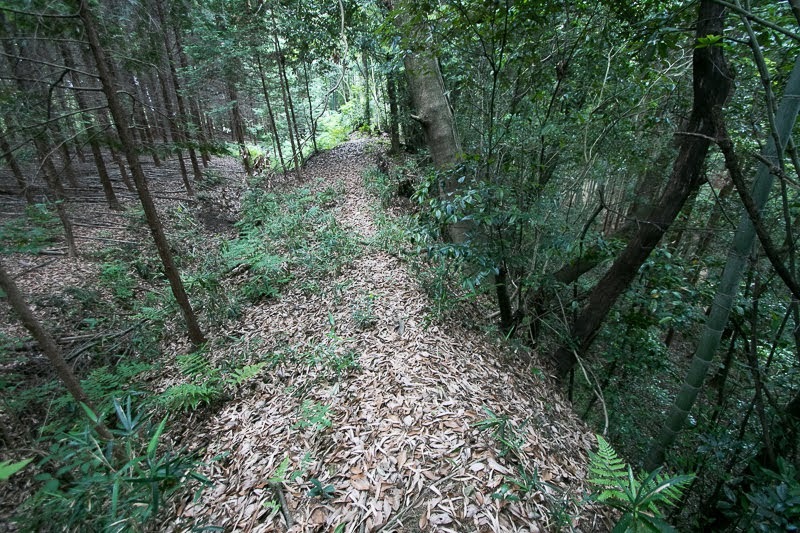 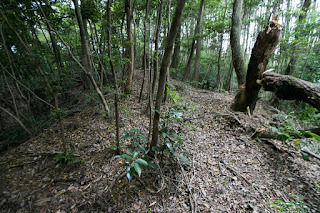 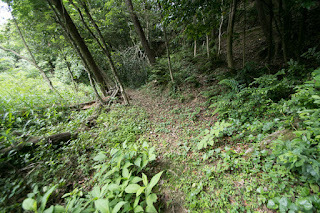 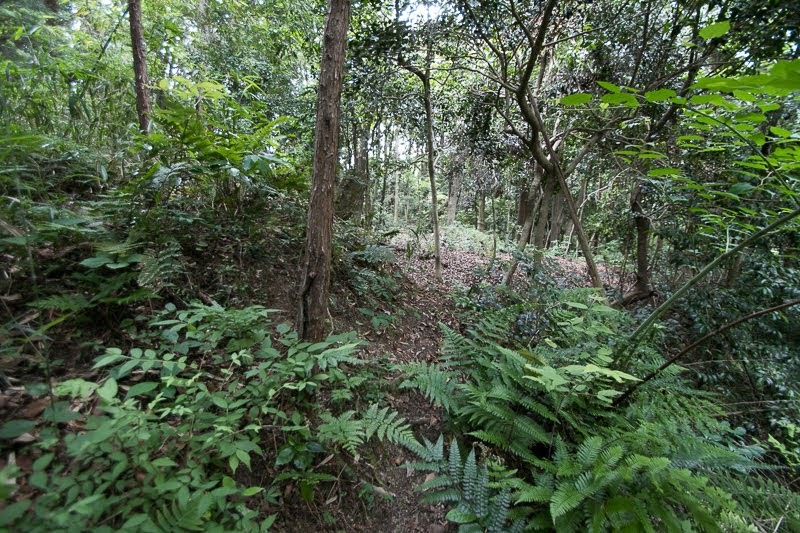 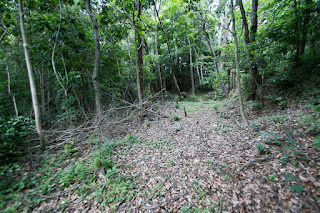 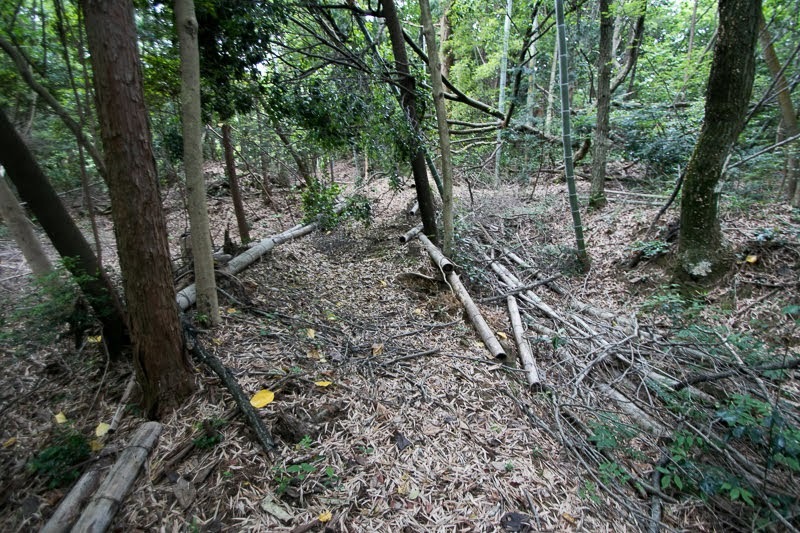 Castle site exist at the eastern edge of Suzuka mountain, the one spreads over 50 kilometer and separates current Mie prefecture and Shiga prefecture, also Tokai region and Kinki region. 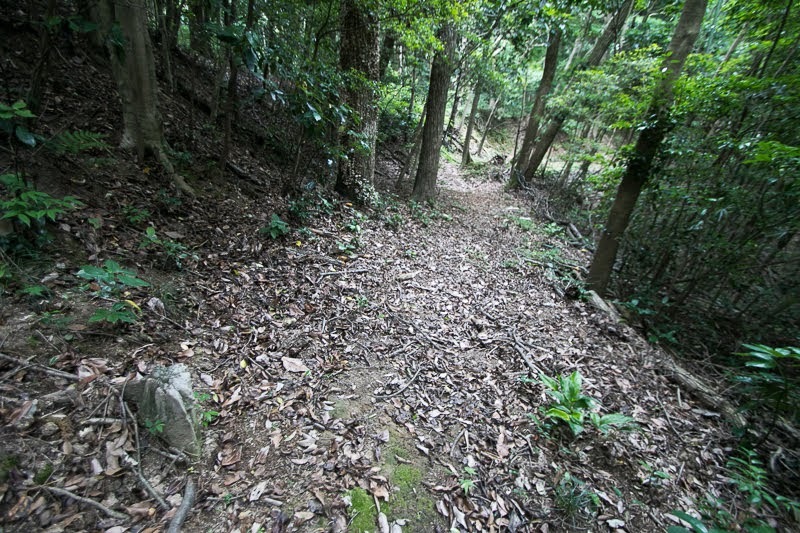 Tokaido road which start Kyoto city crosses Suzuka mountain by several routes such as Suzuka-Toge pass or Kabuto-pass, then turns north at current Kameyama city then proceeds narrow corridor between Suzuka mountain and Ise-wan bay toward current Aichi prefecture or Gifu prefecture. 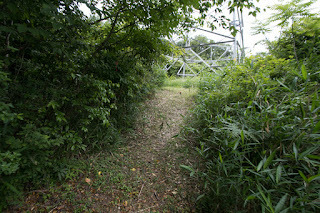 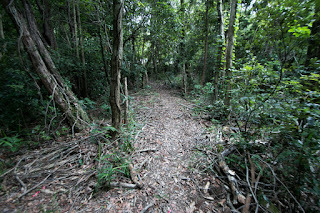 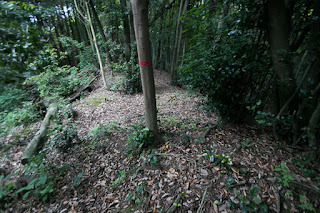 Thus this area becomes the target of cutting or connecting communication, in case of large size campaign. 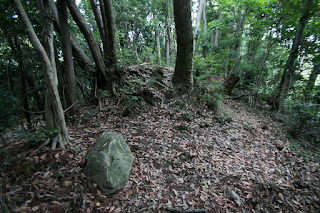 It is said that Mine castle was built by local lord Mine clan in 14th century. 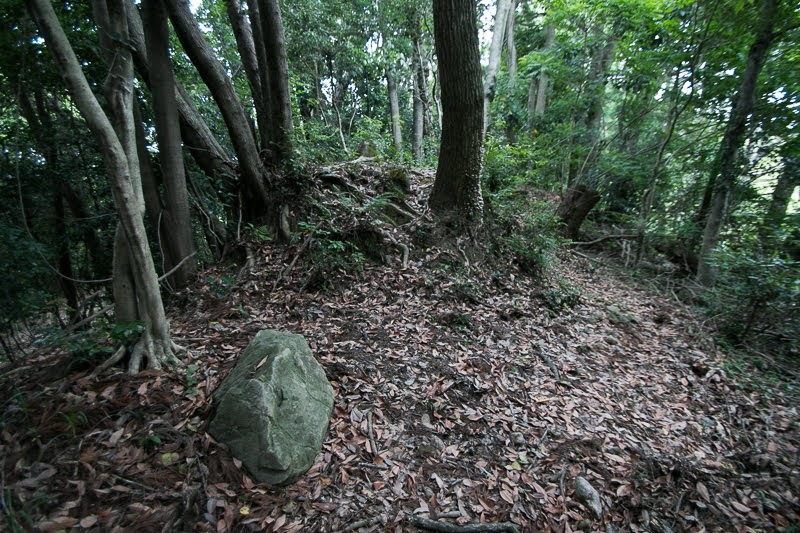 Mine clan was a branch family of Seki clan, a traditional lord of current Suzuka area. 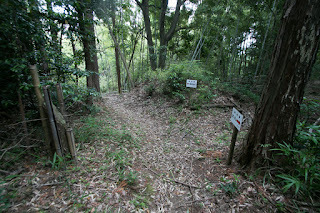 Seki clan was originally a descendant of Taira clan, but supported Kamakura Shogunate established by their rival Minamato clan and became its retainer. 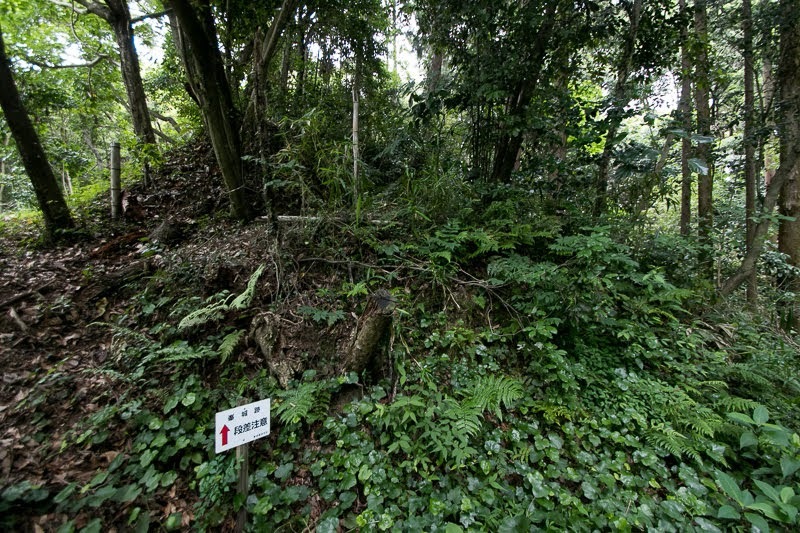 After the fall of Kamakura Shogunate, Seki clan supported the South Court, and became the retainer of Kitabatake clan which became the governor of Ise province under the support of the South Court. 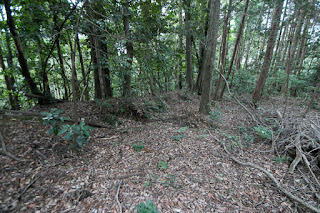 Later Kitabatake clan turned to Muromachi Shogunate and Seki clan also followed to this. 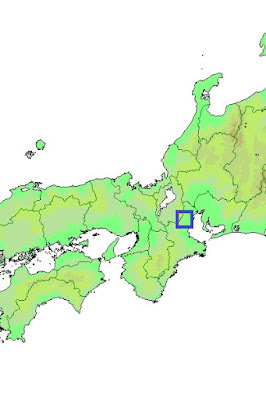 Seki clan divided their territory to branch families including Mine clan. 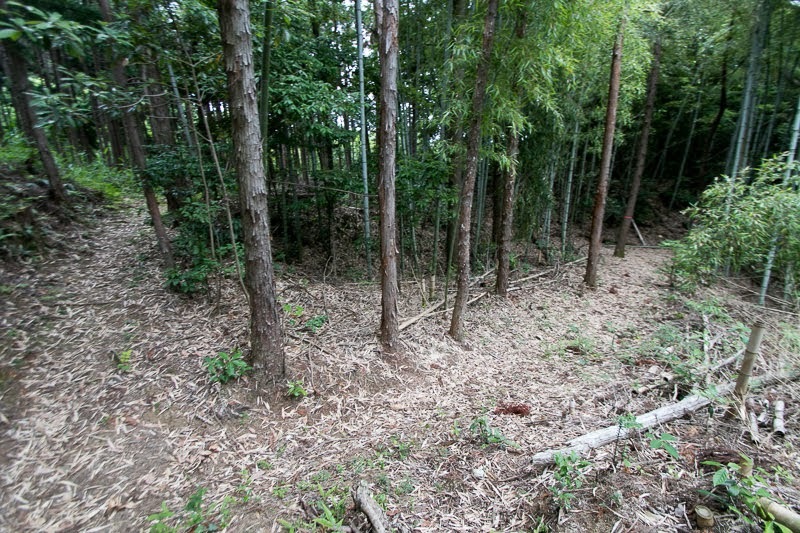 Mine clan gradually grew to the major lord of the area and managed hill area in the north part of current Suzuka city and Kameyama city. 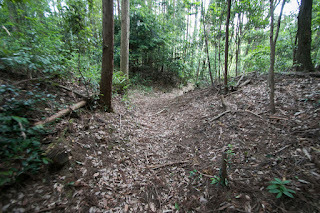 In the middle of 16th century, at the intrusion of Nobunaga Oda (1534-1582), the warlord of Owari province (western half of Aichi prefecture), Seki clan and its tributaries were forced to follow to Nobunaga but lost their leaders at the battles under Nobunaga then declined. 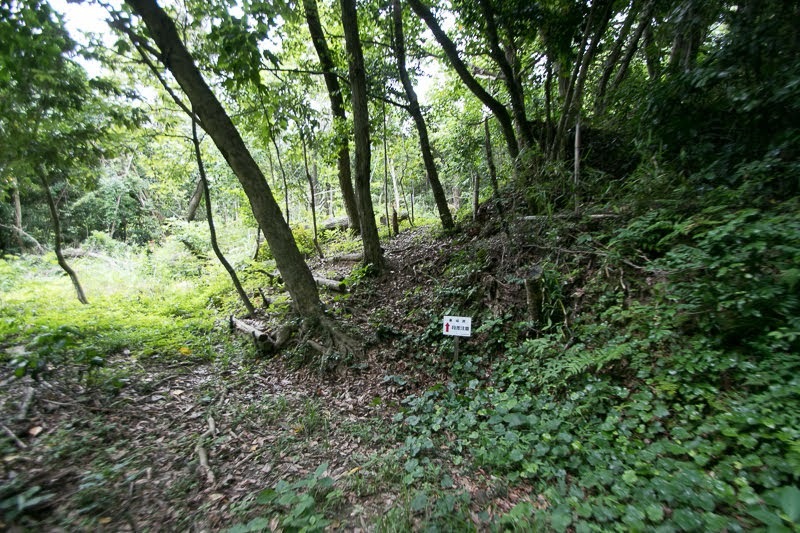 After the fall of Seki clan, Kameyama area became the territory of Nobutaka Oda (1558-1583), the third son of Nobunaga who succeeded the name of Kanbe clan and reside at Kanbe castle at current Suzuka city. 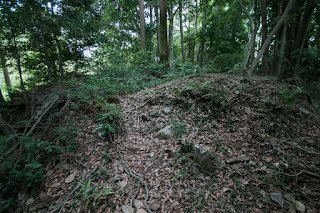 Around this time Mine castle might be kept by Yoshikatsu Okamoto (?-1600), one of the important retainer of Nobutaka. 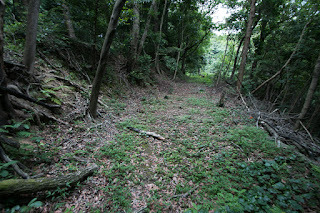 Around this time there were three castles it mean Seki castle, Kameyama castle and Mine castle around this area, and each controlled three mountain roads which cross Suzuka mountain by Kabuto pass, Suzuka toge pass and Anraku pass. 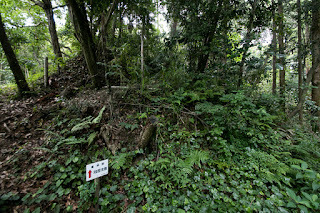 Nobutaka was placed at an important place to connect Owari province, the original territory of Oda clan and Kyoto city, along with Gifu castle held by Nobutada Oda (1555-1582), the eldest son of Nobunaga. 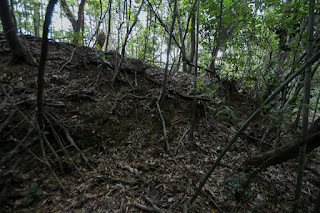 Mine castle spreads over a triangle shaped hill of about 500 meter long, the two line is protected by rivers and its root is separated by a valley except for its northeastern edge. 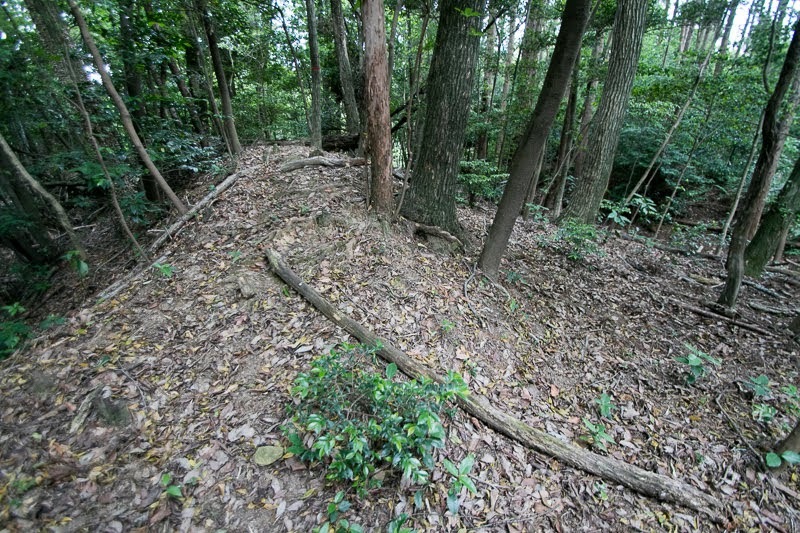 Central area of the castle is a well shaped rectangular one of 100 meter long and 50 meter wide, which has a tall clay wall at its western line. 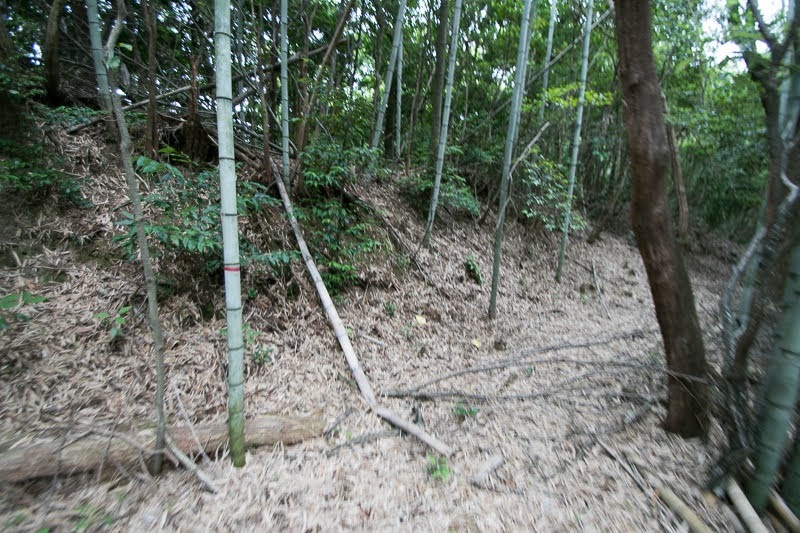 At the middle of this huge clay wall there is a basement of building with the remnant of stone wall, where a two or three layer main tower might be built on that. 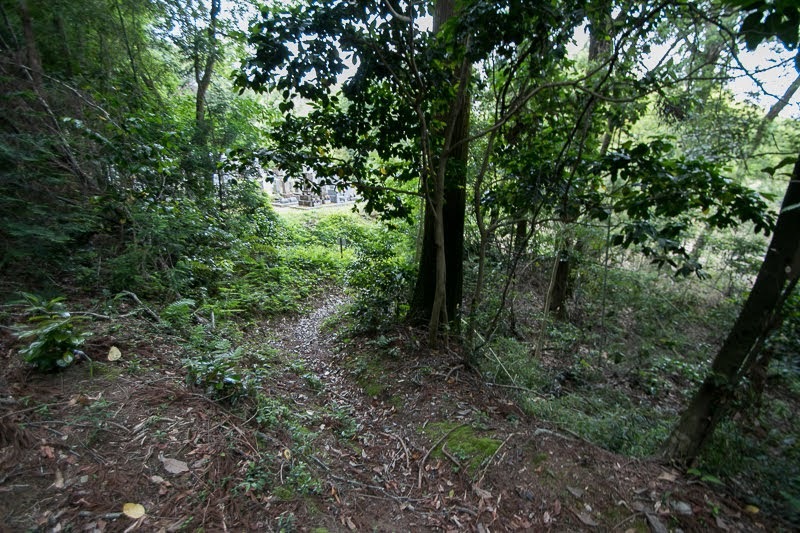 Central area is wholly surrounded by corridor terrace which is connected to outer areas at the south or west of central area. 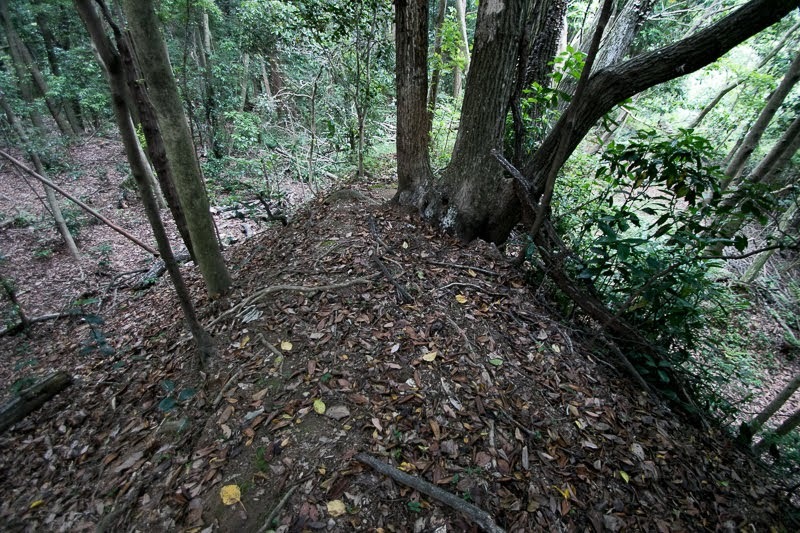 As the north side is expected approach line of enemy, this direction is securely protected by combinations of dry moats and clay walls built at the bottle neck of terrain. 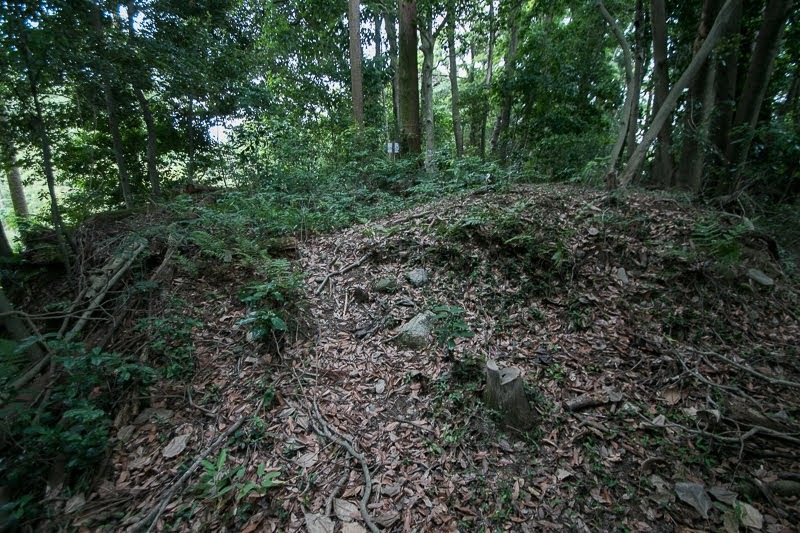 Even though the height of the hill is not so high, seer slope of the hill provides sufficient security along with artificial structures; Total length of the castle exceeds 400 meter long and has plenty space for siege. 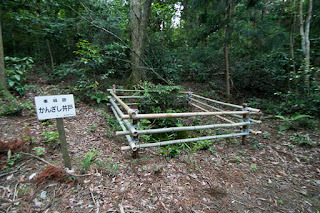 In 1582, Nobunaga and Nobutada died in the incident of Honnoji, a coup d’etat by his general Mitsuhide Akechi (1521-1582), Hideyoshi Hashiba (1537-1598, later Hideyoshi Toyotomi) wbo broke Mitsuhide at the battle of Yamazaki significantly improved his position, and became hostile against Nobutaka and other important retainers such as Katsuie Shibata (1521-1583) or Kazumasu Takigawa (1525-1586). 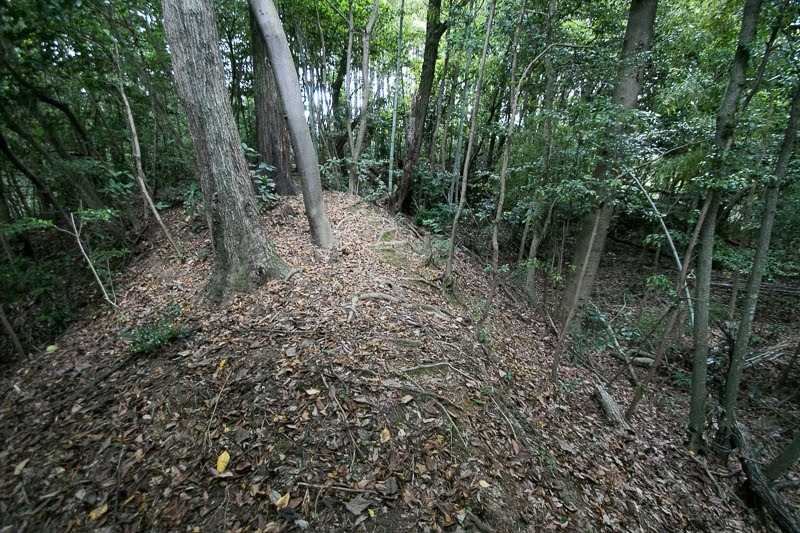 In the beginning of 1583, the alliance of Hidetaka, Katsuie and Kazumasa raised their army against Hideyoshi and Nobukatsu Oda (1558-1630), who was the lord of Tamaru castle in the south half of Ise province. After the move of Nobutaka from Kanbe castle to Gifu castle, Yoshikatsu Okamoto still held Mine castle. 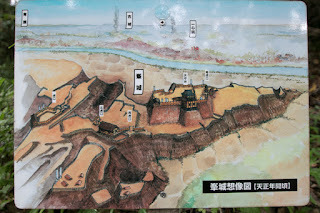 But Yoshikatsu Okamoto turned to Hideyoshi side, Kazumasu Takigawa captured Mine castle and Kameyama castle then let Mine castle protect by his nephew Masushige Takigawa (?-?). 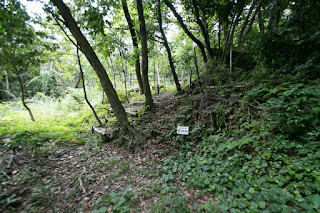 In response to this, Hideyoshi sent large army lead by Ujisato Gamo (1556-1595) to fall Kameyama castle and Mine castle to connect to Nobukatsu Oda, but Masushige well endured fierce attack of Ujisato over two months and finally opened Mine castle by the shortage of supplies. Just after that Hideyoshi broke Katsuie Shibata at the battle of Shizugatake, then forced Nobutaka to kill himself. 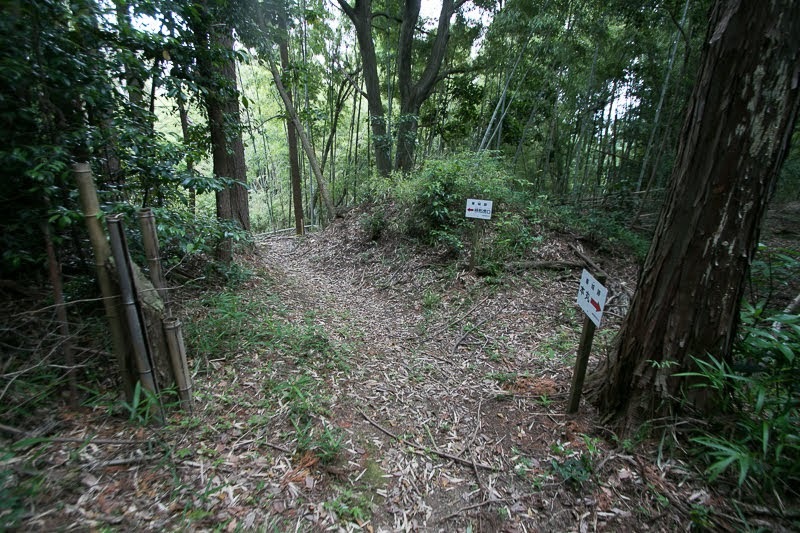 Kazumasu surrendered to Hideyoshi but his territory was confiscated then was given to Nobukatsu Oda. 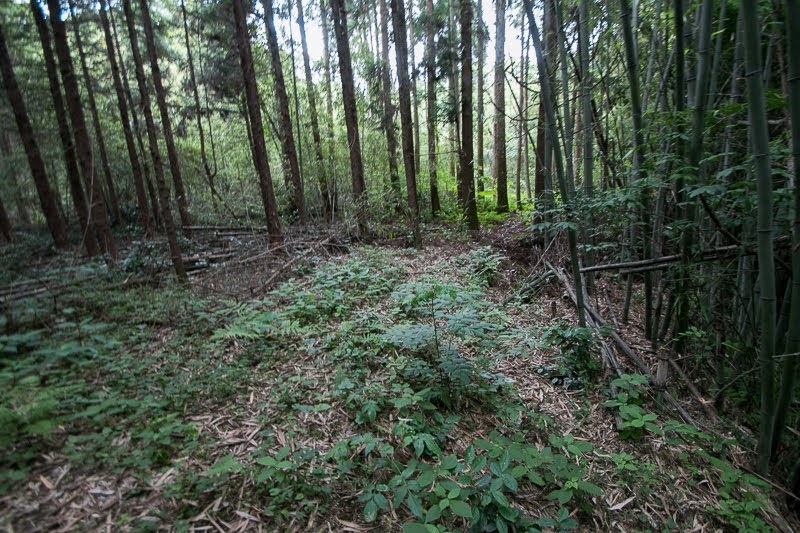 However, Hideyoshi who attempted to exceed Oda family and be the next ruler next confronted against Nobukatsu. In 1584, Nobukatsu Oda raised his army against Hideyoshi in cooperation with Ieyasu Tokugawa (1543-1616), a former ally of Nobunaga and lord of Mikawa province (eastern half of Aichi prefecture). 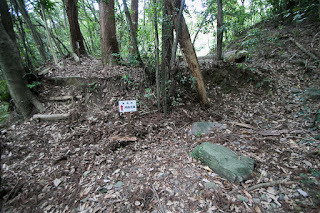 Hideyoshi sent Ujisato Gamo again to Mine castle, to cut the connection of Nobukatsu Oda who resided at Matsugashima castle near Matsusaka city and Ieyasu Tokugawa. This time Nobukatsu Oda let Mine castle protect by Masakatsu Sakuma (1556-1632), the son of Nobumori Sakuma (1528-1582), an important retainer of Nobunaga but later was expelled. 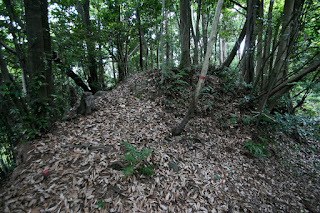 But this time inferior Nobukatsu and Ieyasu decided to concentrate their army to Owari province, thus Mine castle fell in only one week without clear resistance. 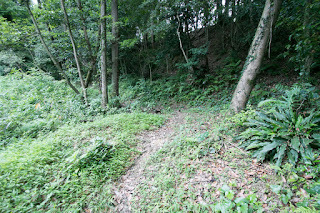 After the battle Mine area was given to Yoshiharu Horio (1543-1611), a hereditary general of Hideyoshi but promoted to the lord of Hamamatsu castle (Shizuoka prefecture) in 1590. 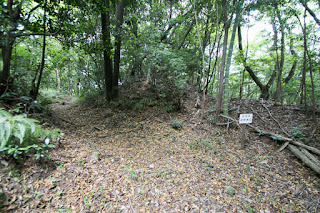 Mine area might be held by Yoshikatsu Okamoto who returned as the lord of Kameyama castle, but Mine castle was abolished around this time. 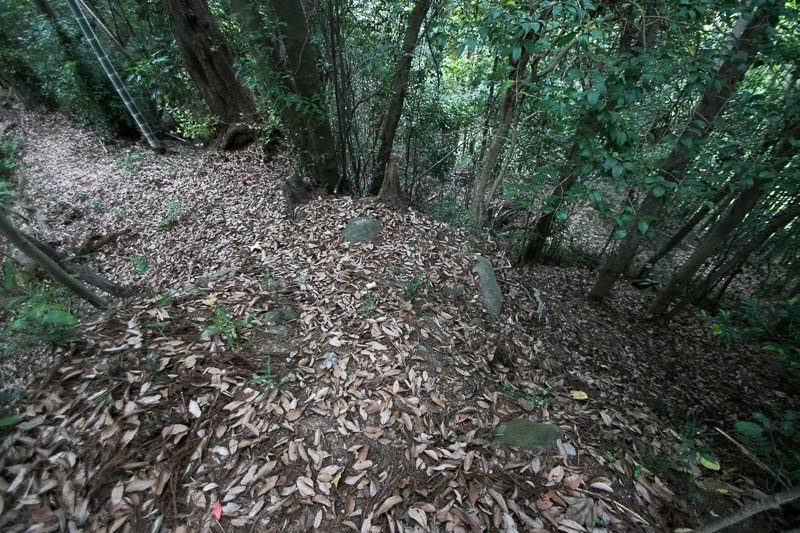 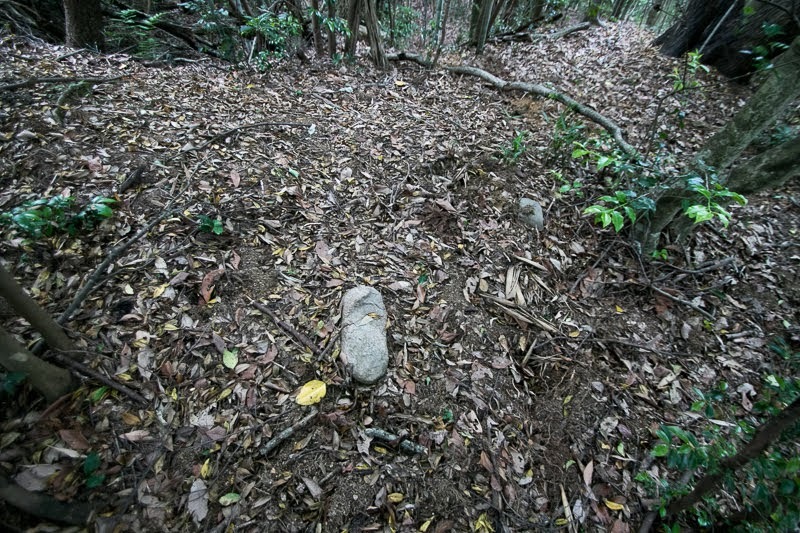 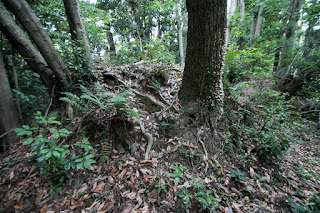 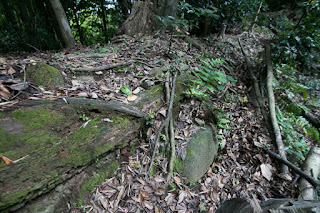 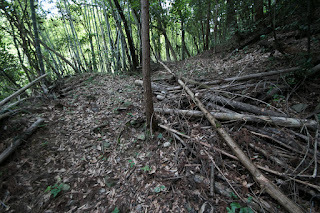 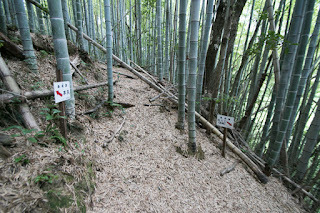 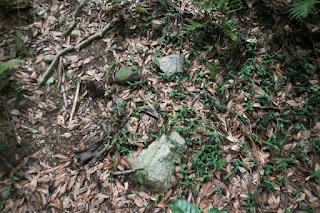 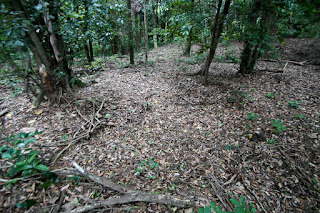 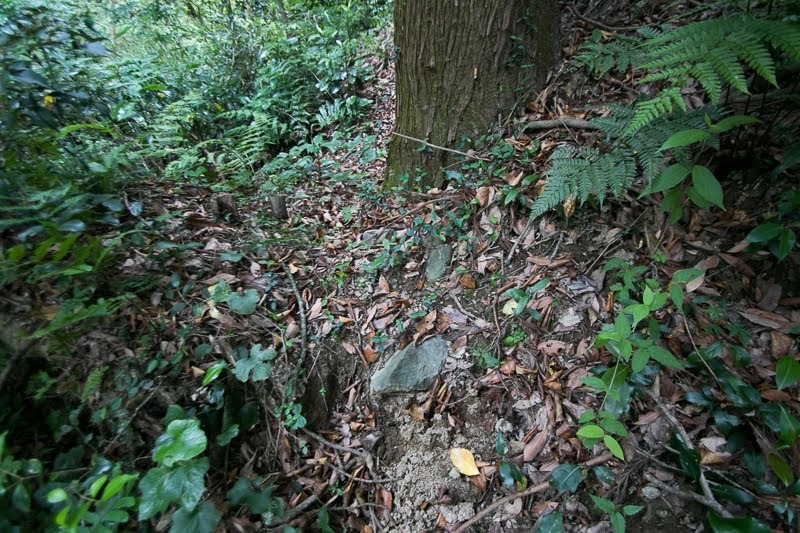 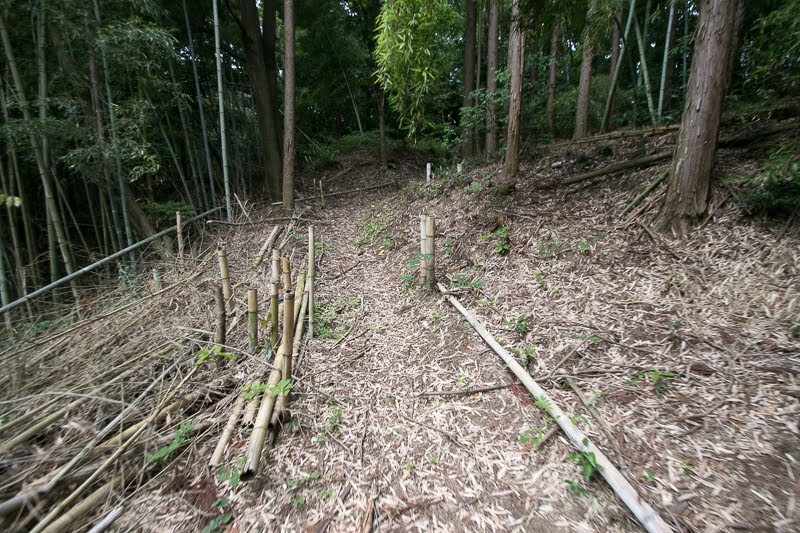 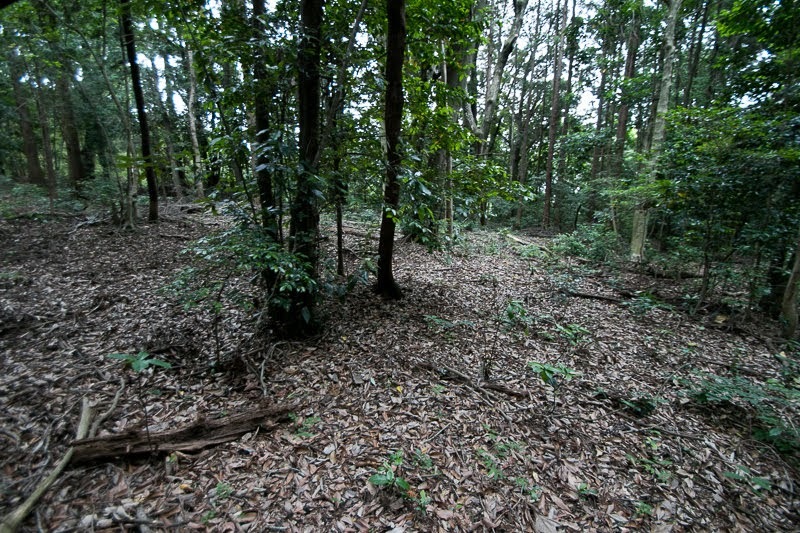 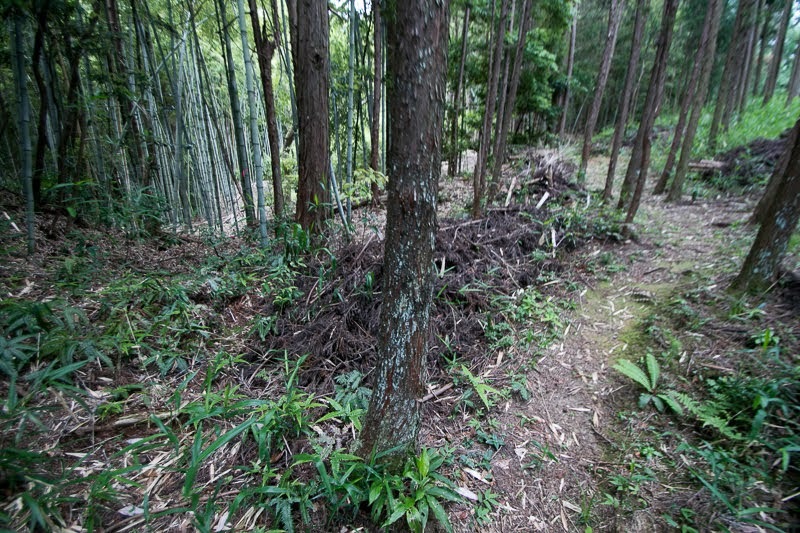 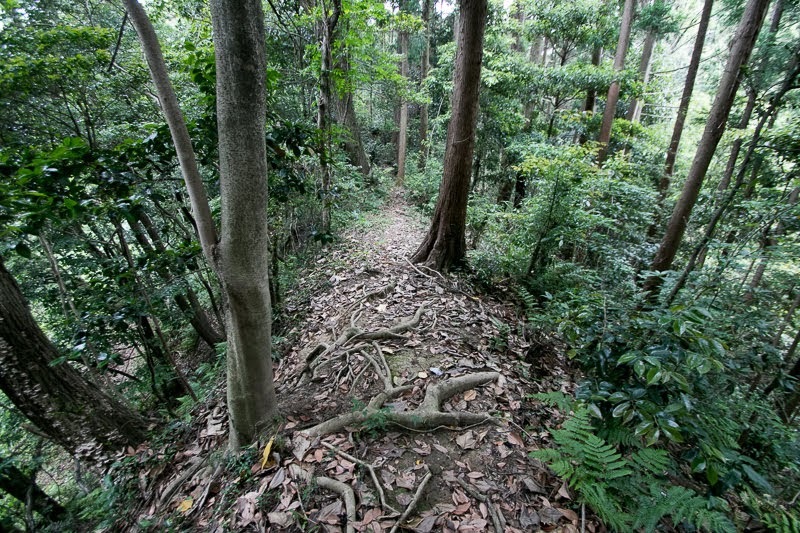 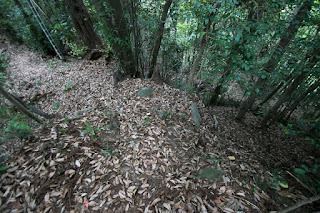 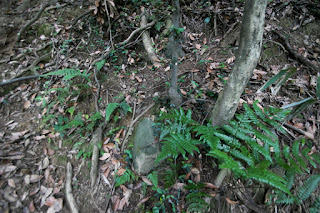 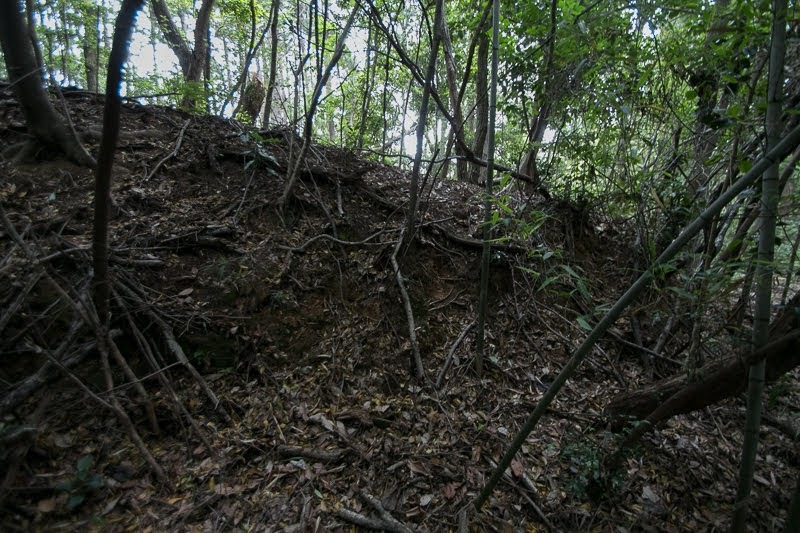 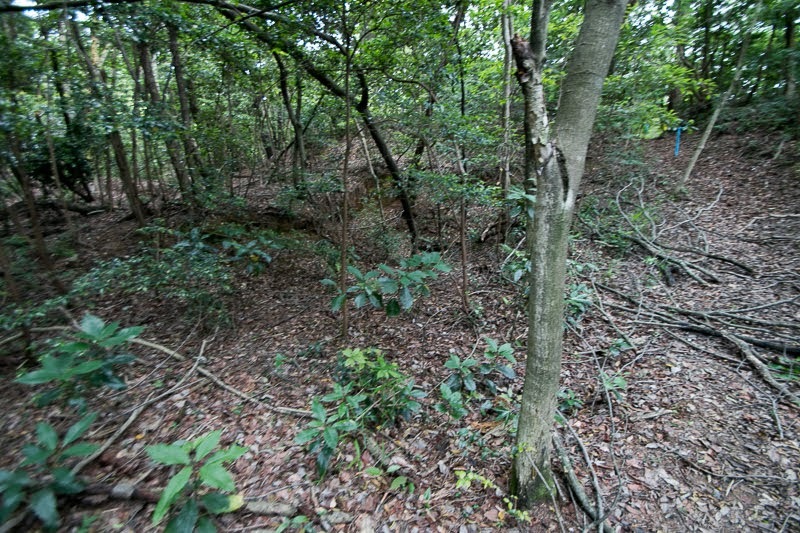 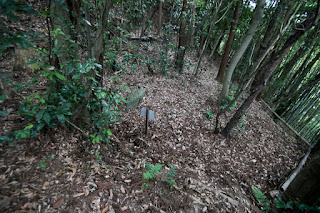 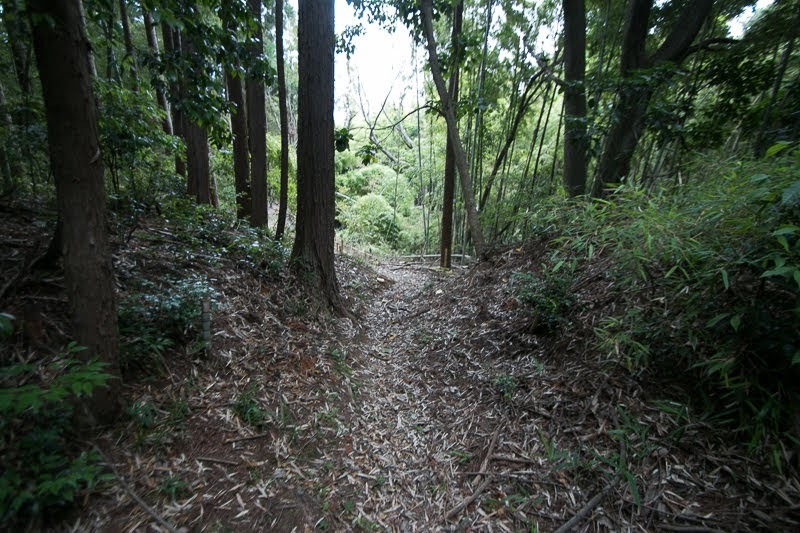 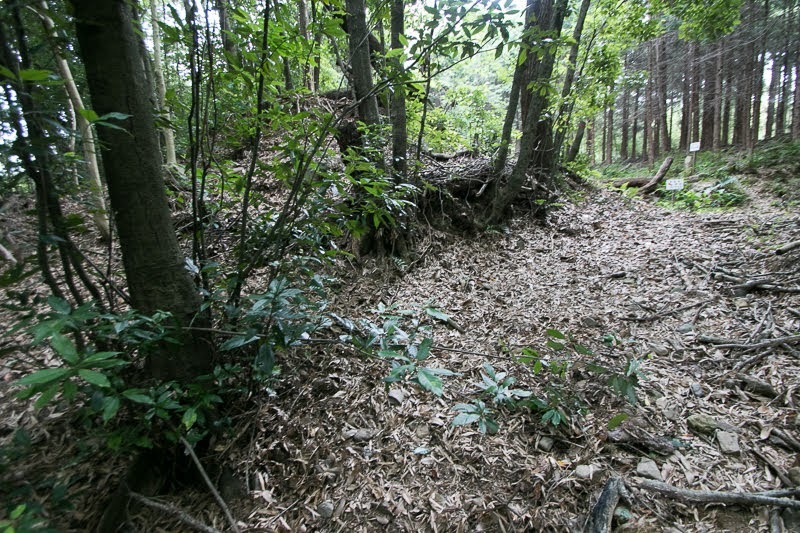 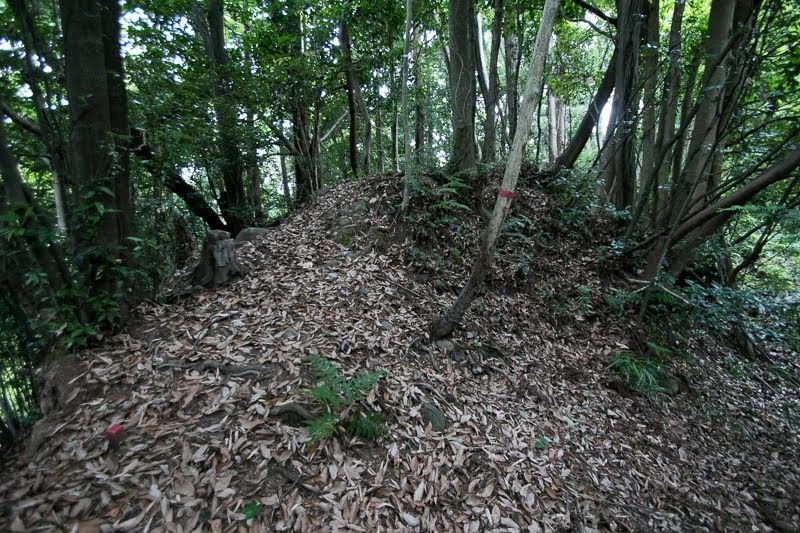 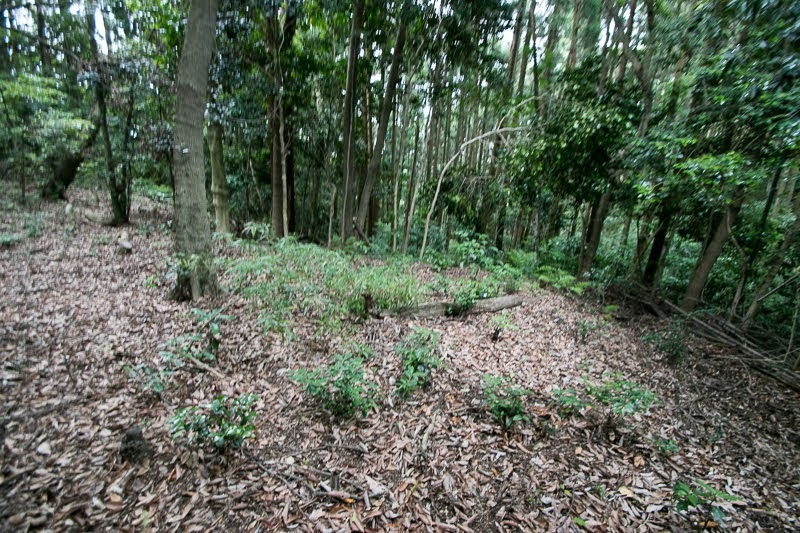 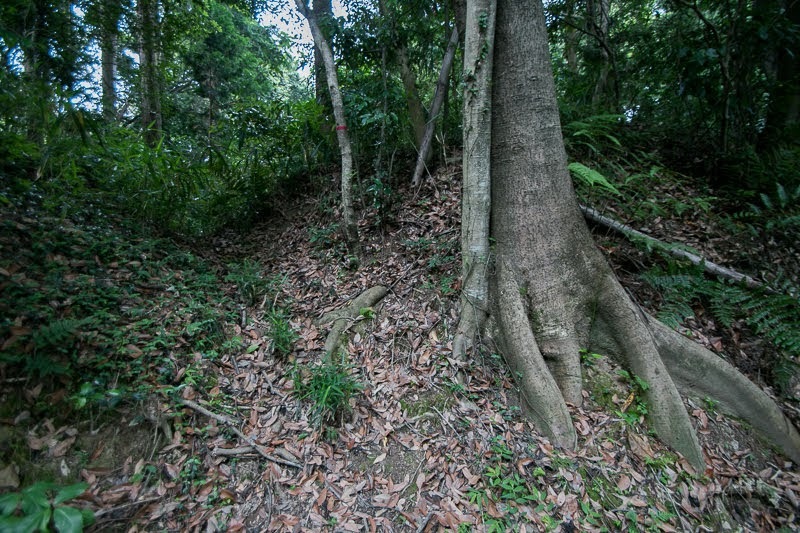 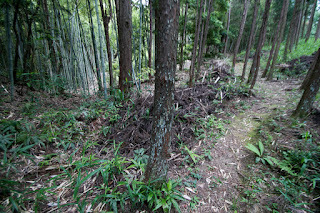 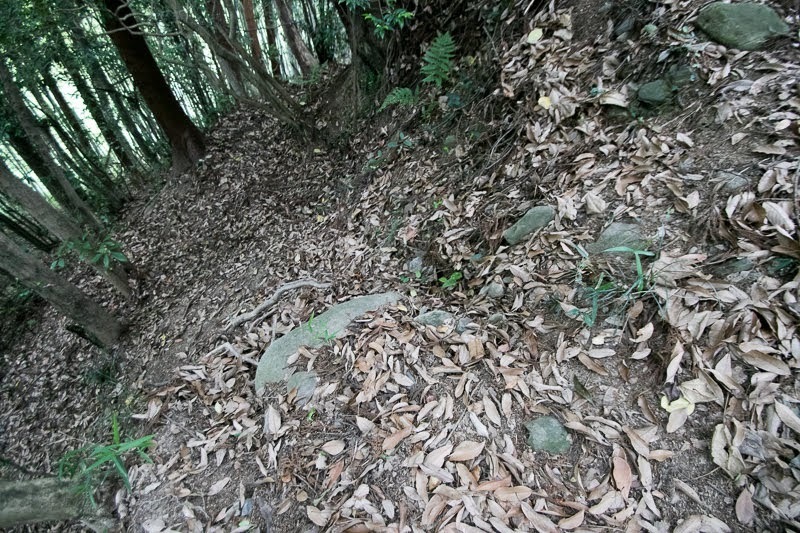 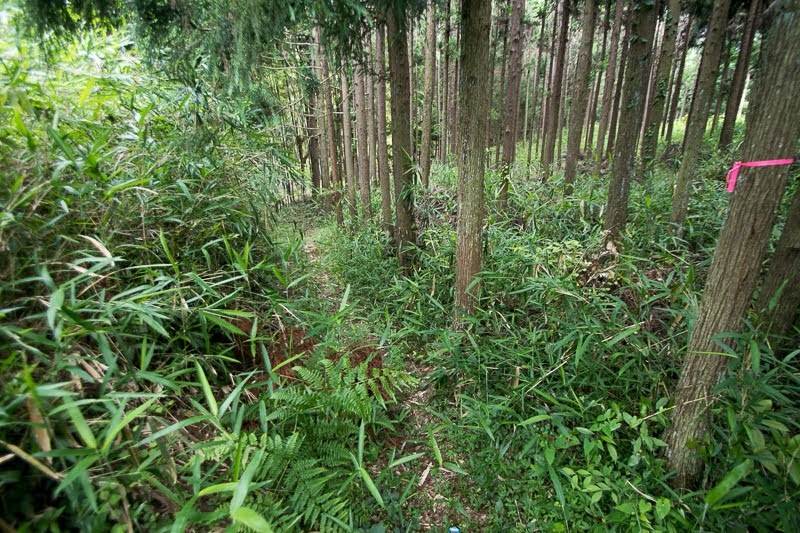 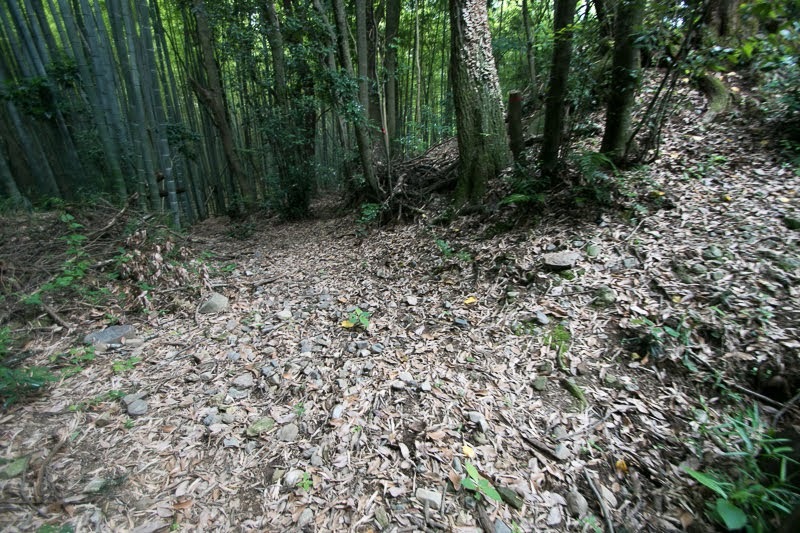 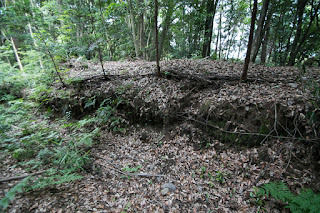 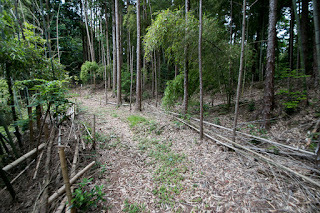 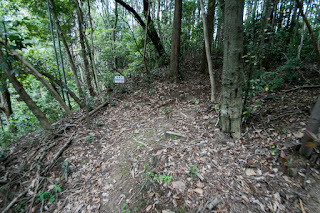 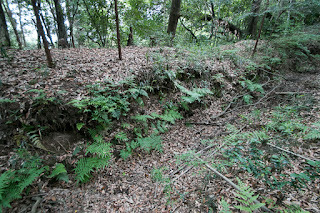 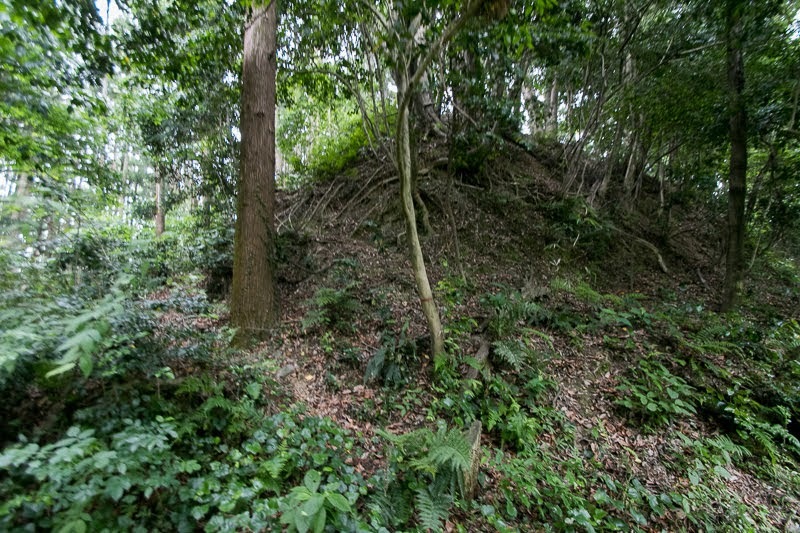 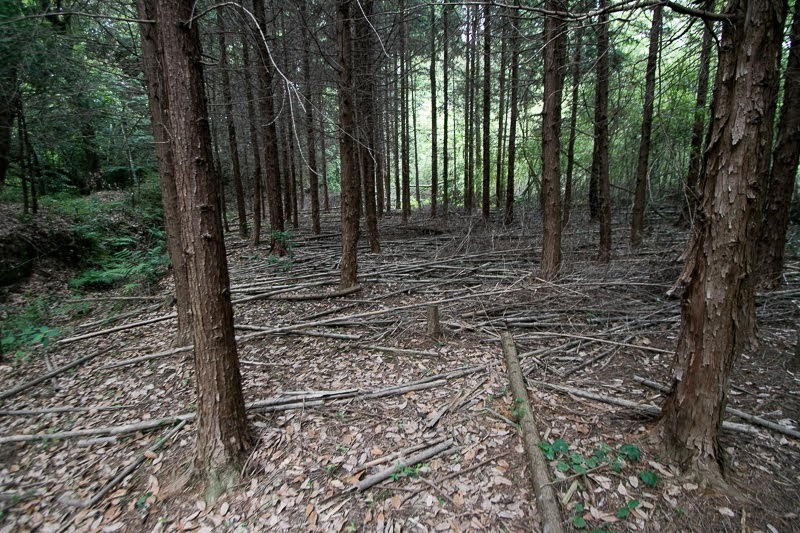 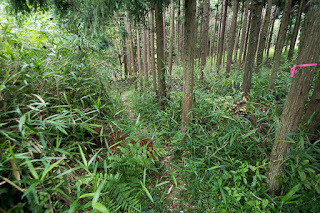 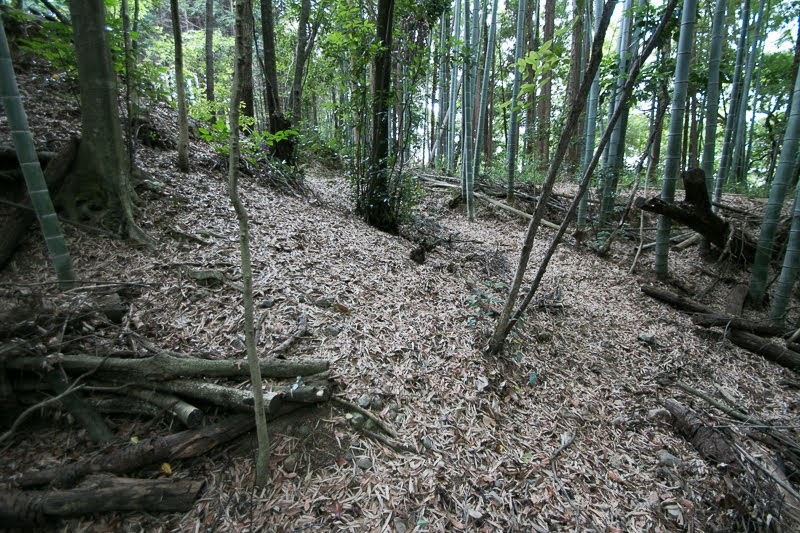 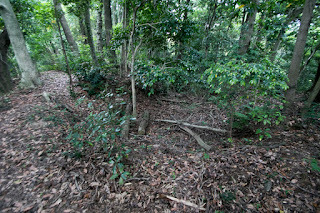 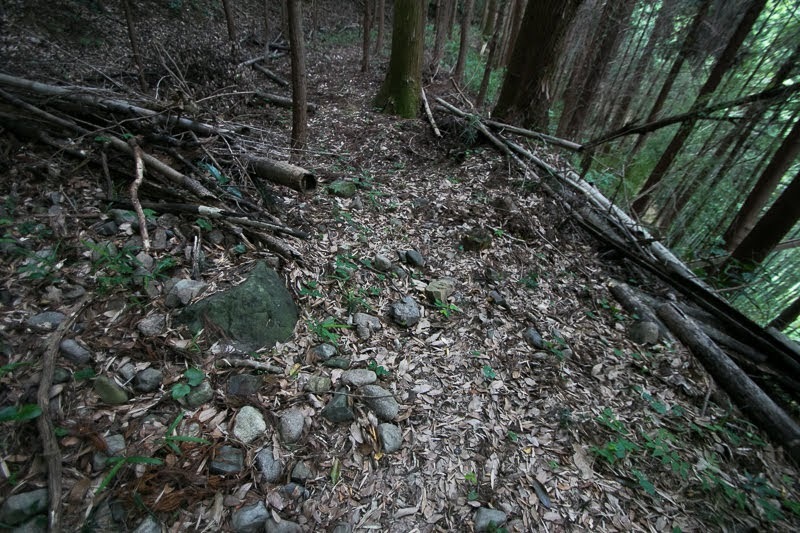 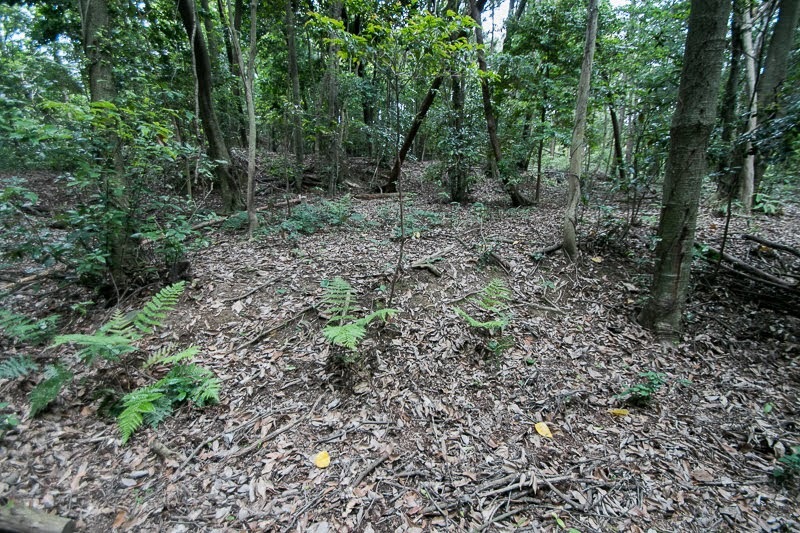 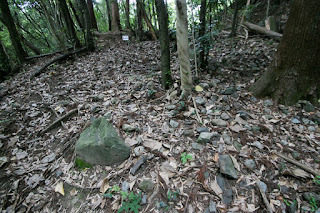 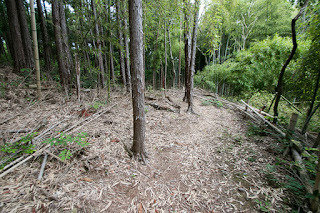 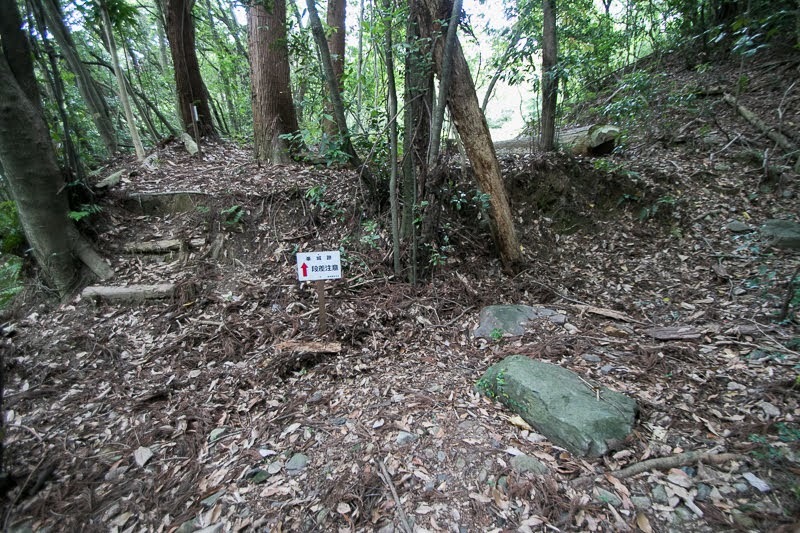 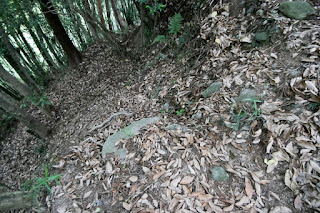 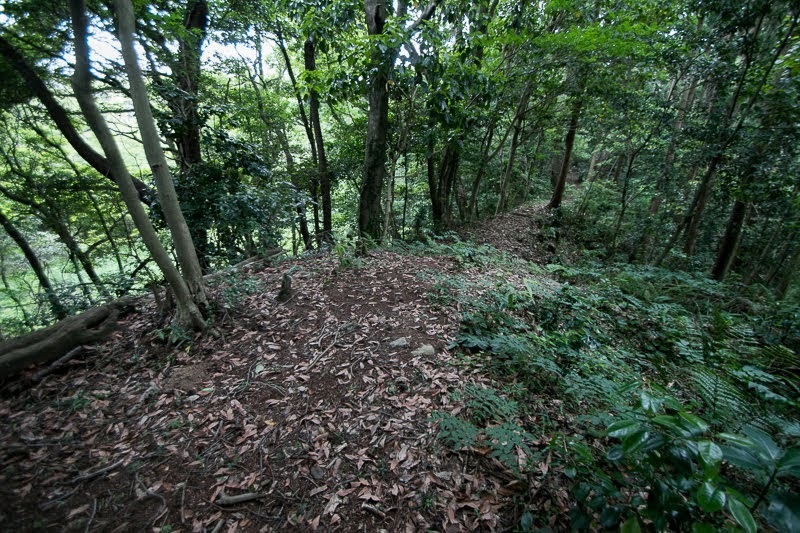 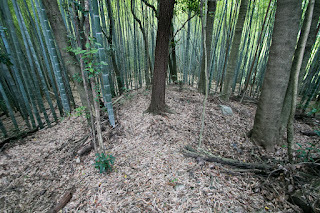 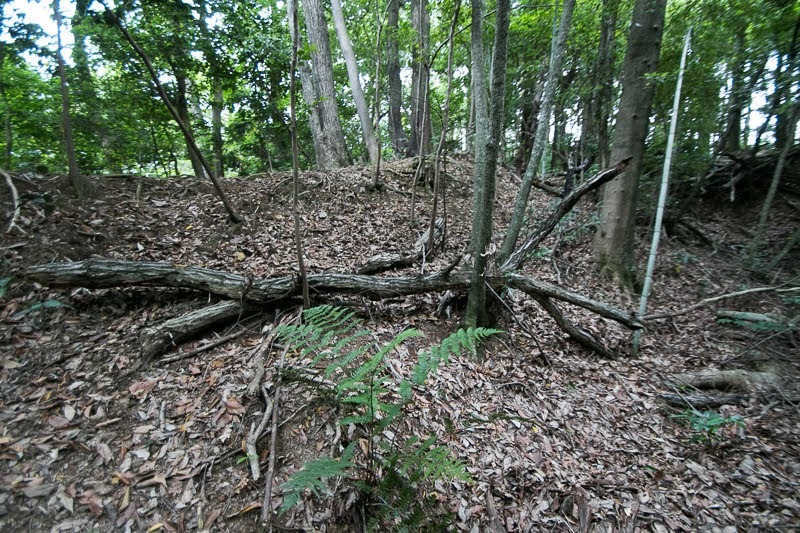 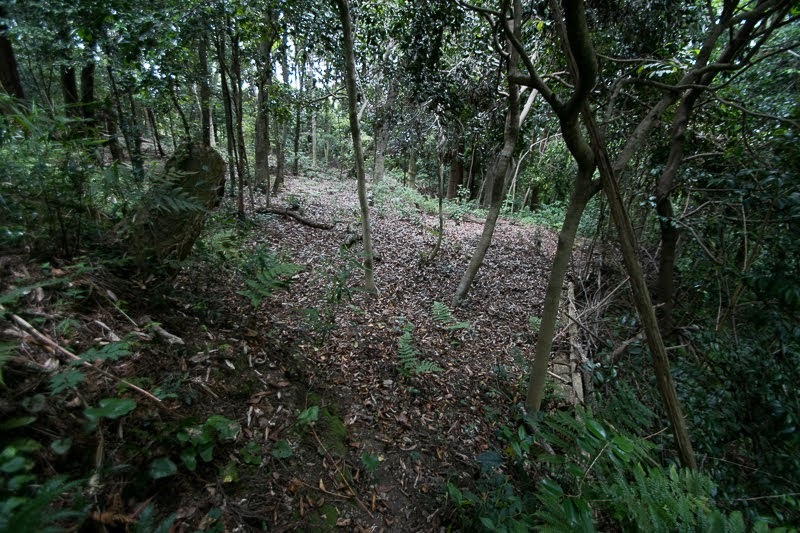 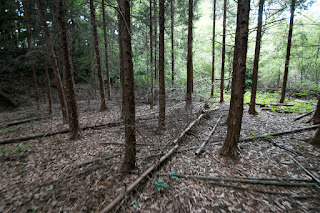 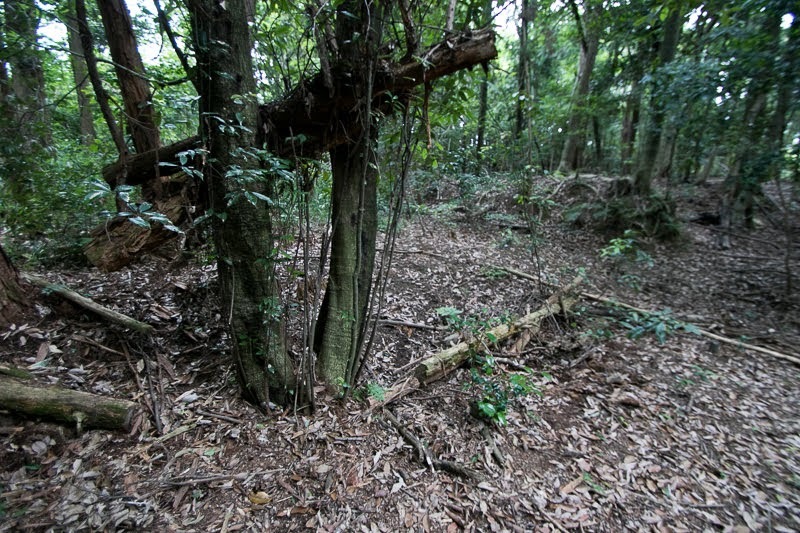 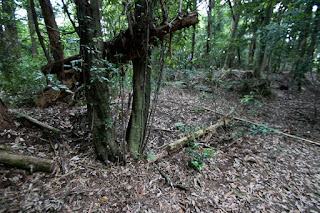 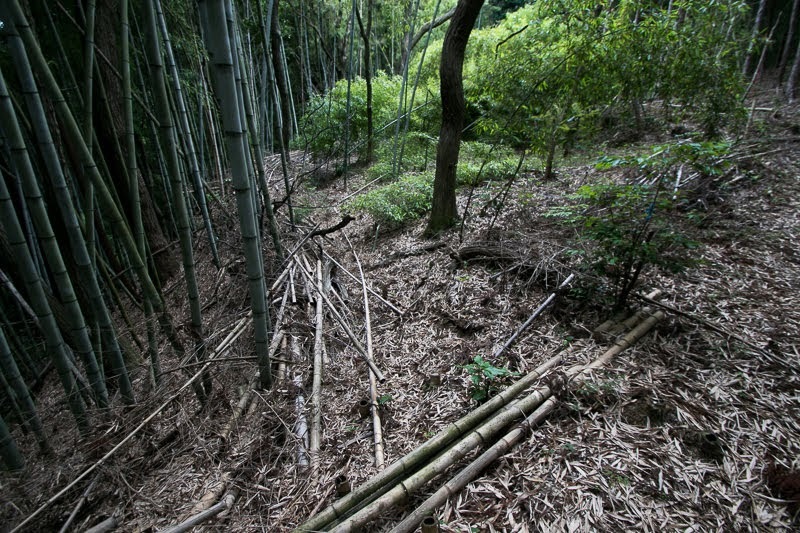 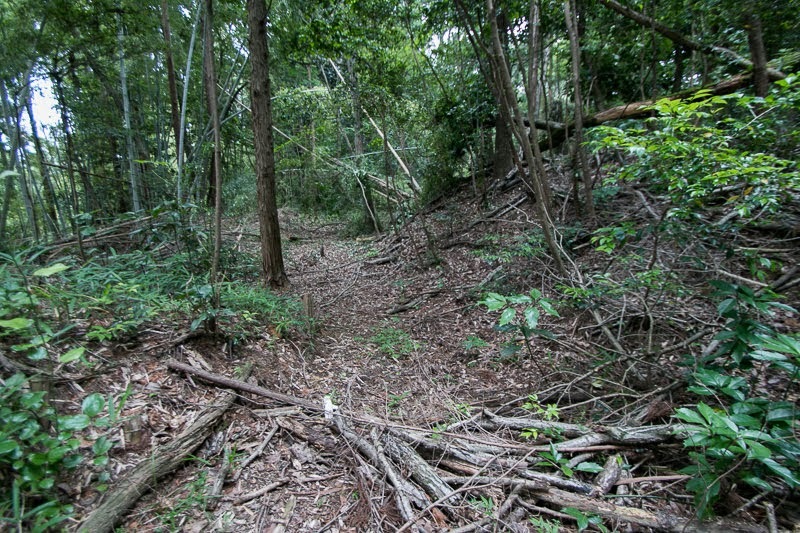 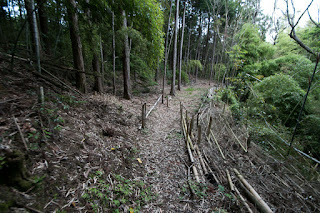 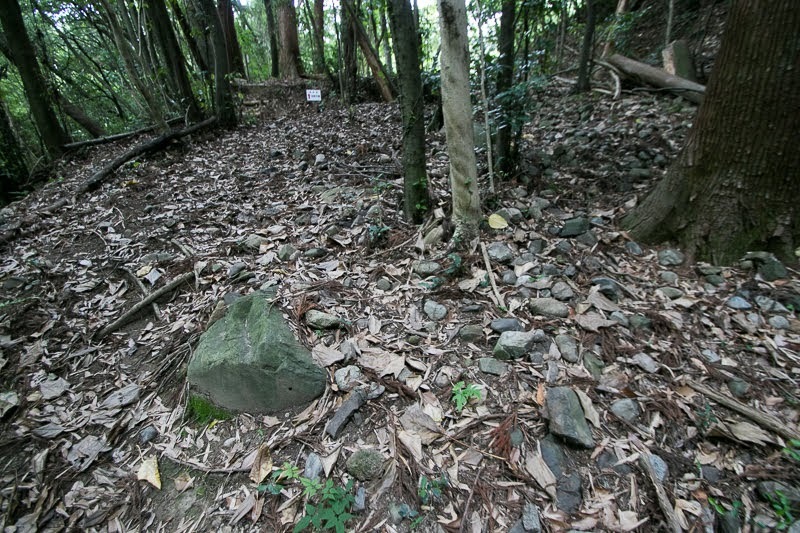 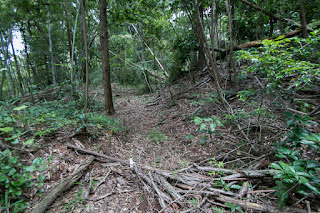 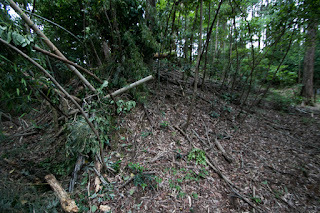 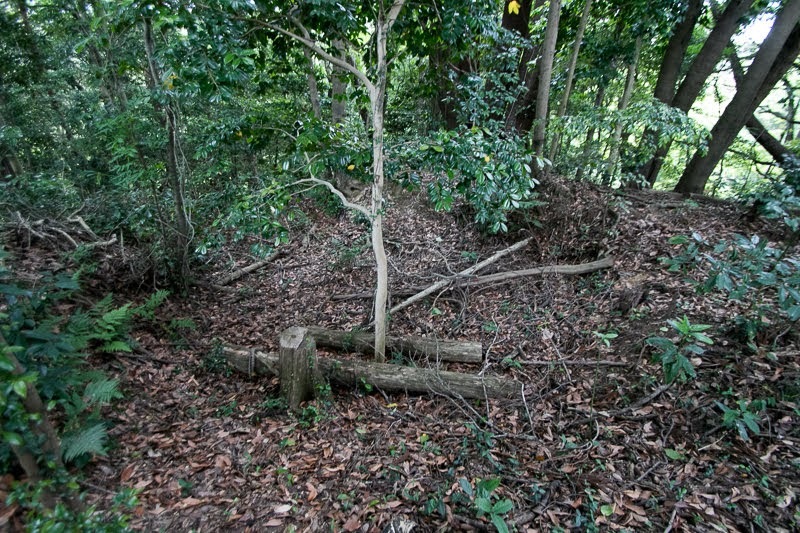 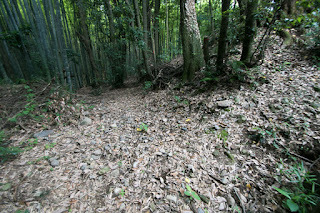 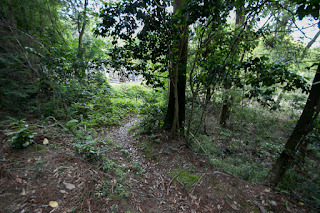 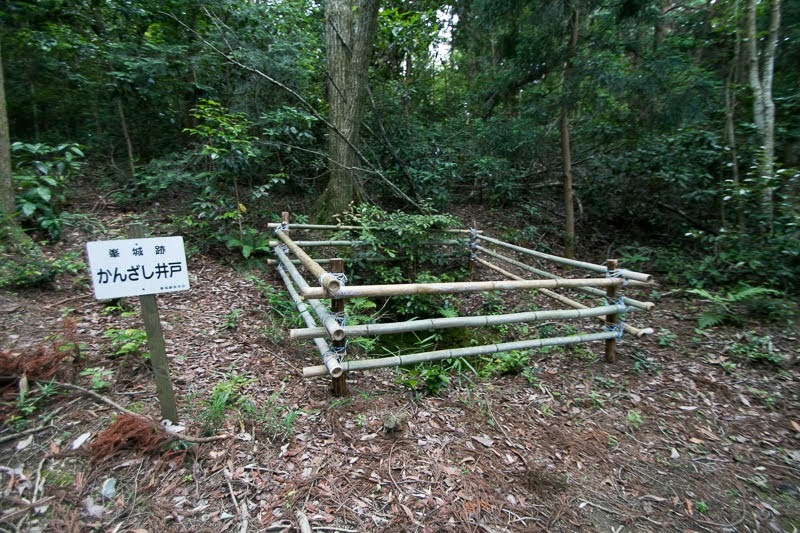 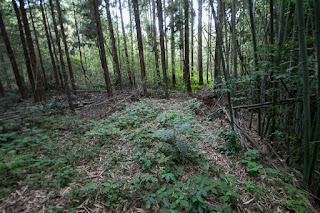 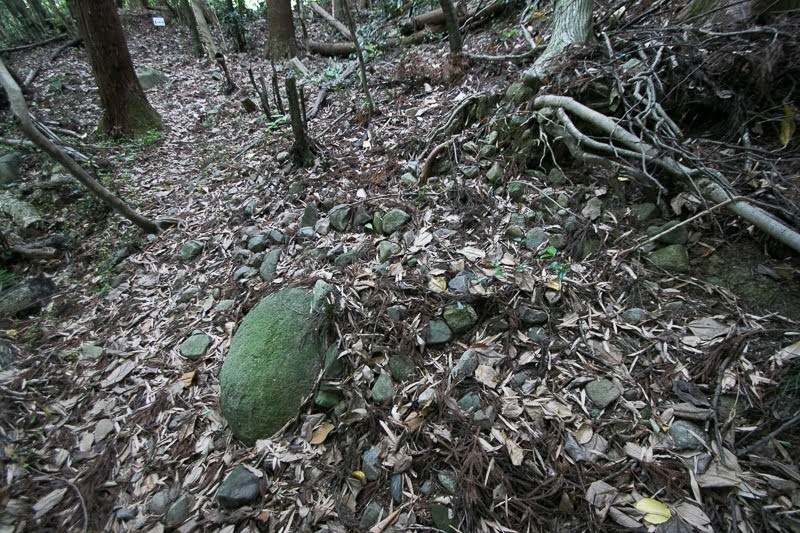 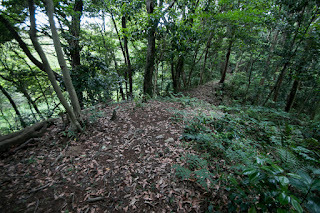 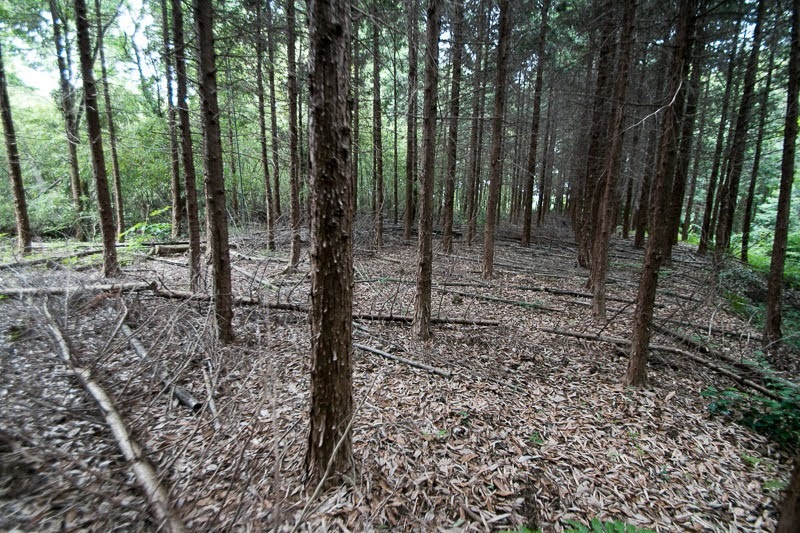 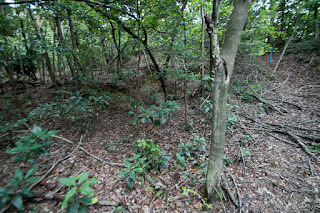 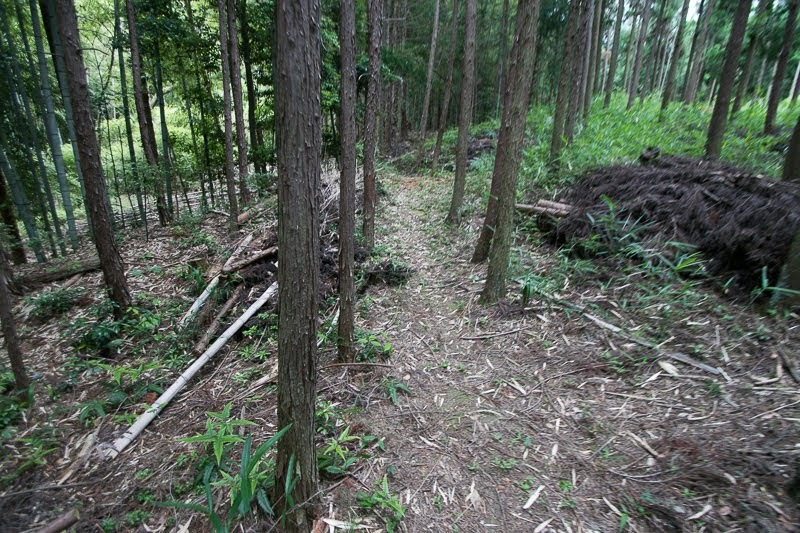 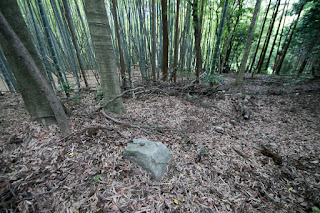 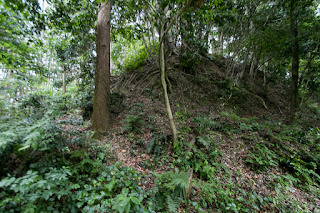 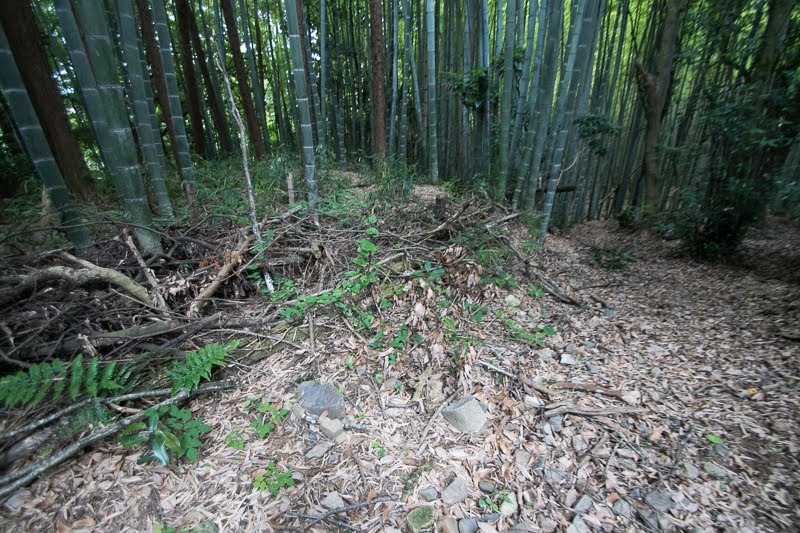 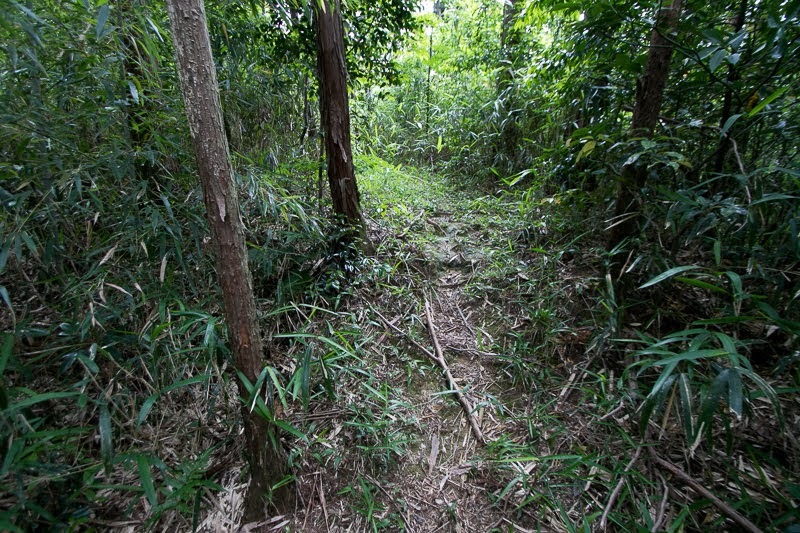 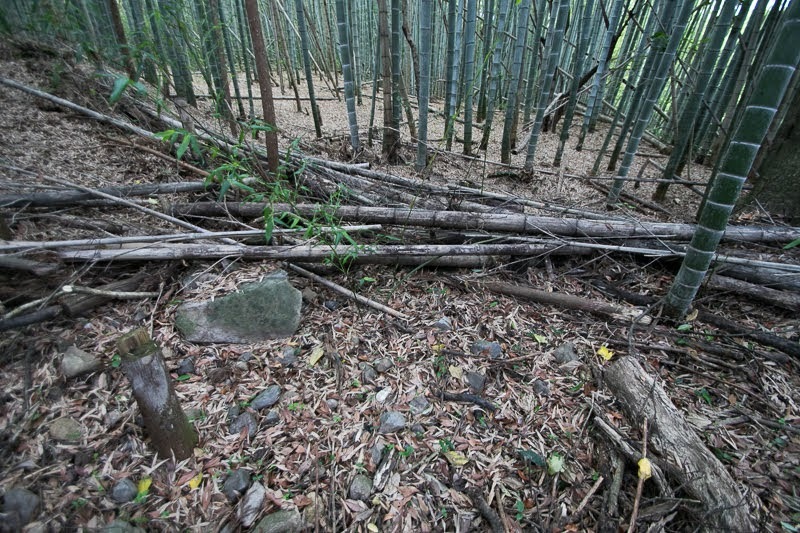 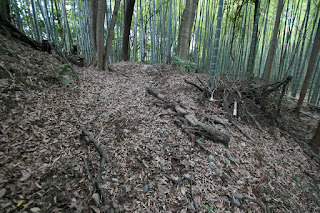 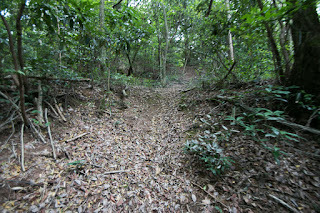 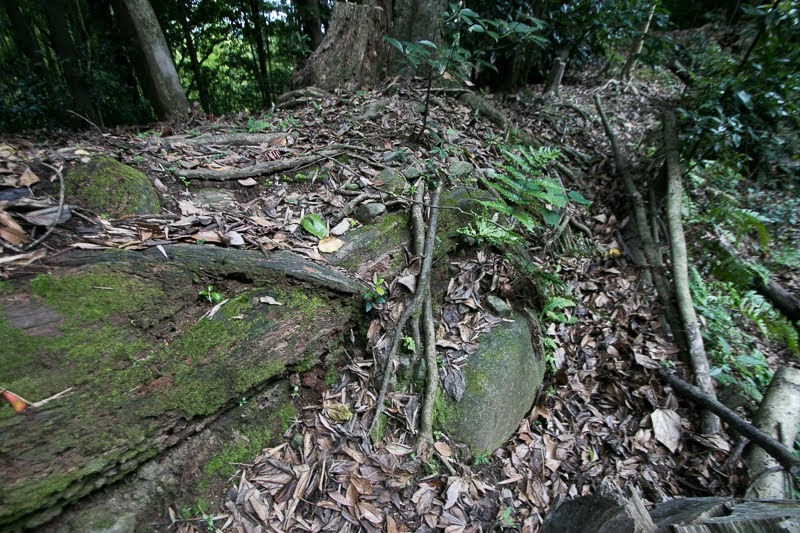 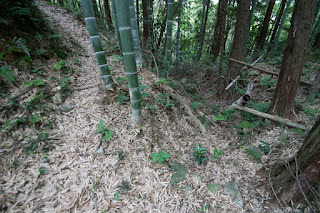 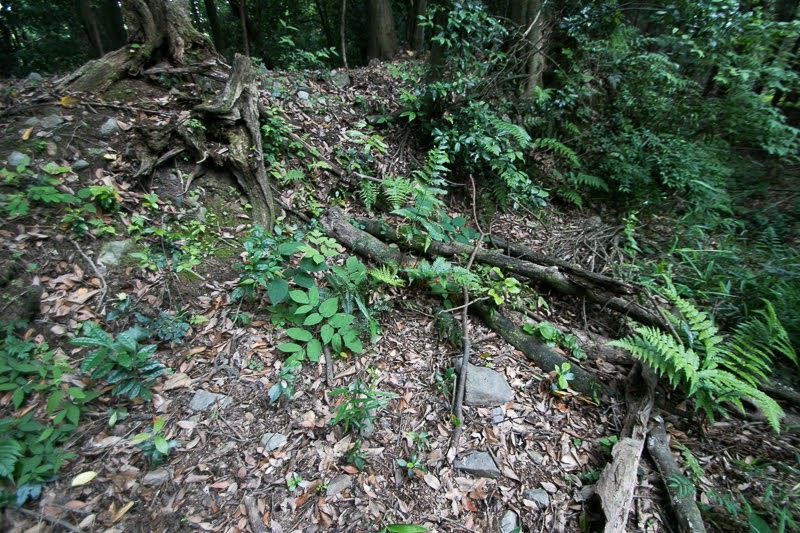 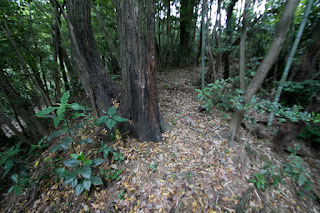 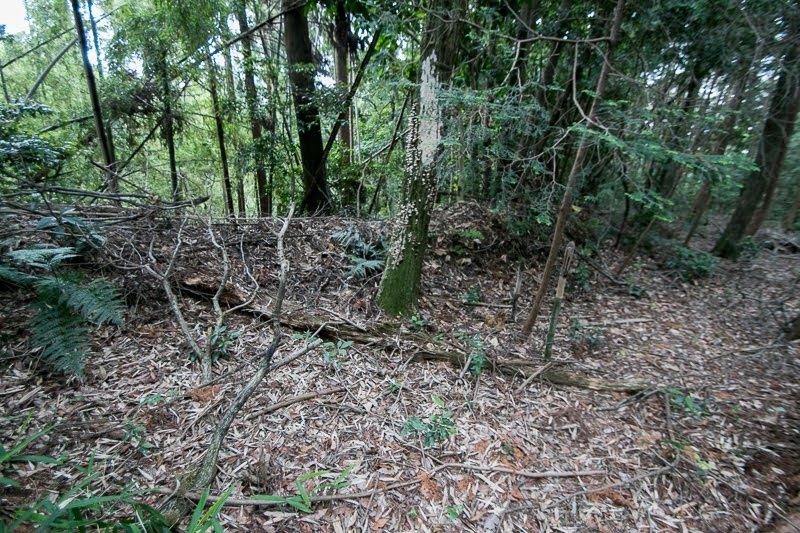 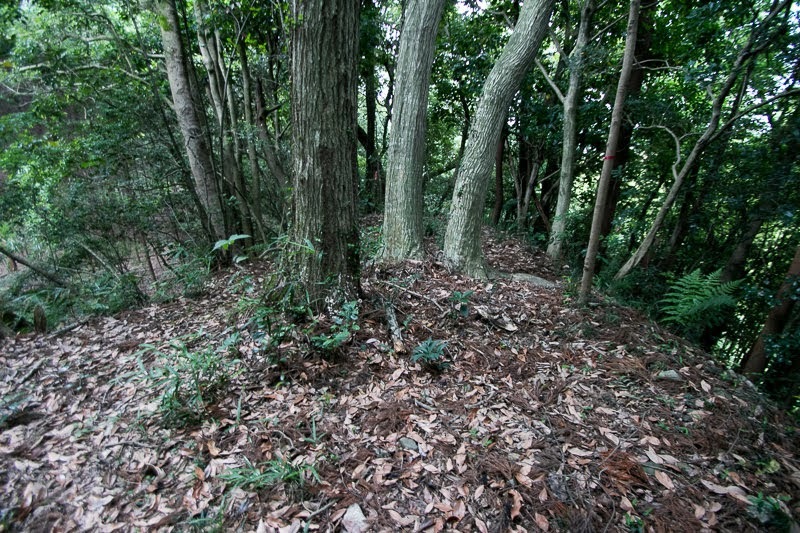 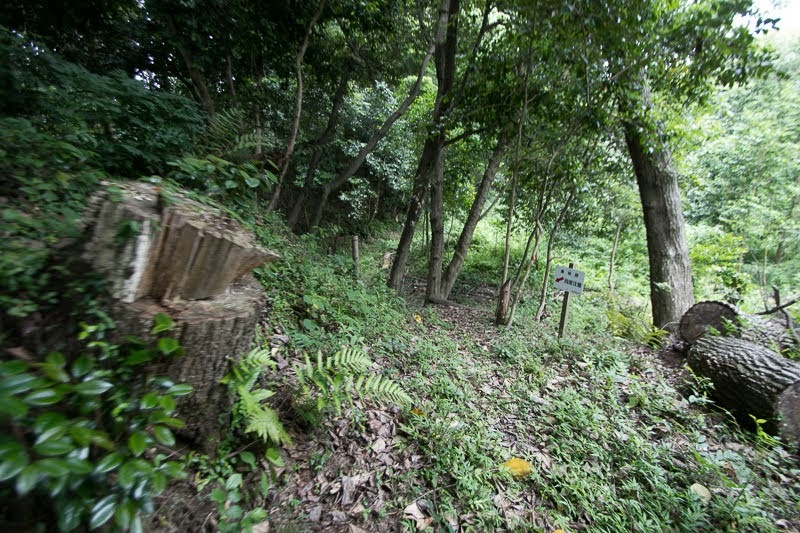 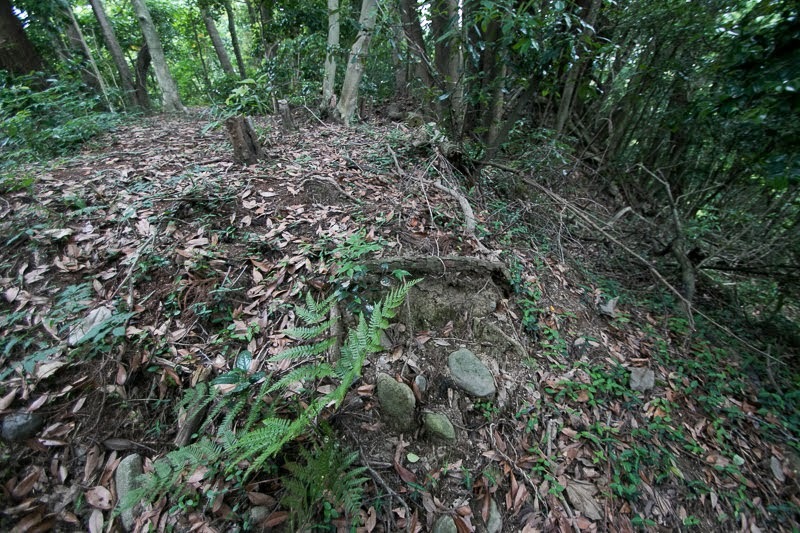 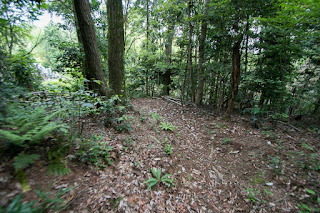 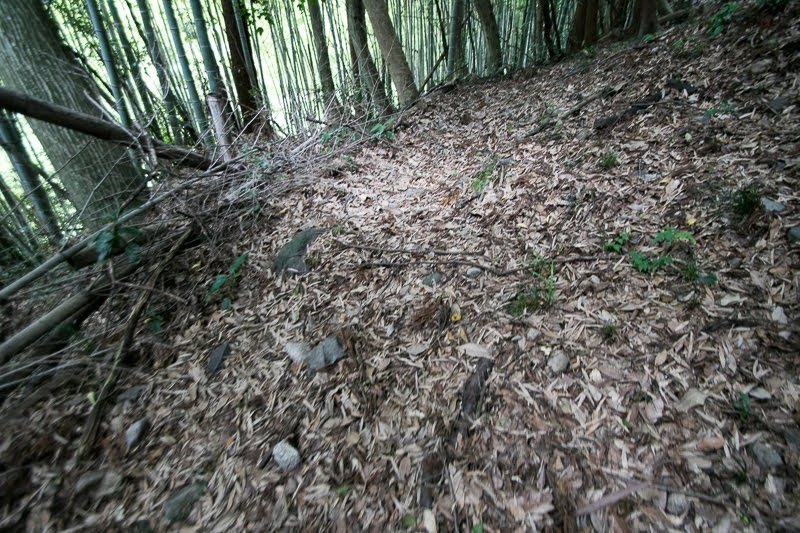 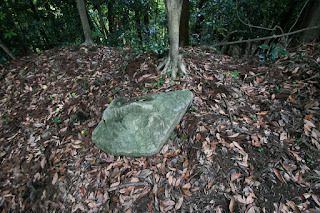 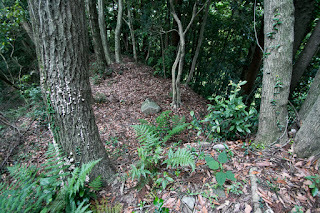 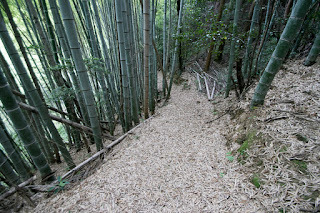 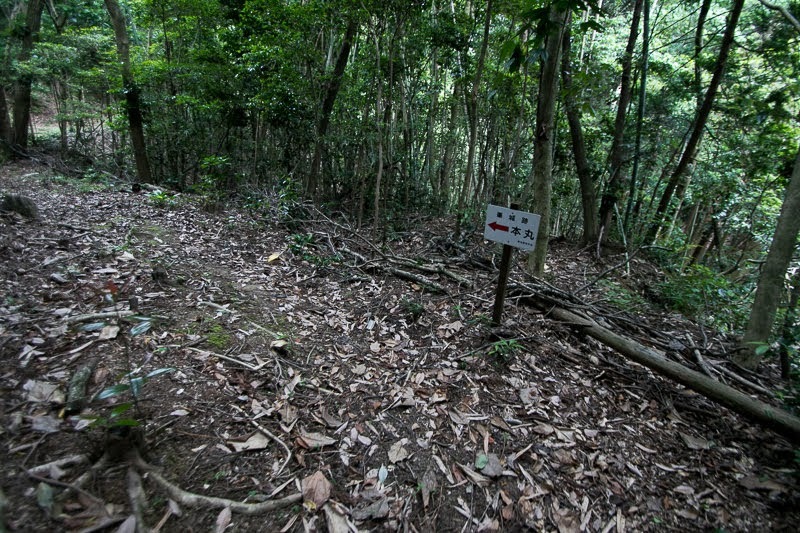 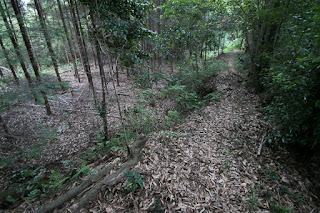 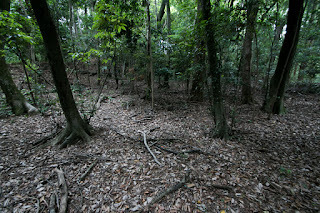 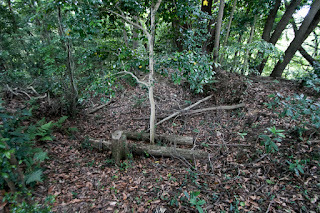 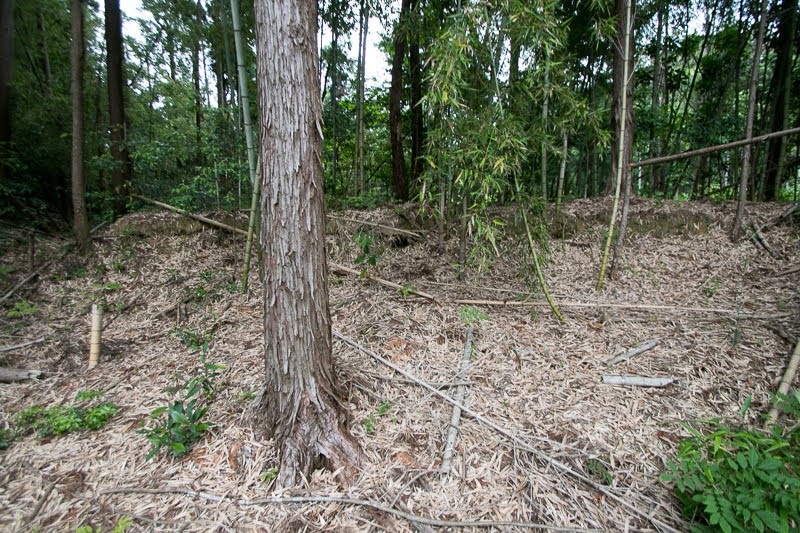 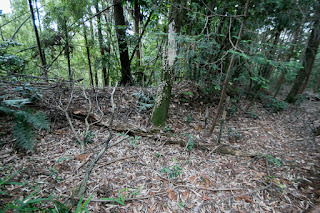 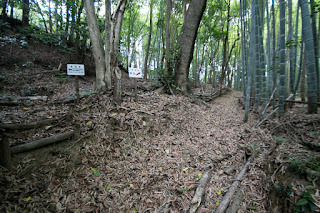 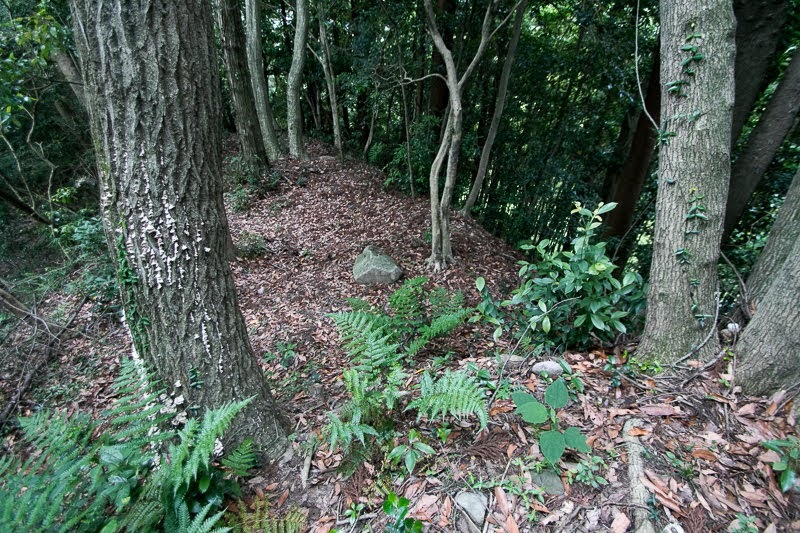 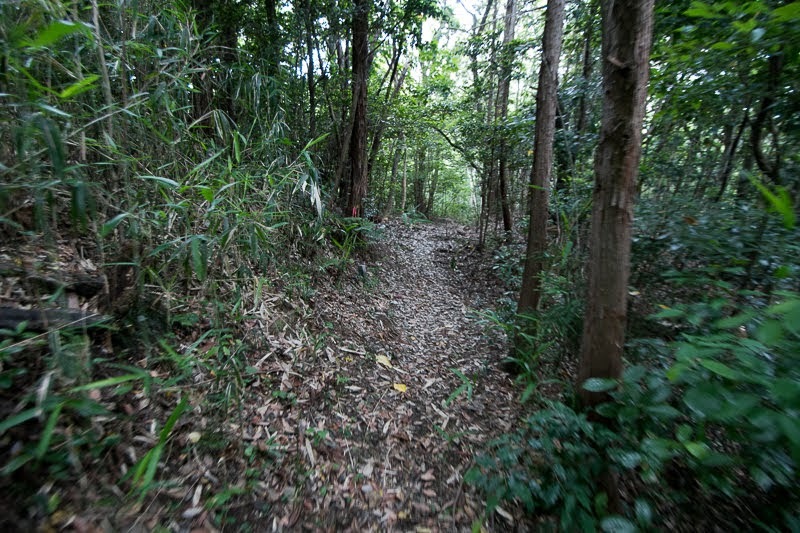 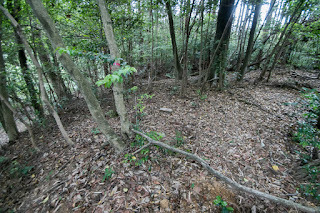 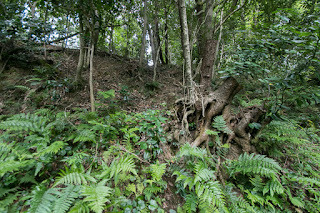 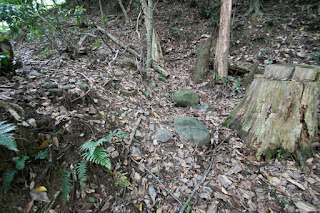 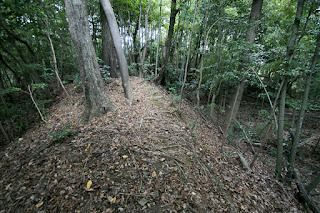 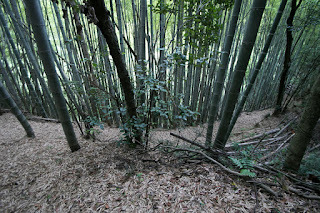 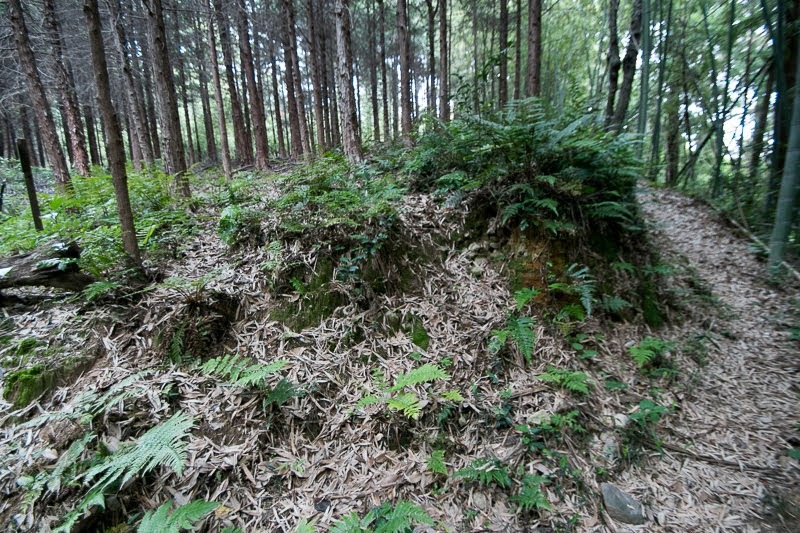 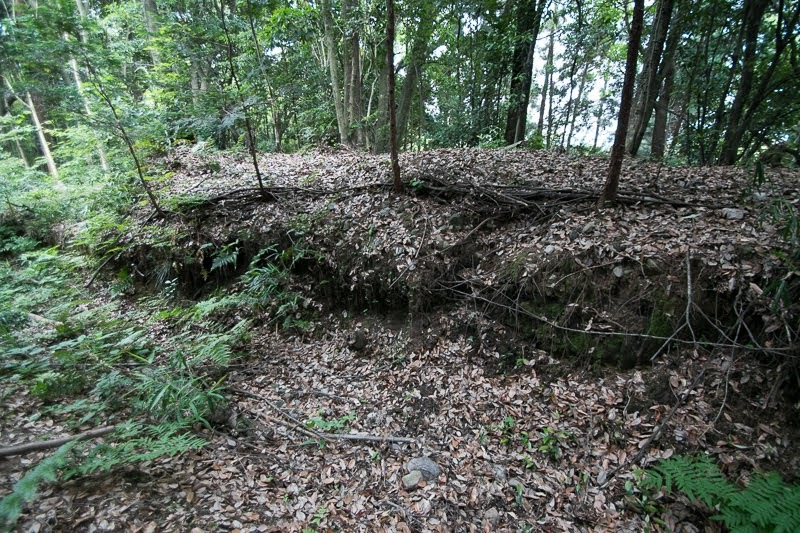 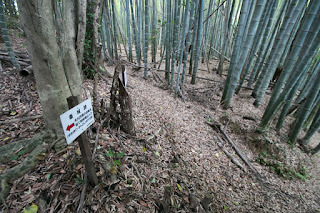 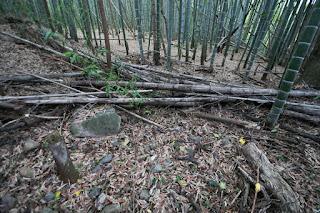 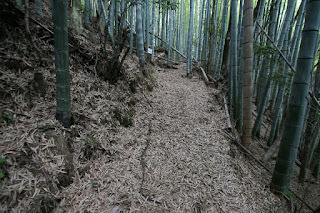 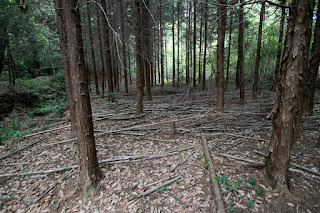 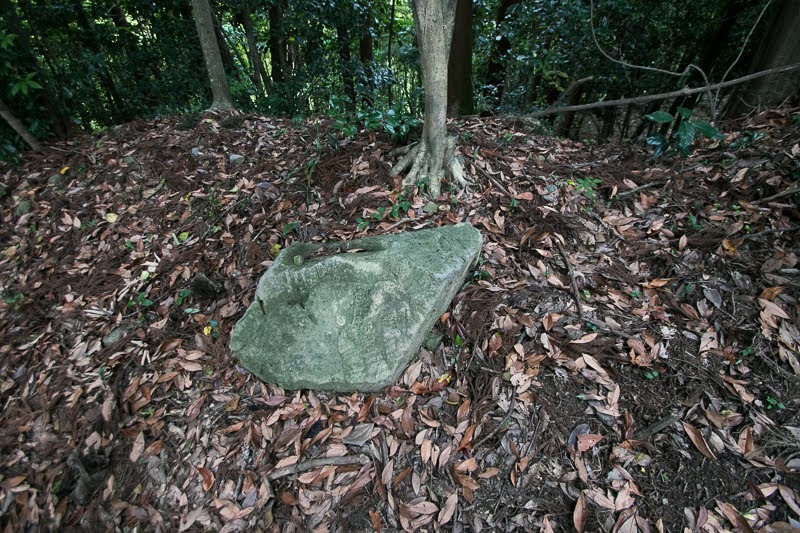 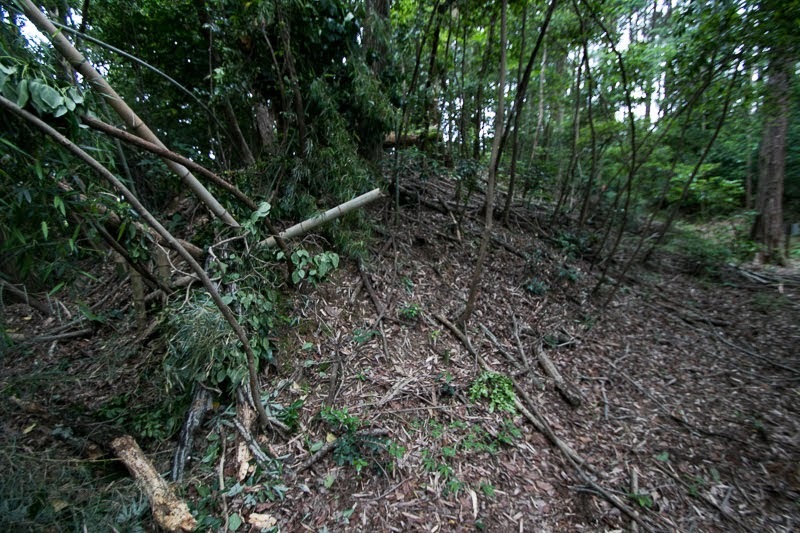 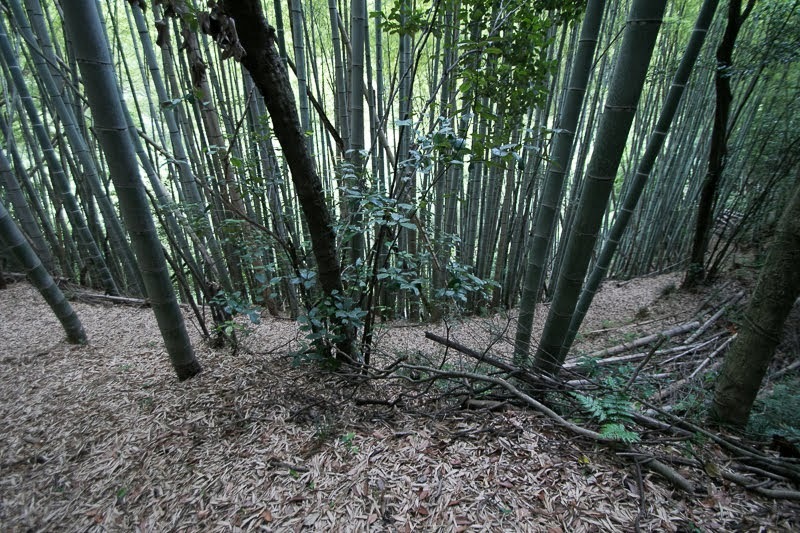 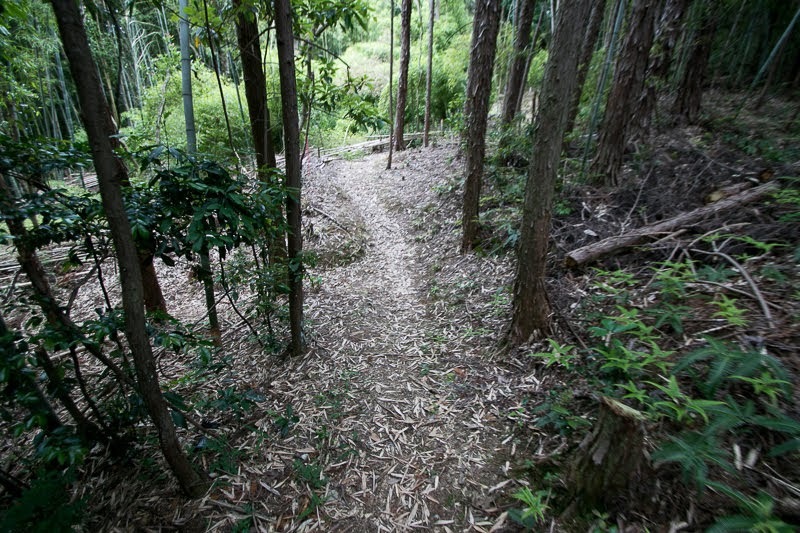 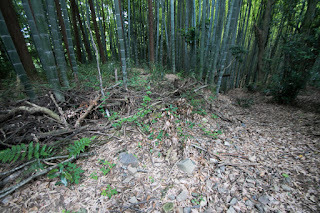 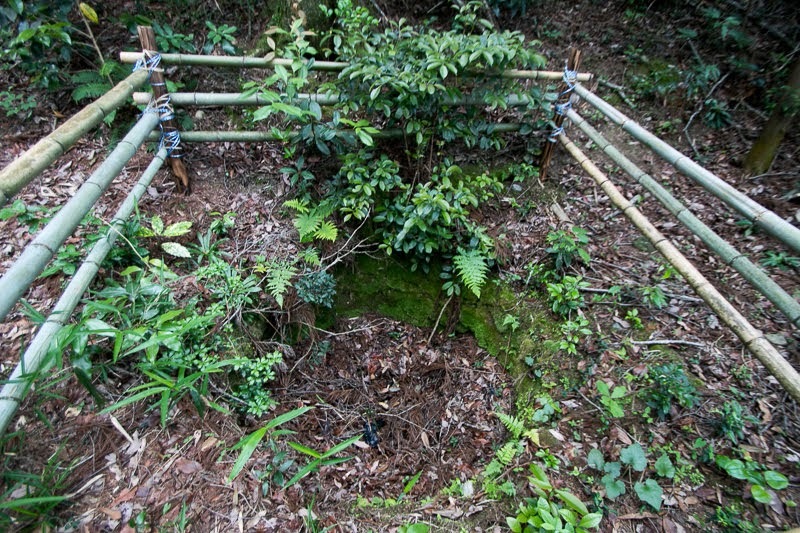 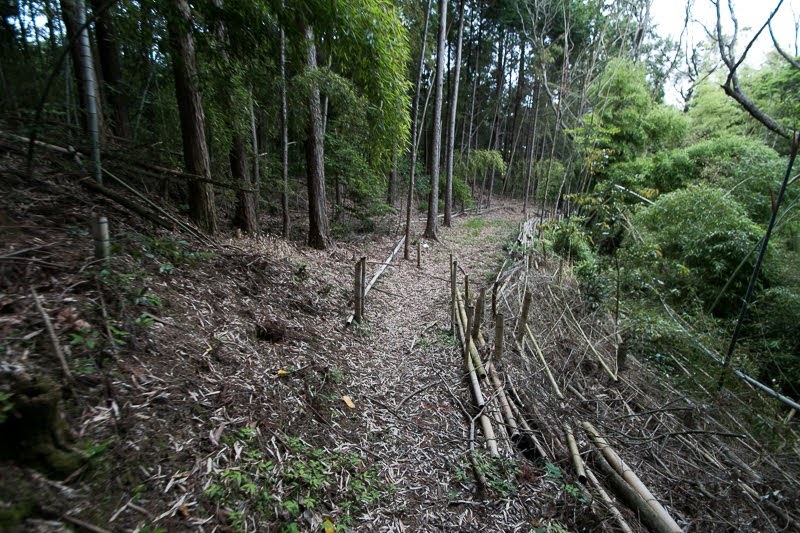 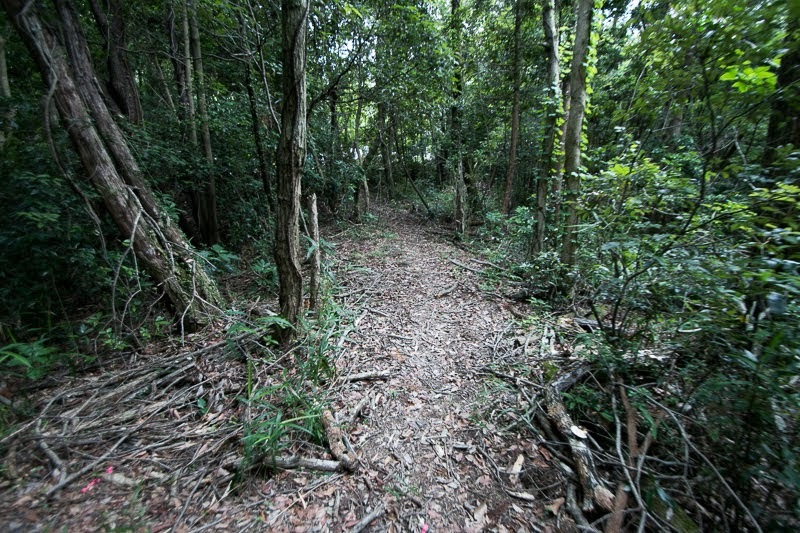 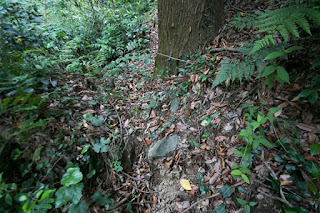 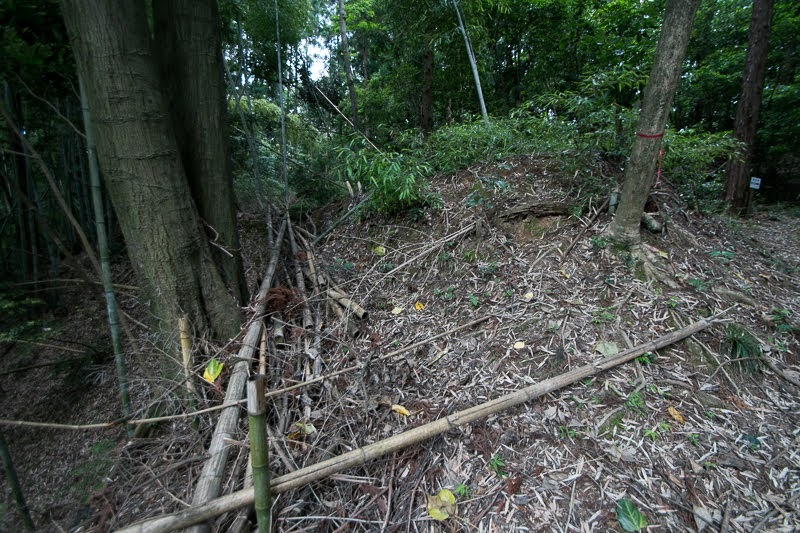 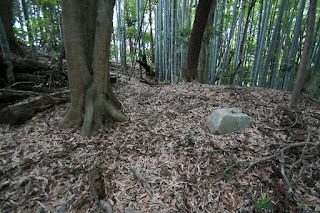 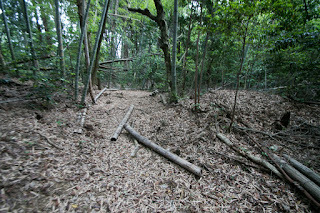 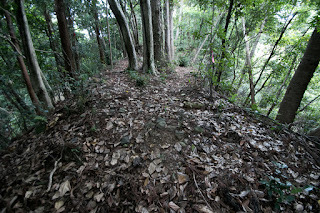 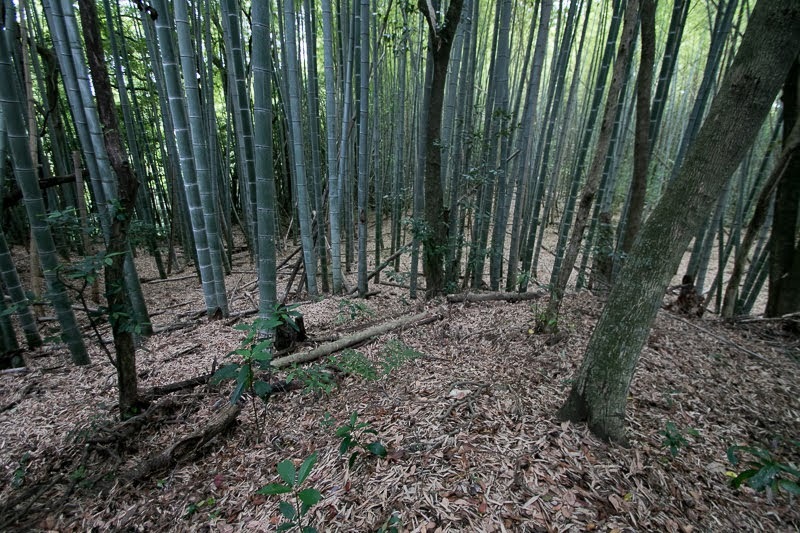 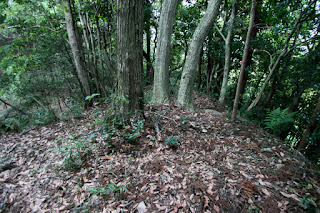 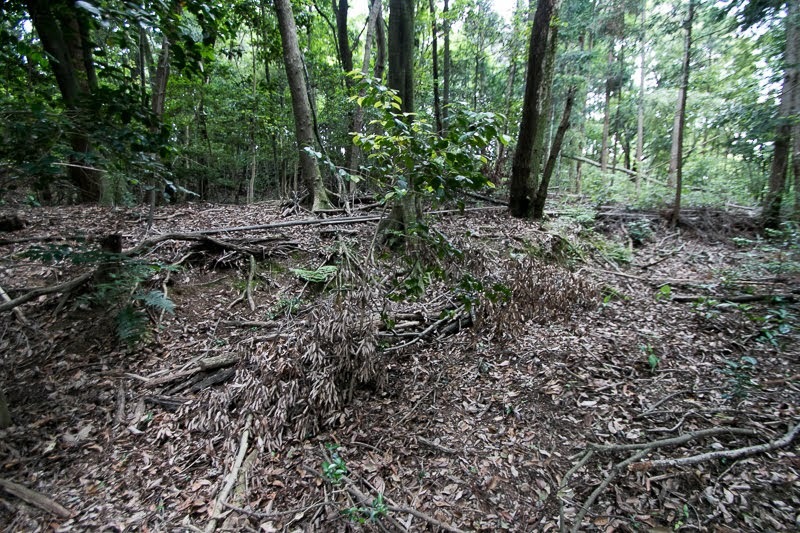 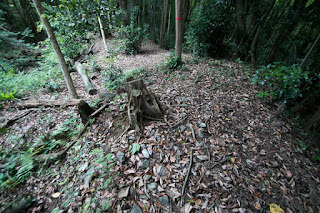 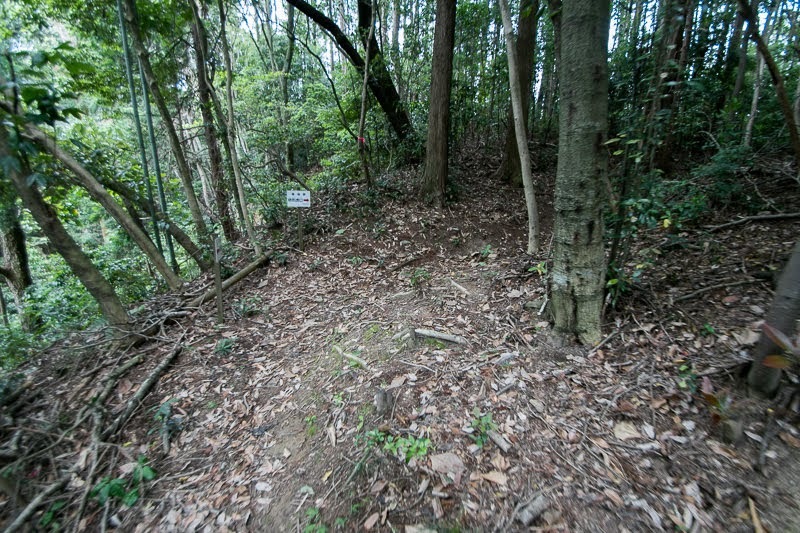 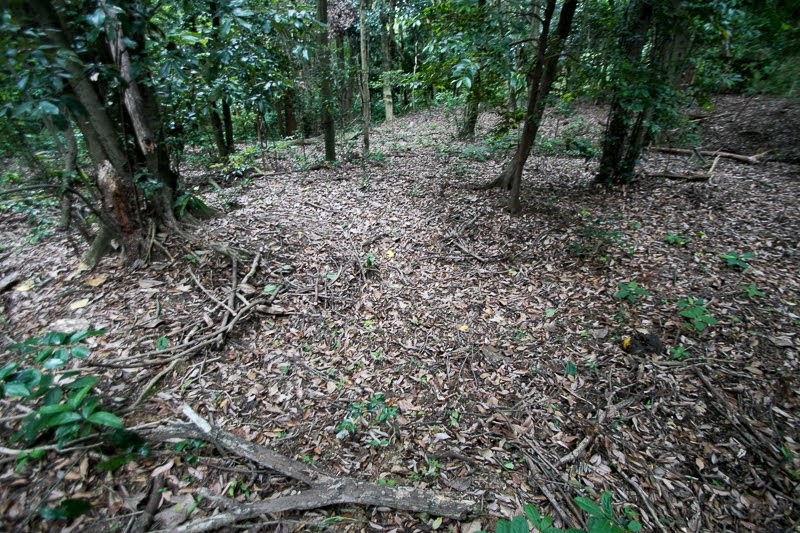 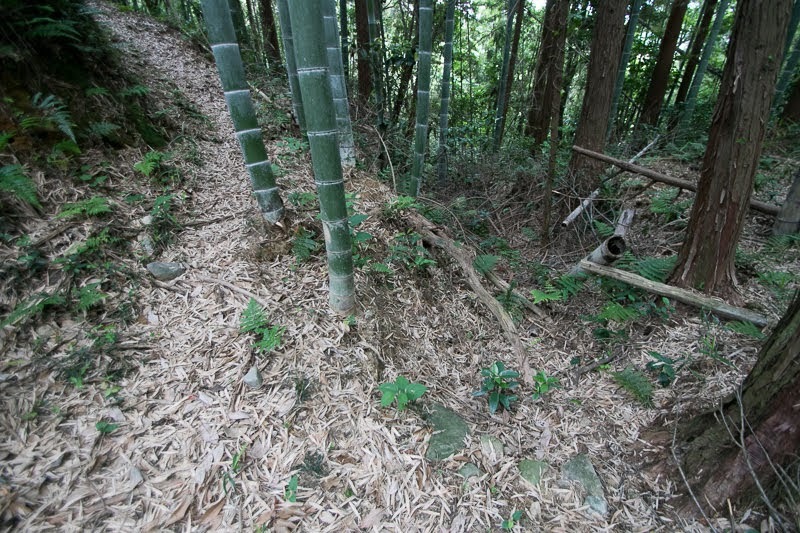 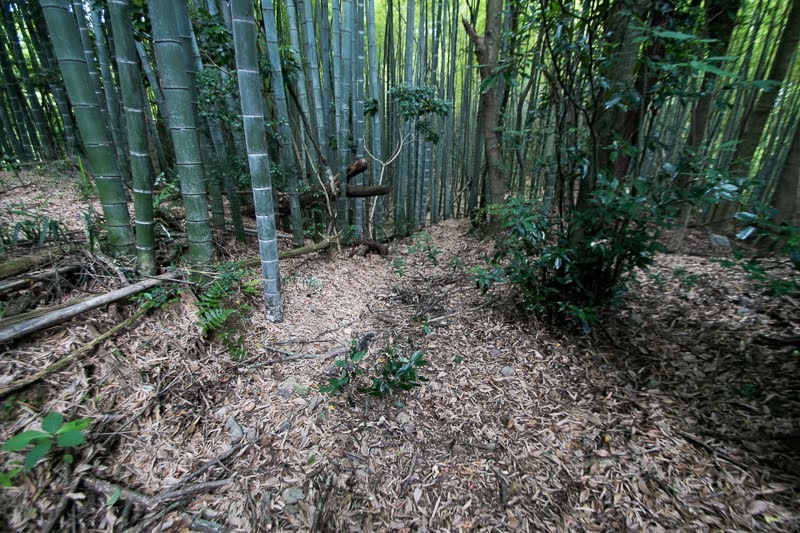 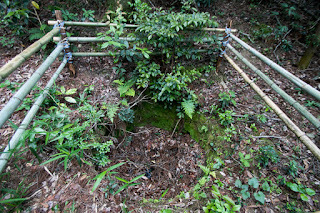 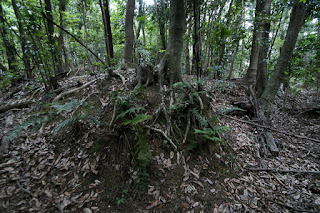 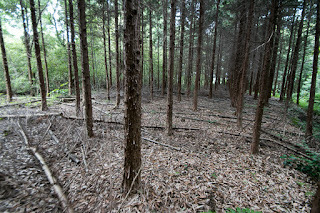 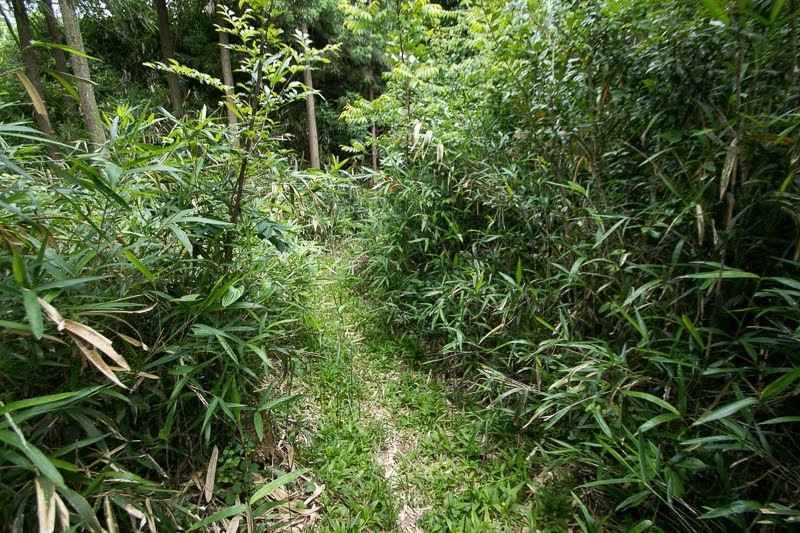 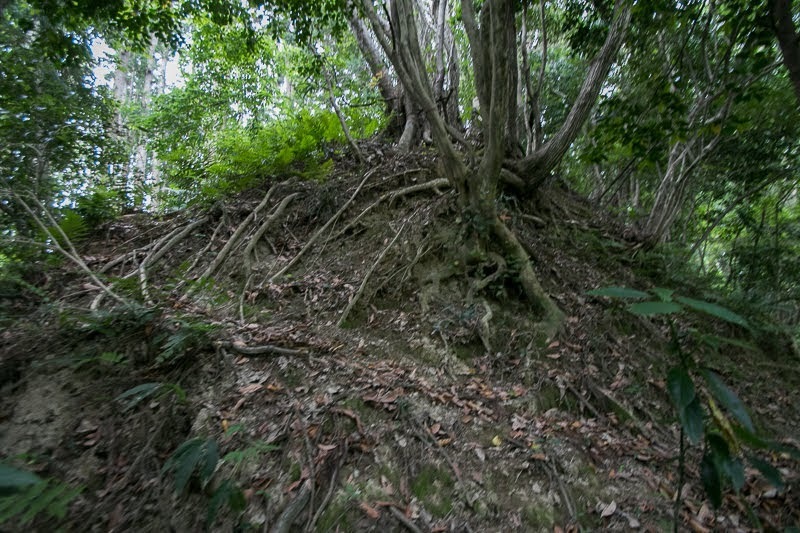 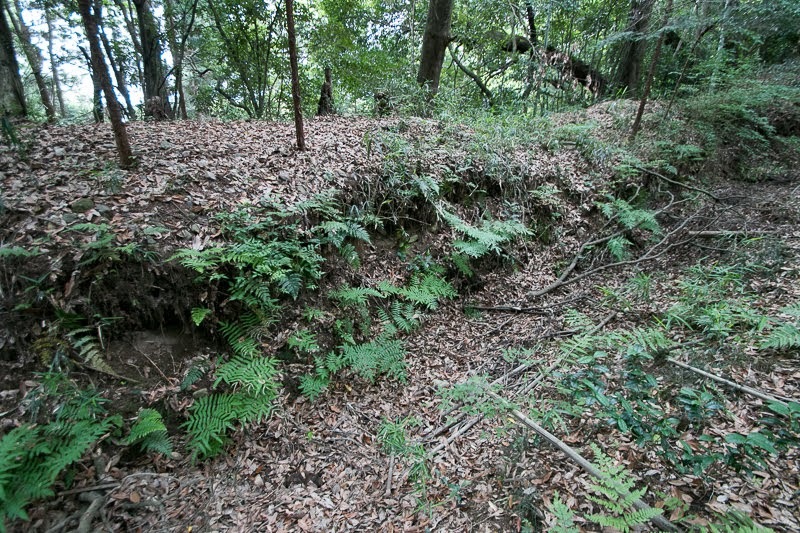 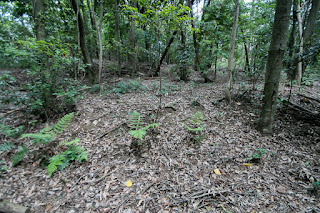 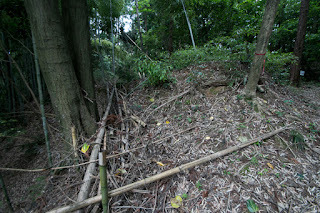 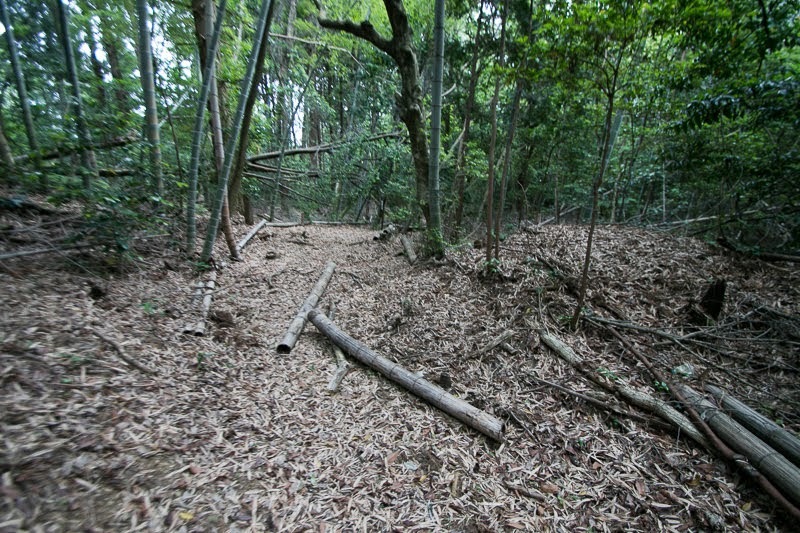 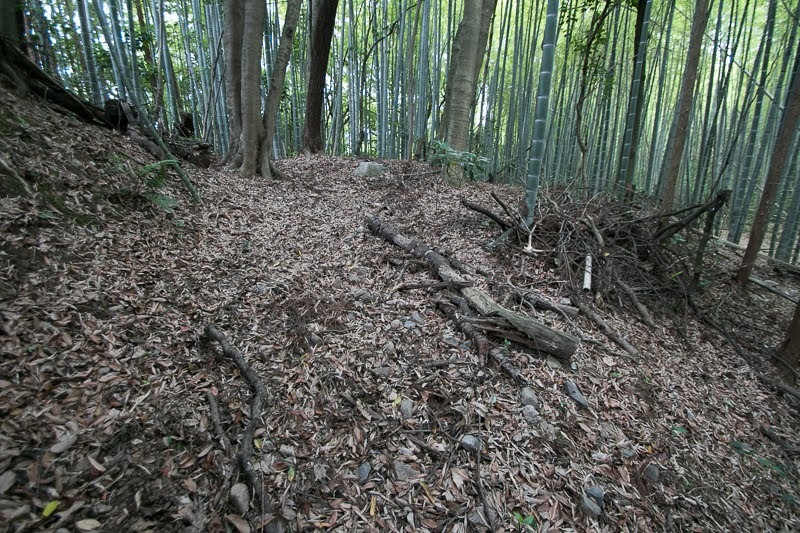 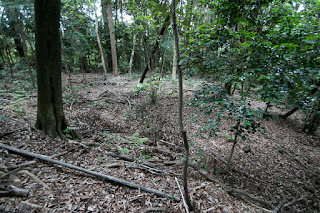 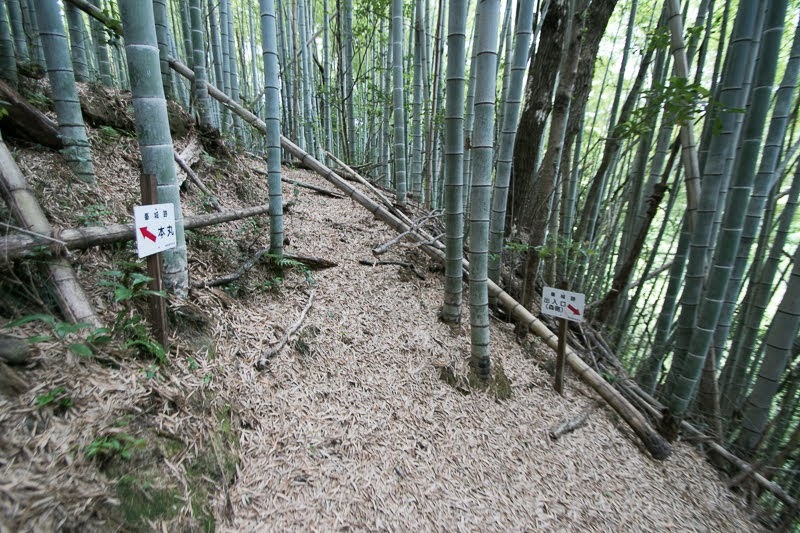 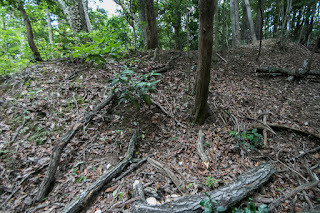 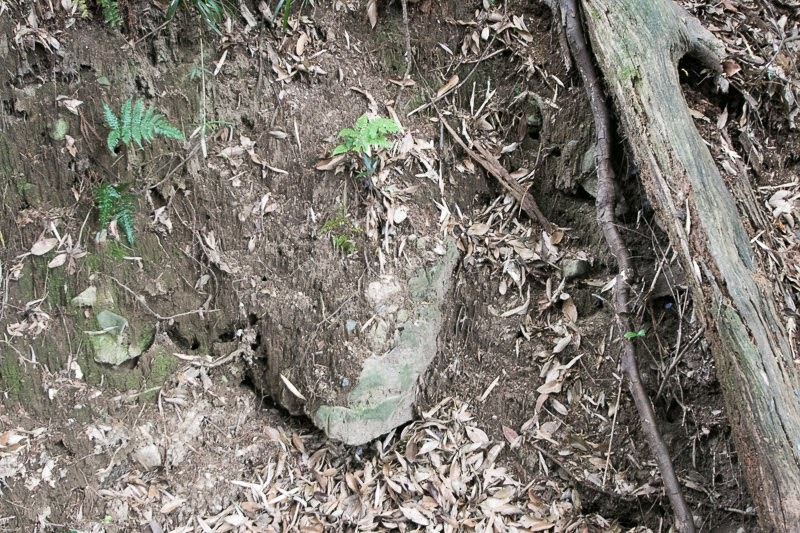 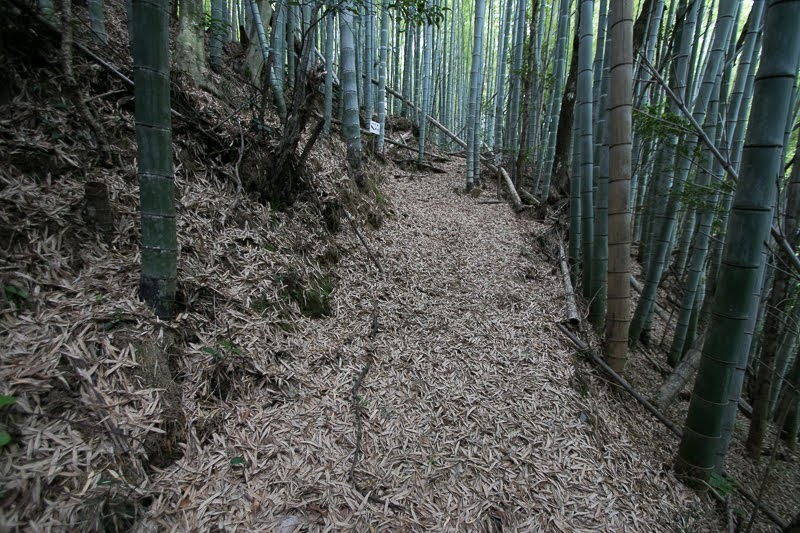 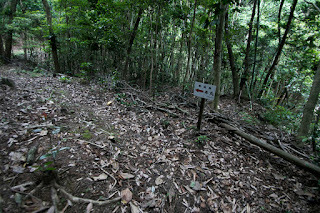 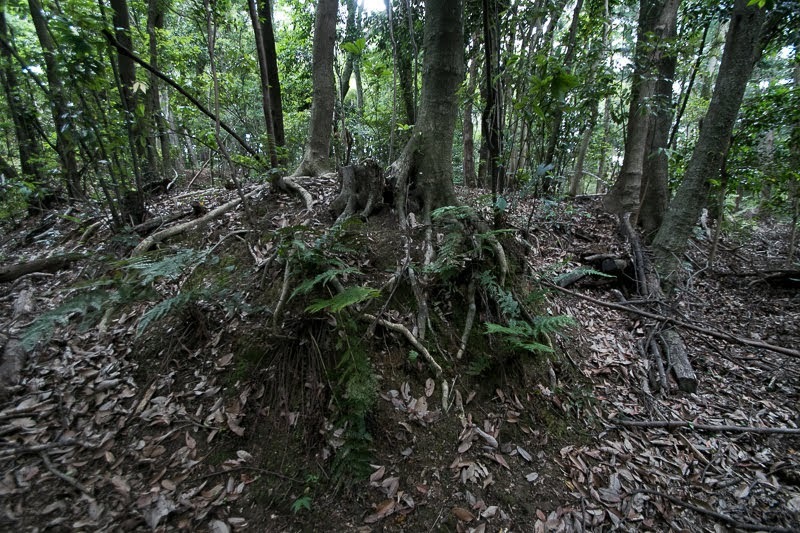 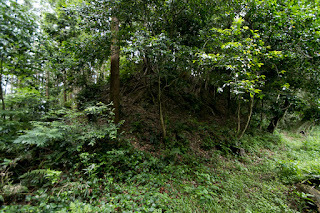 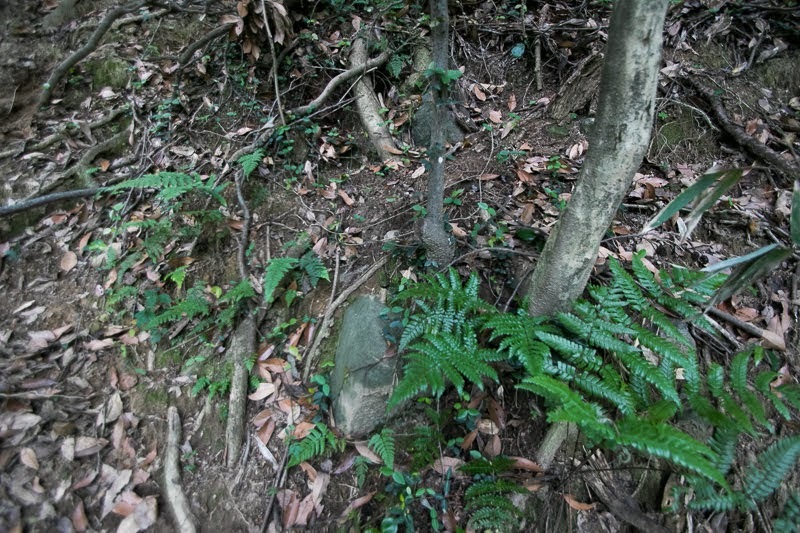 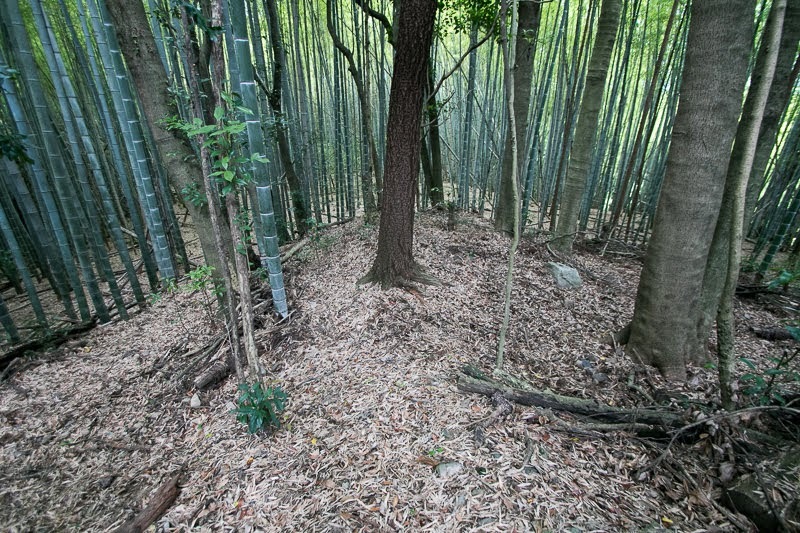 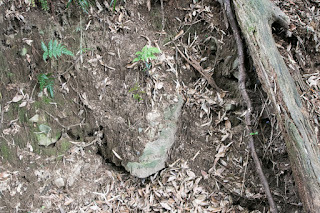 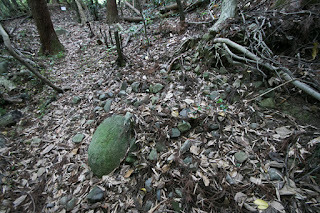 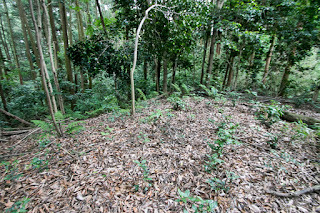 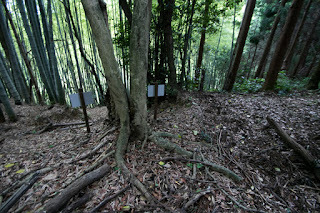 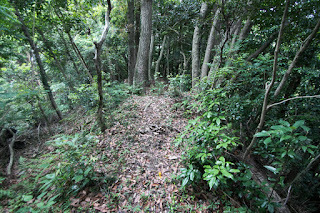 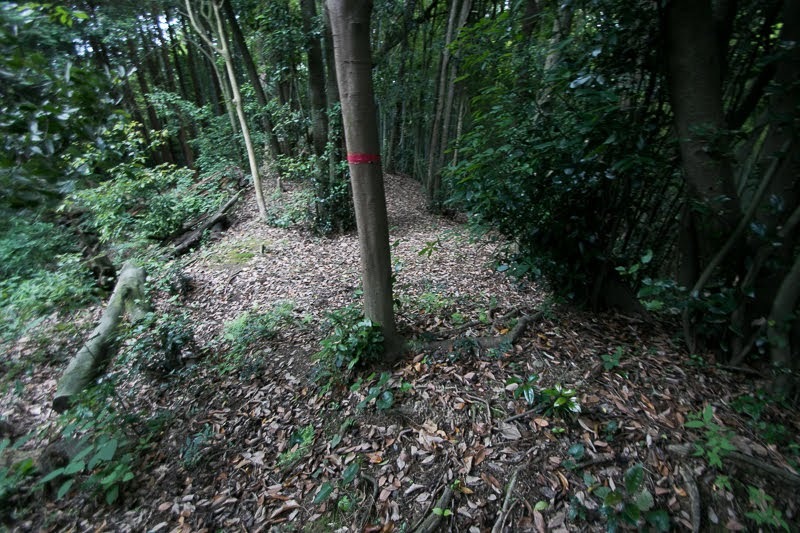 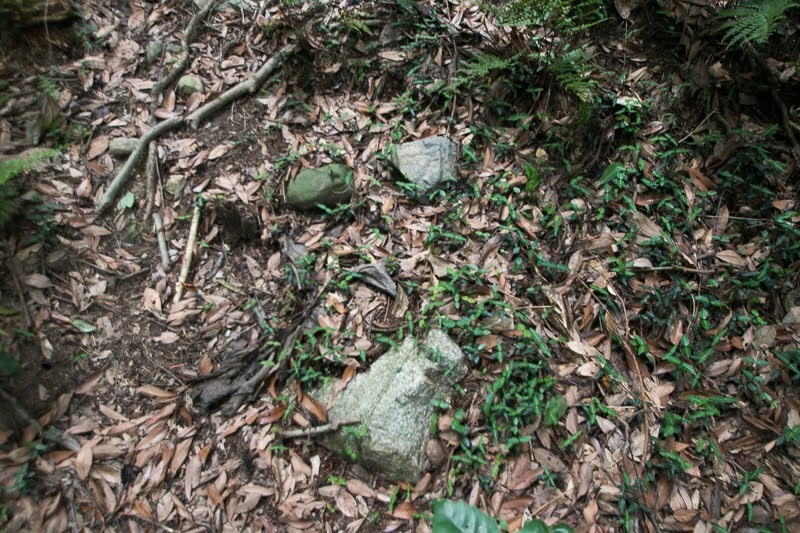 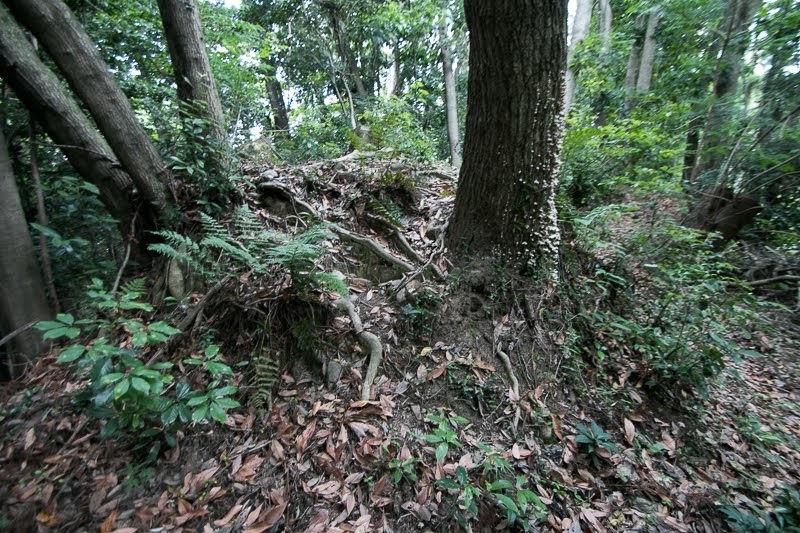 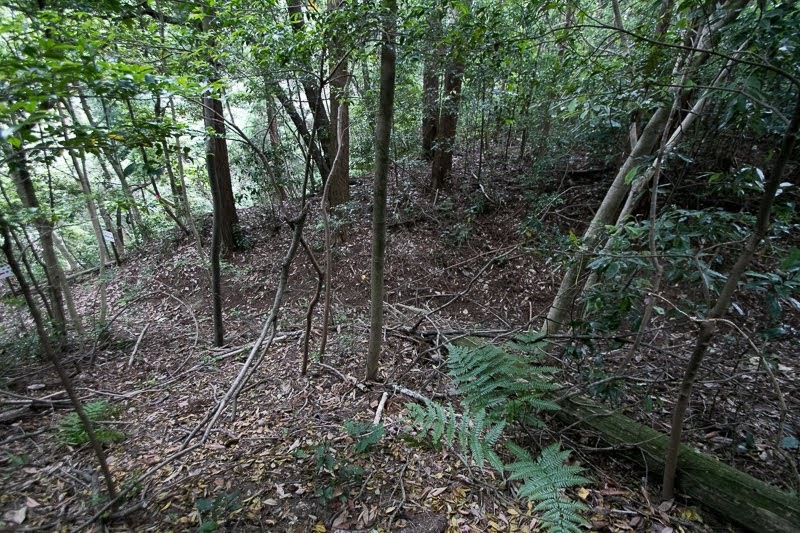 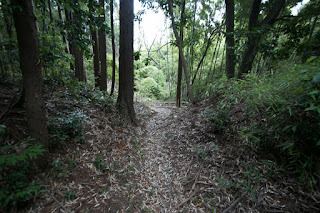 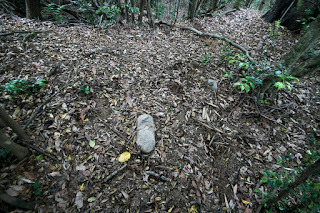 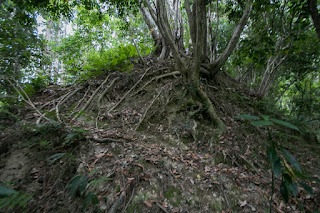 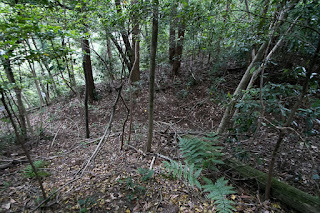 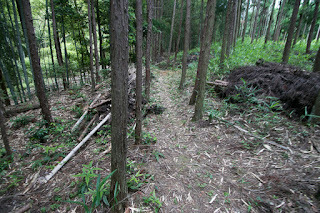 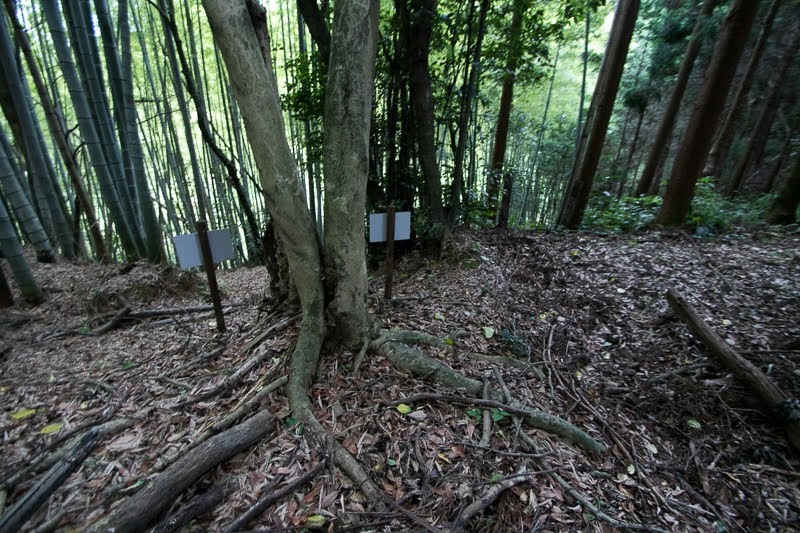 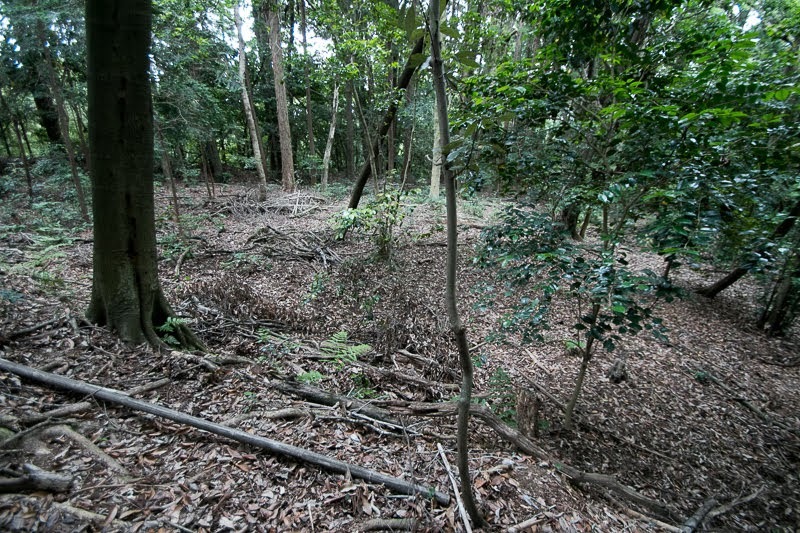 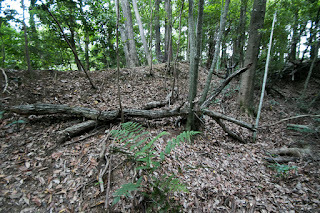 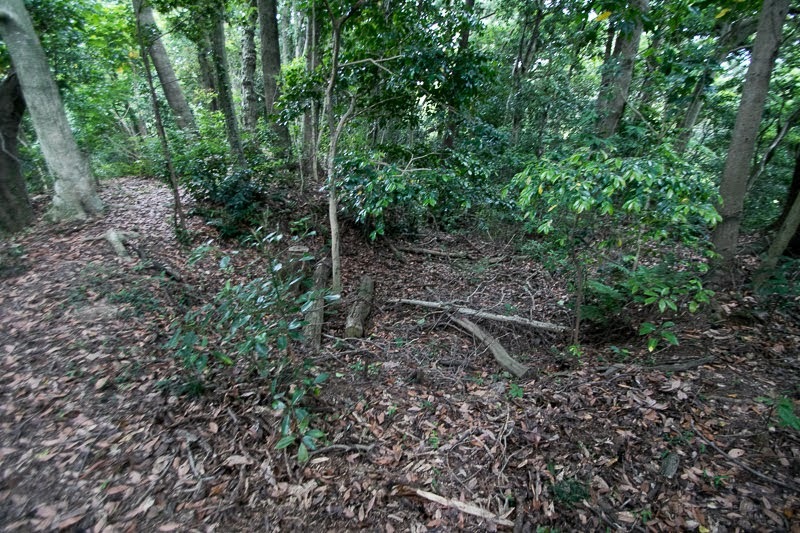 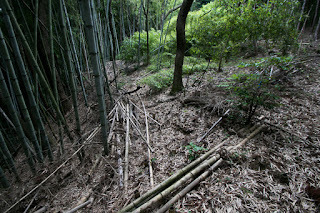 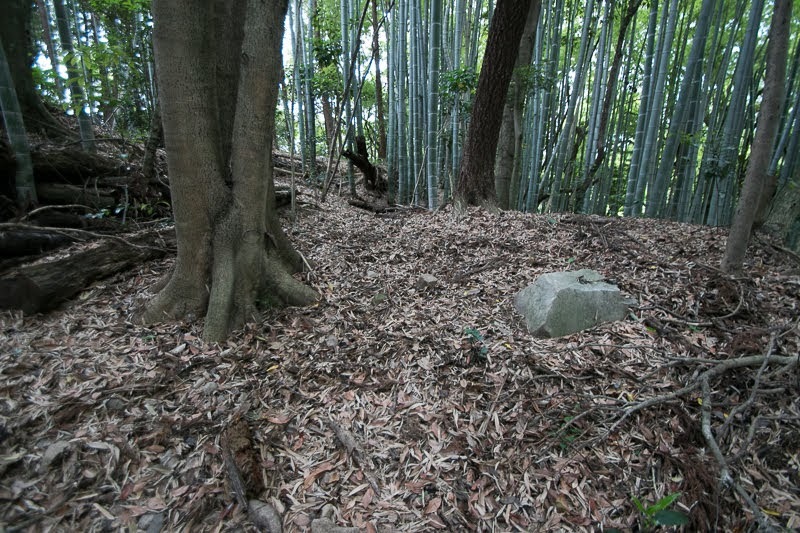 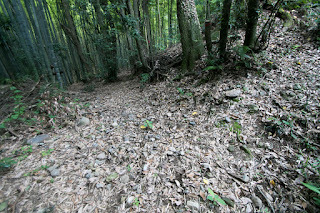 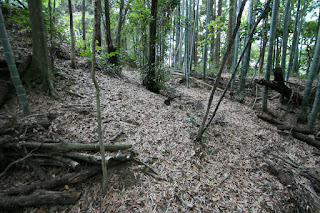 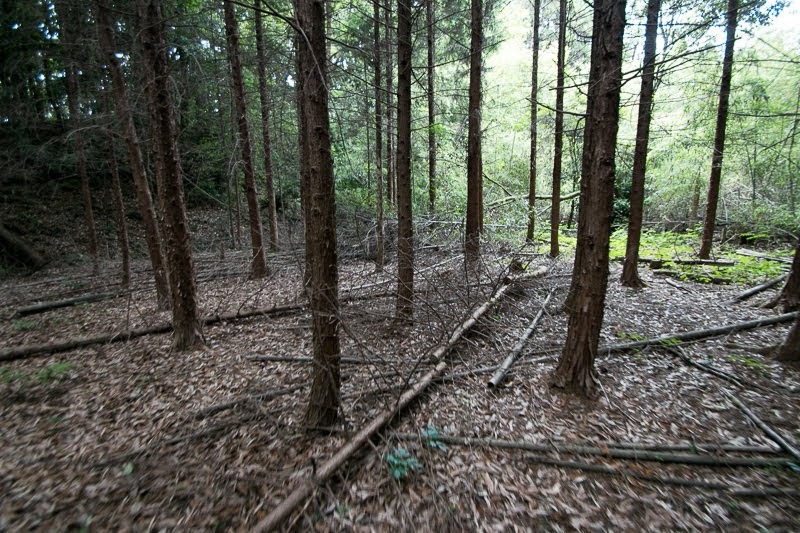 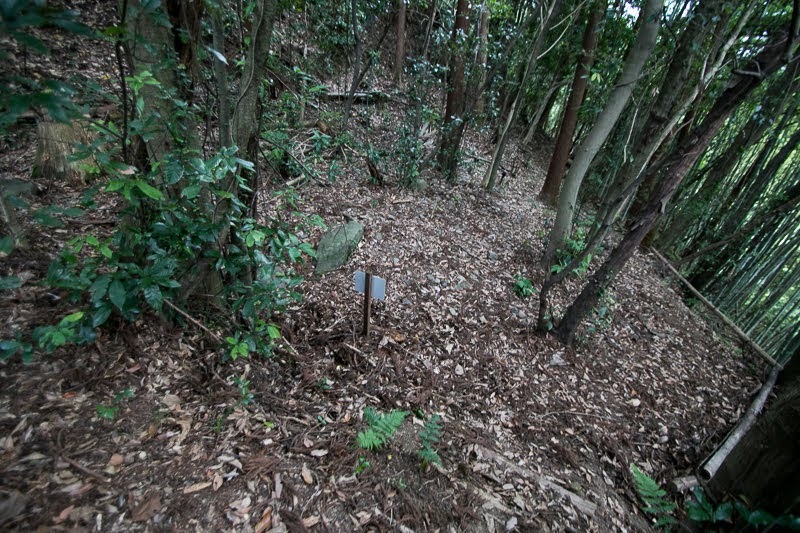 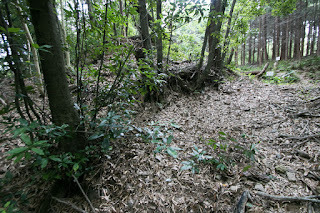 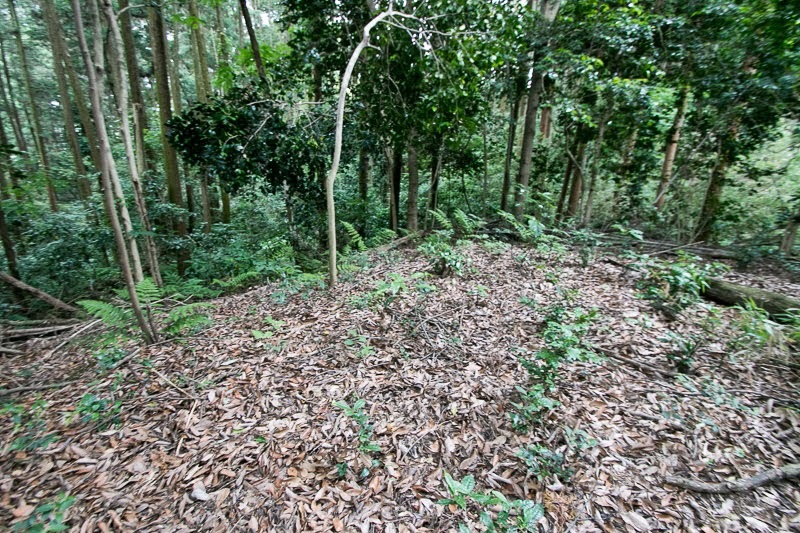 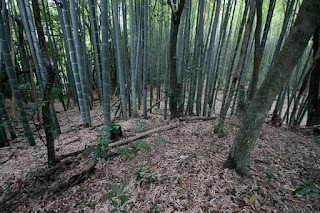 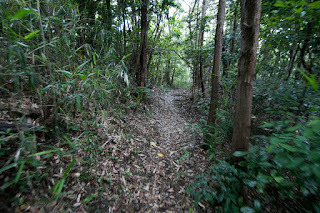 Today no building is left but the structure of the castle well remain in the bamboo forest. Huge clay walls and stone walls unfamiliar to the quiet local town shows the importance of Mine castle to connect or cut off the connection of the area. 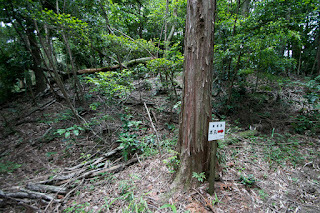 It was as if a critical point of Go game in which both side struggle for making or cutting connecting line to hold their own territory. 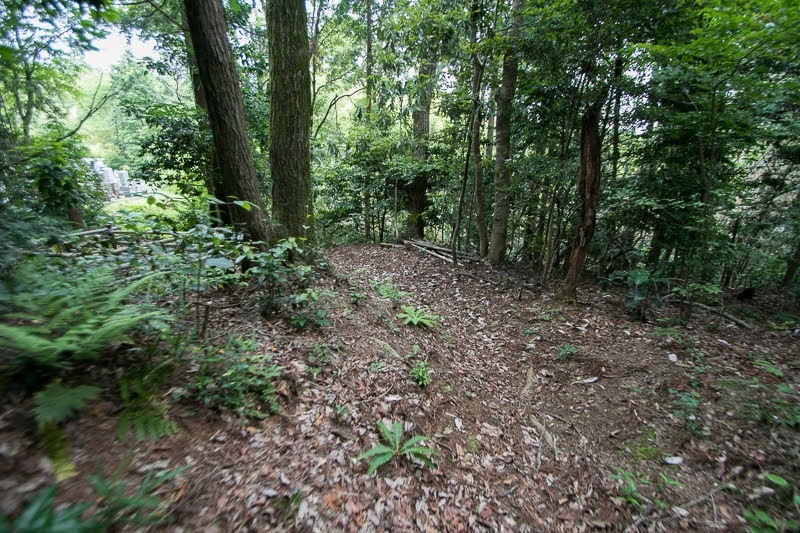 60 minutes walk from JR Central Kansai-Honsen line Idagawa station. 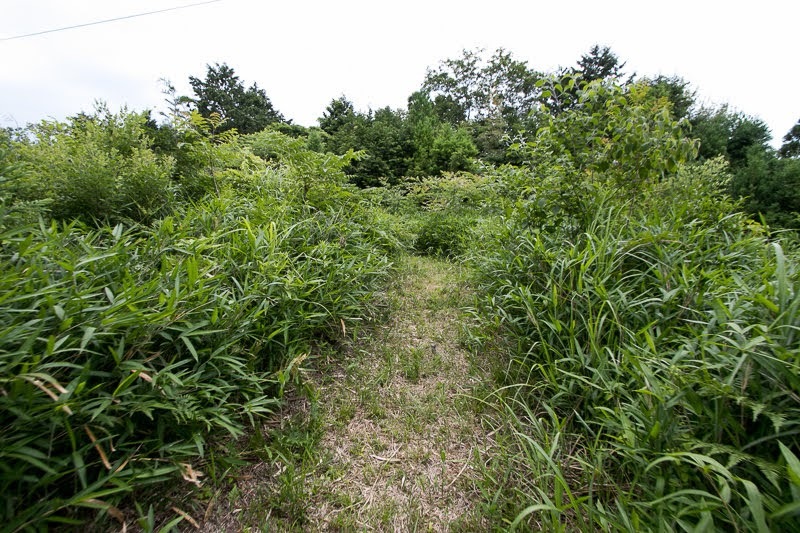 30 minutes drive from Higashi-Meihan Jidoshado Expressway Kameyama interchange.